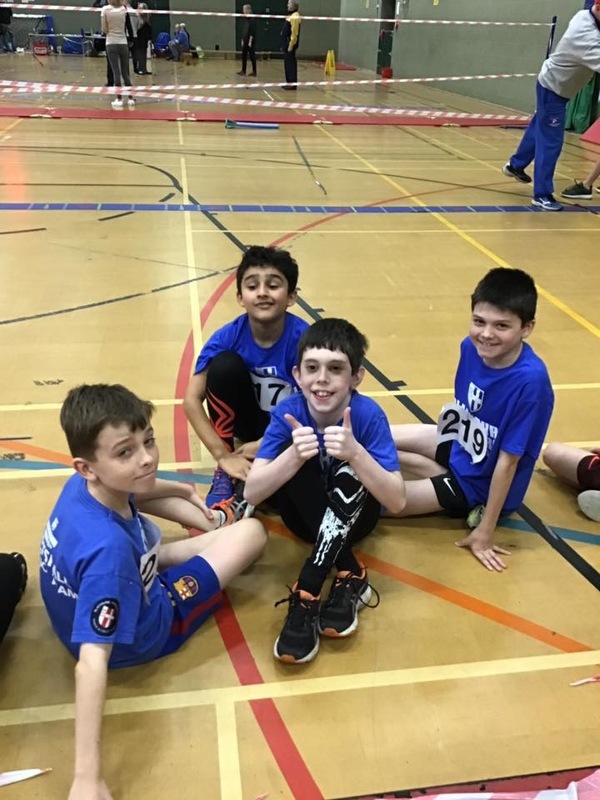 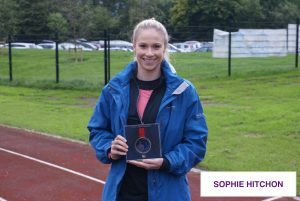 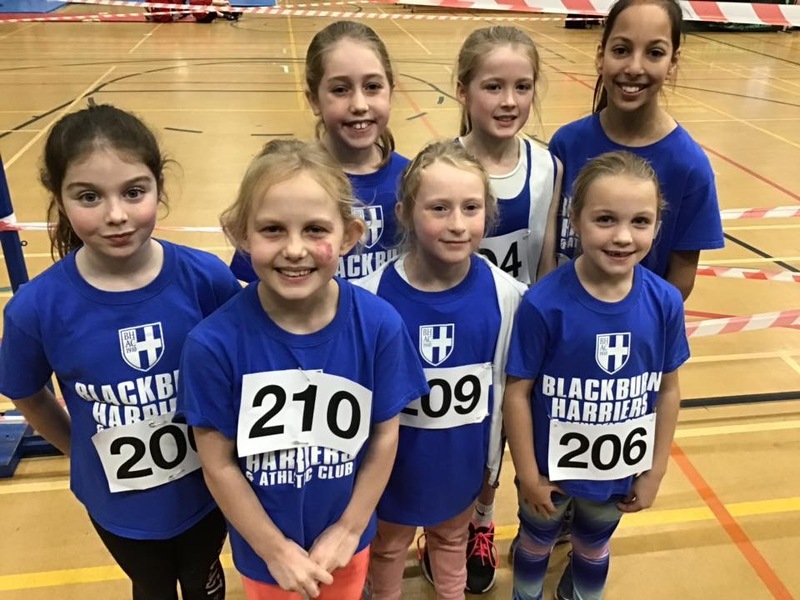 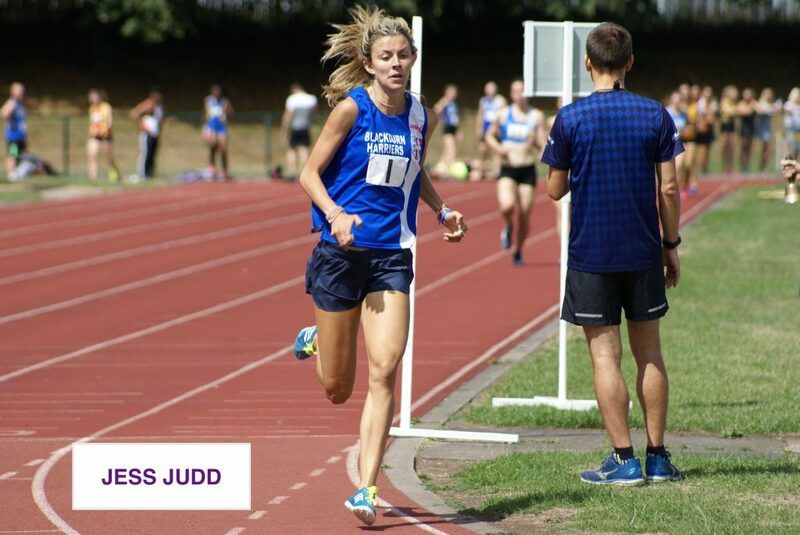 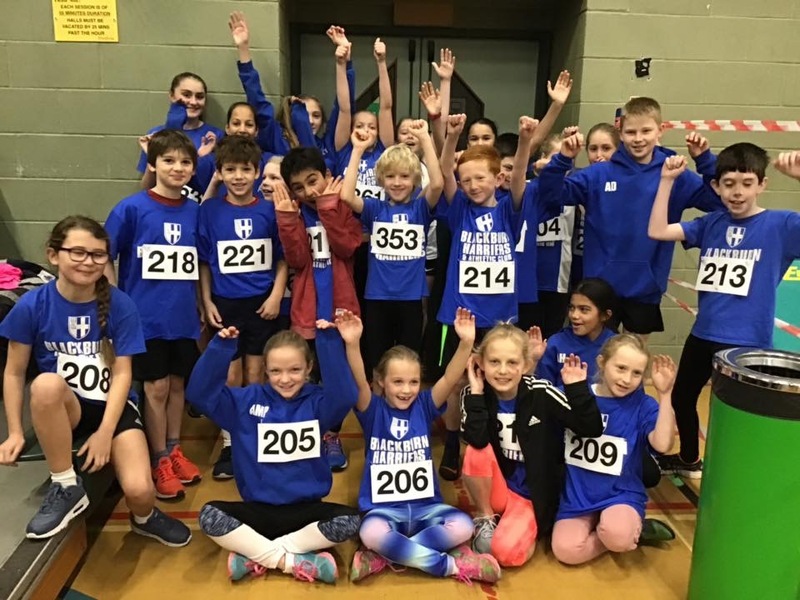 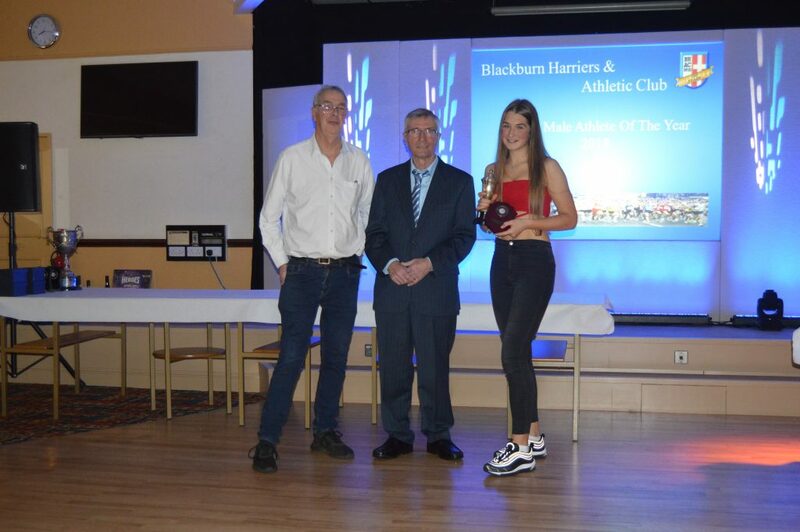 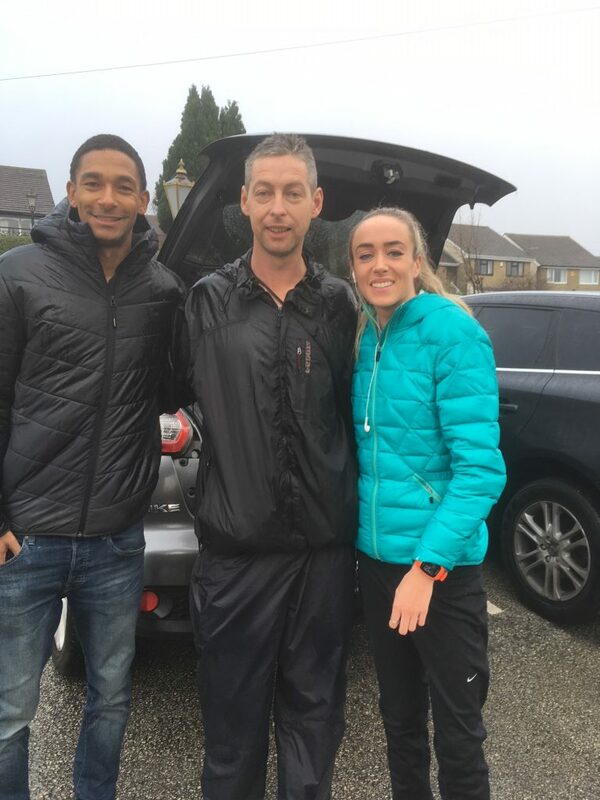 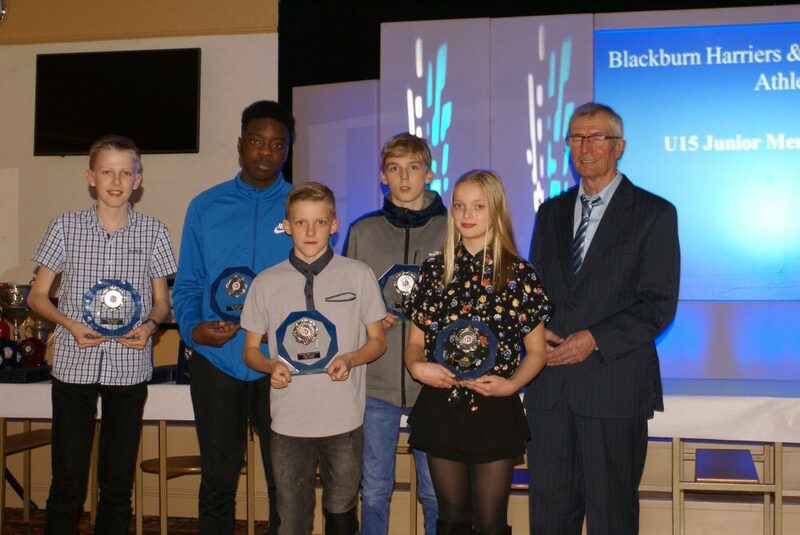 The second fixture in this years Indoor Series at Sportscity took place on Sunday with a number of Blackburn Harriers athletes involved in the action, setting four new personal bests between them. 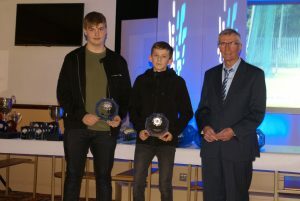 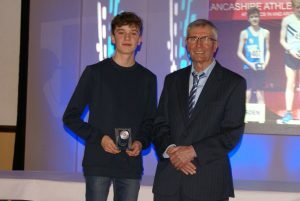 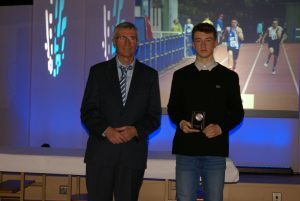 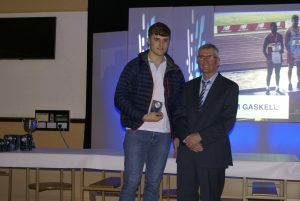 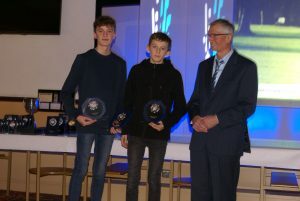 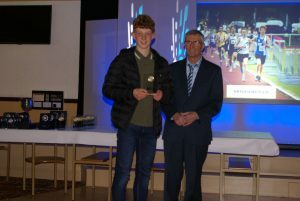 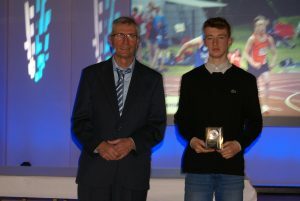 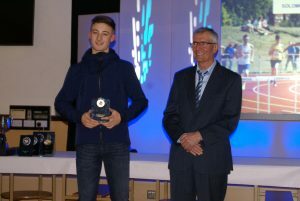 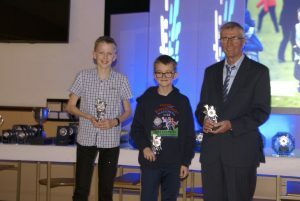 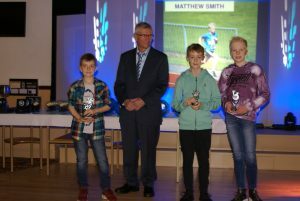 U15 Hayden Mercer was running his first ever race Indoors and chose the 600m where he was up against another athlete – Thomas Manton – who was three seconds faster than him over 800m this year. 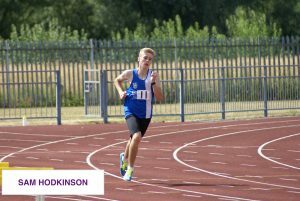 Hayden closed that gap coming just three one hundreths behind him to place 2nd in a debut time of 1.34.44. 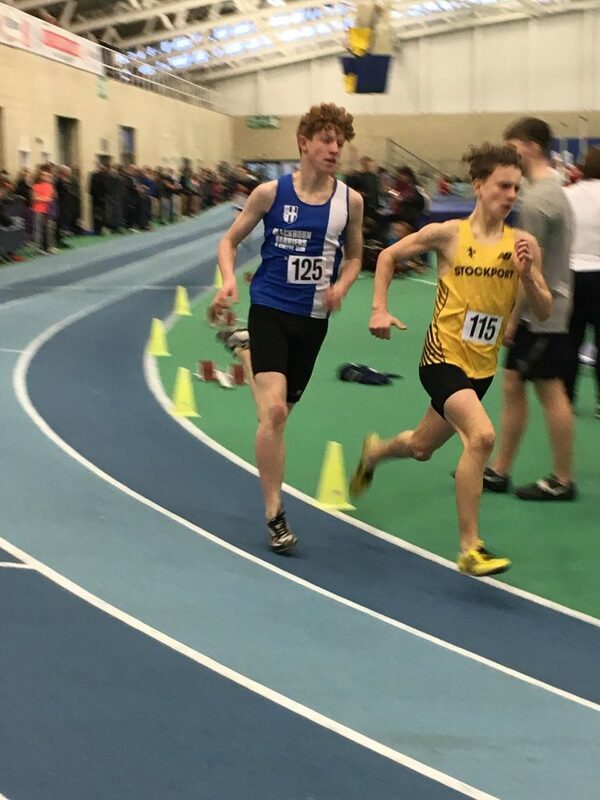 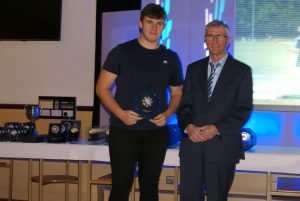 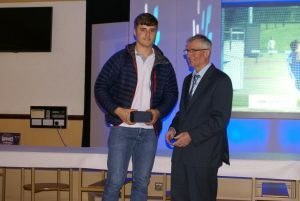 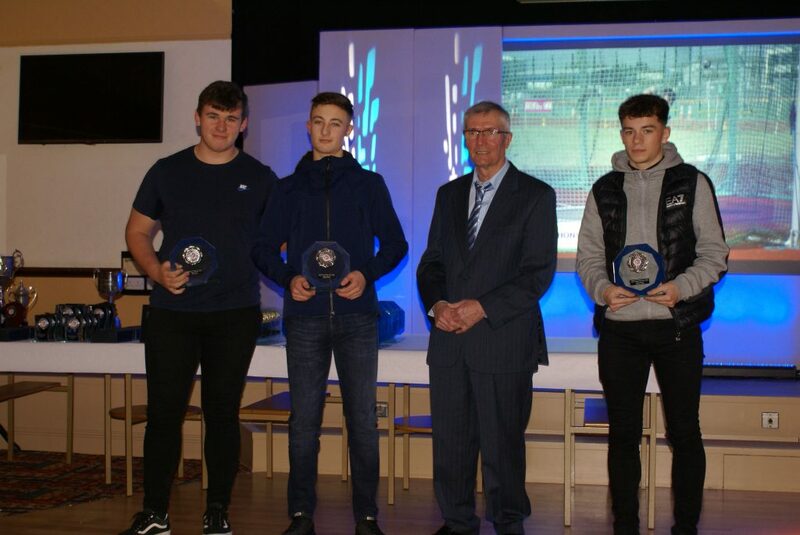 Ben Whittaker in his first year as an U20 started off in terrific style, winning his 60m Race in a time of 7.77 which was a new PB by three tenths – going into the race, five of the other six competitors all had better personal best times than Ben which makes his run even better. 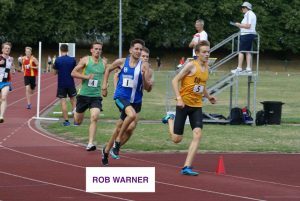 Brother George Whittaker – contesting the U15 Boys 300m – placed 3rd in a time of 43.30 which was a big 3.7sec PB from last year when he posted a best time of 47.00. 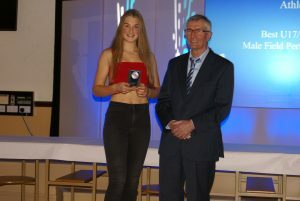 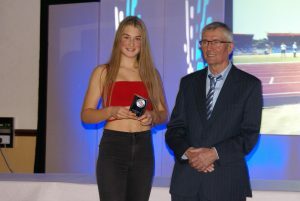 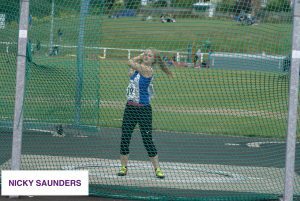 Myah Booth who moves up to U17 this year took on the 60m Hurdles and Shot Putt. 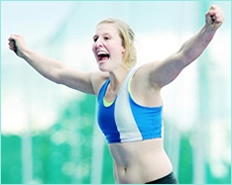 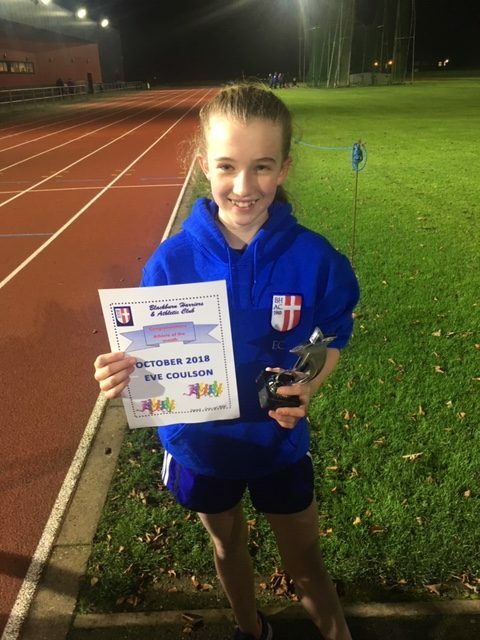 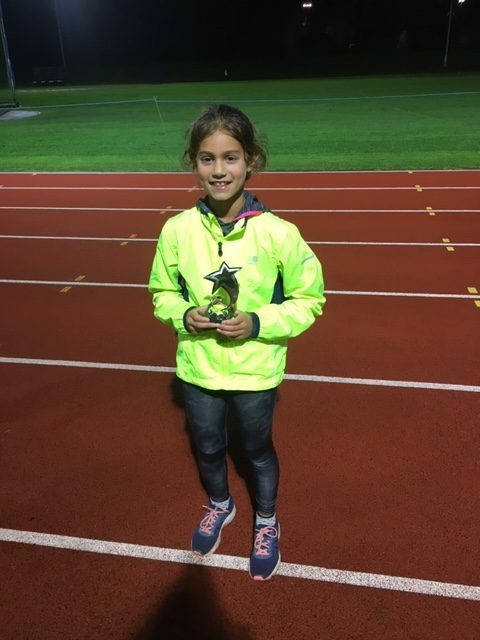 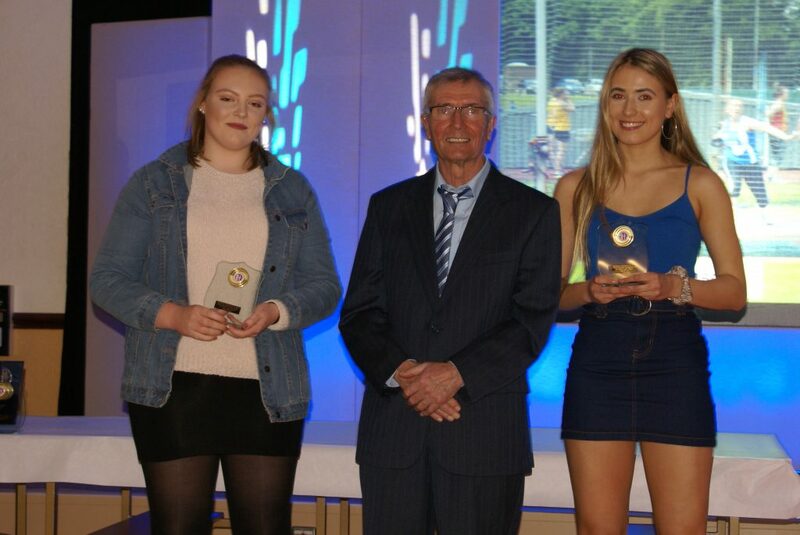 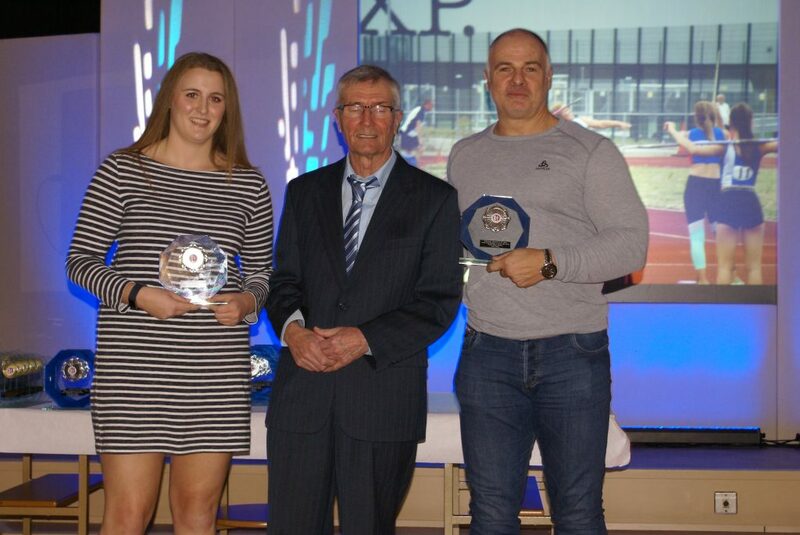 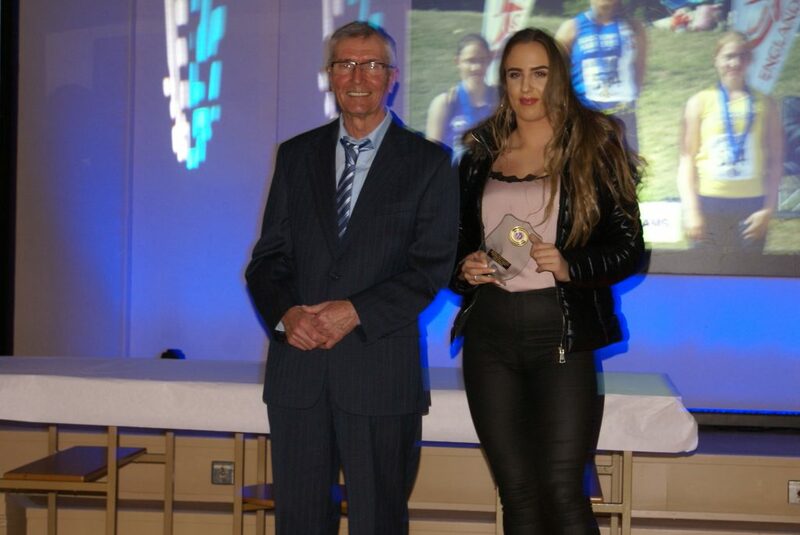 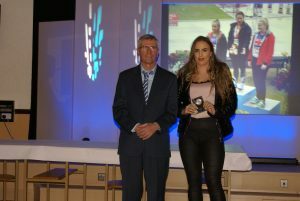 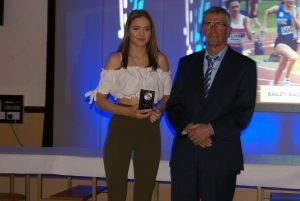 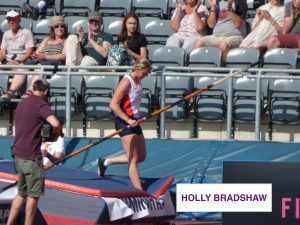 She finished 2nd in the 60m Hurdles in a time of 9.26 – an improvement of three tenths for a new PB and then placed 3rd out of eleven competitors in the Shot Putt with a throw of 10.20m. 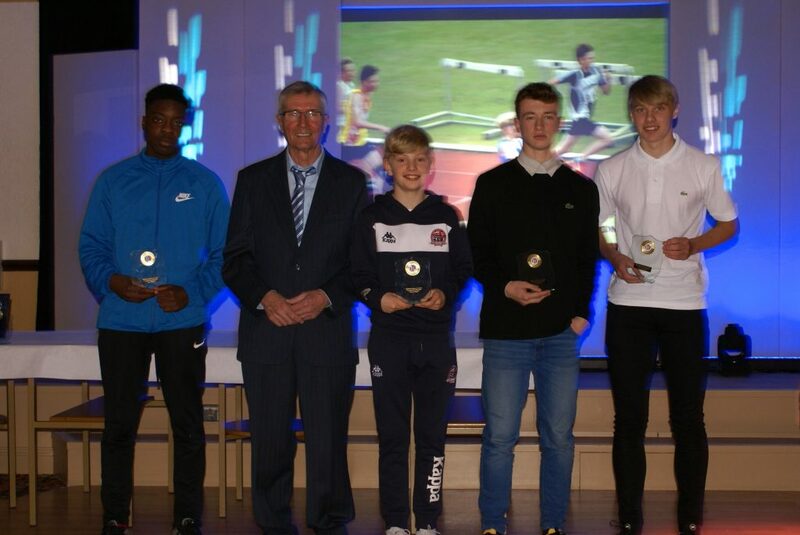 There were only two competitors in the U15 Boys 60m Hurdles – both of them Blackburn Harriers. 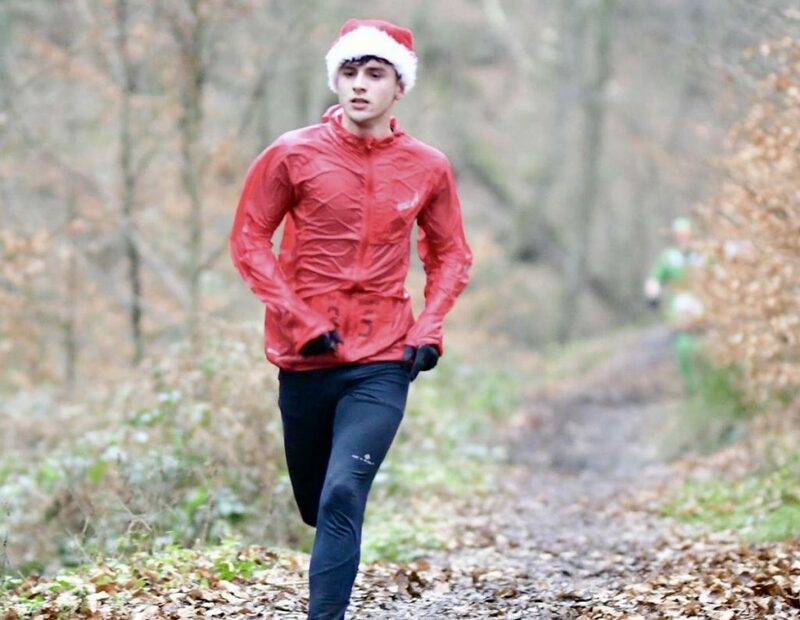 Jayden Brammer crossed the line in 1st place with a time of 8.99 to set a new PB by three tenths, his previous best being 9.29 at the first fixture in the Series on December 2nd. 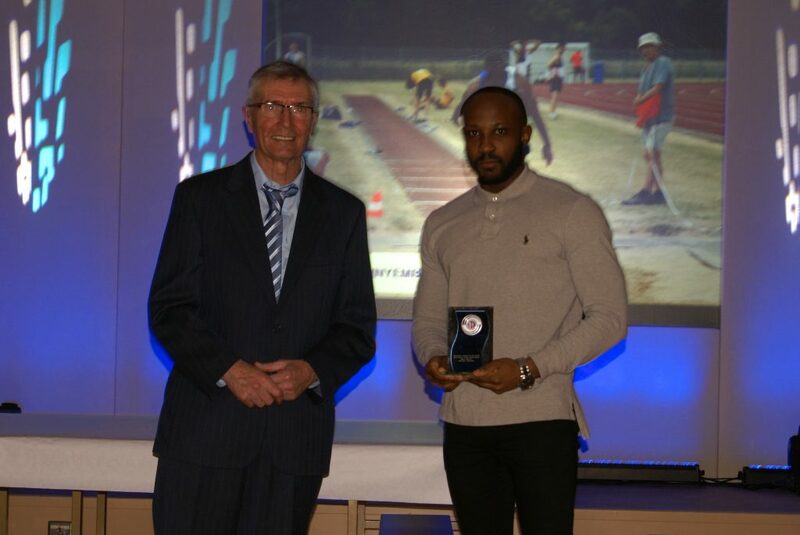 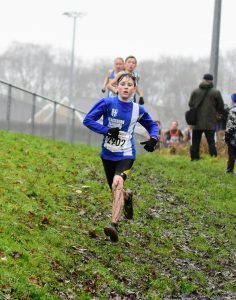 Ben Boocock took second spot also with a new PB as he clocked 9.56 – running 9.57 in the December 2nd fixture. 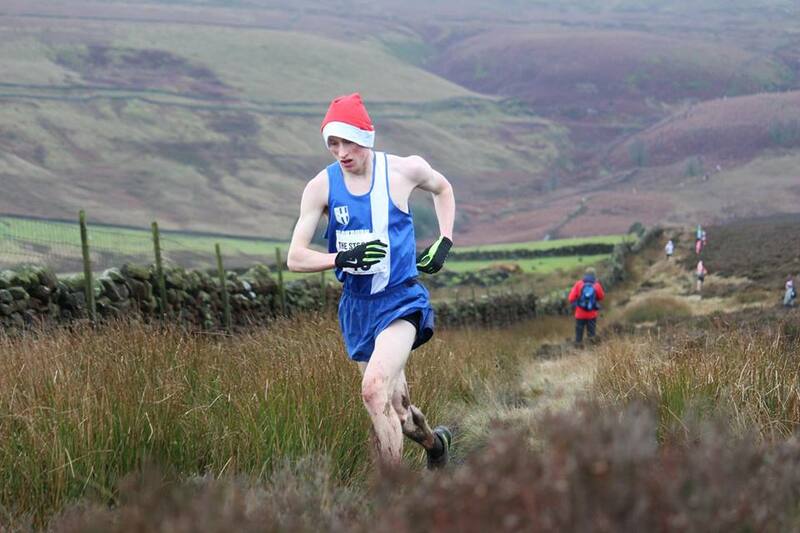 U20 Thomas Marchant was back on the Fells racing at Stoop, his last outing being at the British Fell and Hill Relay Championships (Grasmere) back in October. 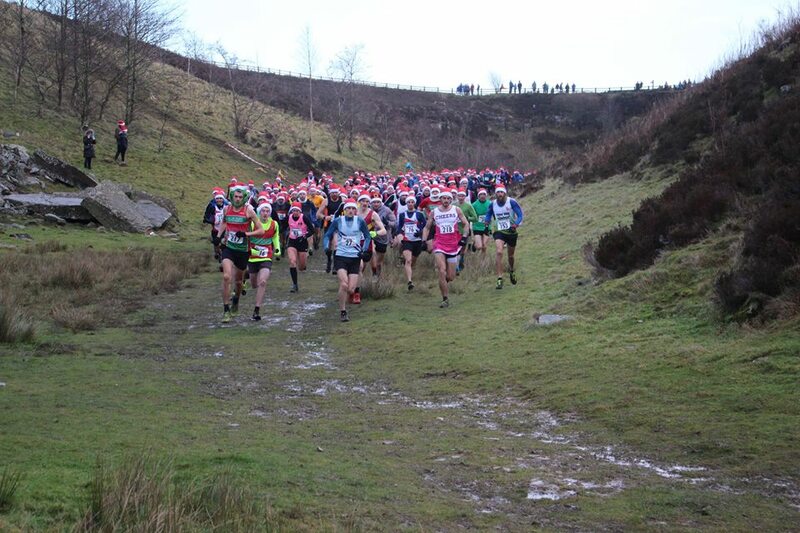 This Race covers 8km and 250m of ascent with 209 runners on the start line. 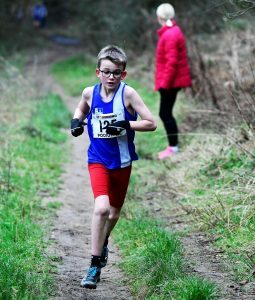 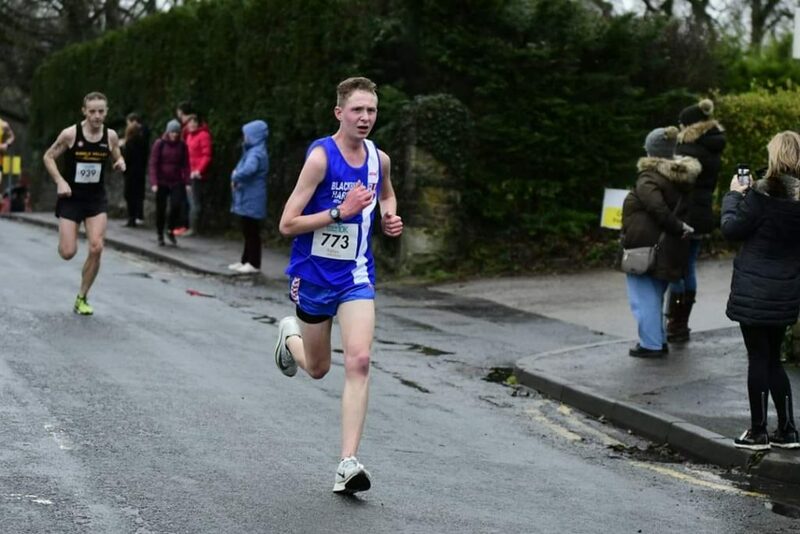 Tom had a very good run coming across the line in 13th place, clocking a time of 34.33 – the race ebing won by Jack Wood in 30.27, six seconds infront of 2nd placed Sam Tosh. 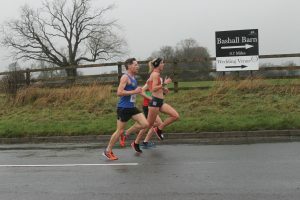 One hundred and six finishers in this race won by Tom Simpson in 40.11 and run in pretty appalling weather conditions. 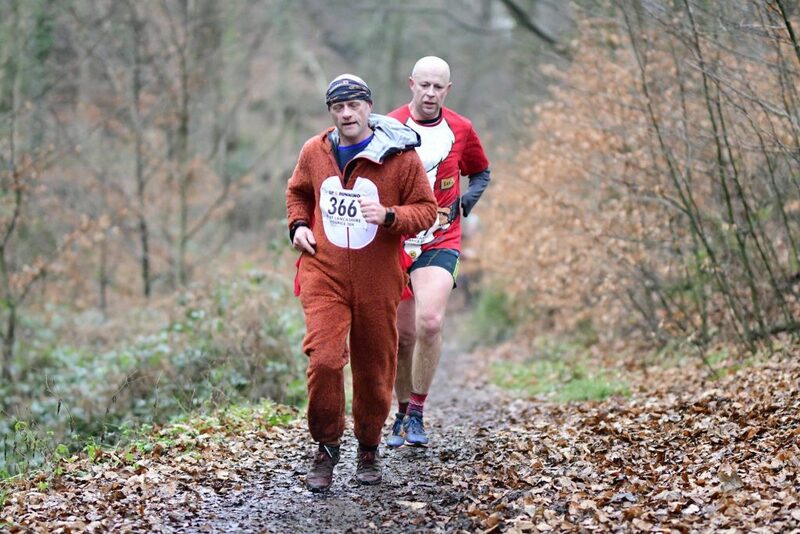 Round things and brass monkey could have been key words! 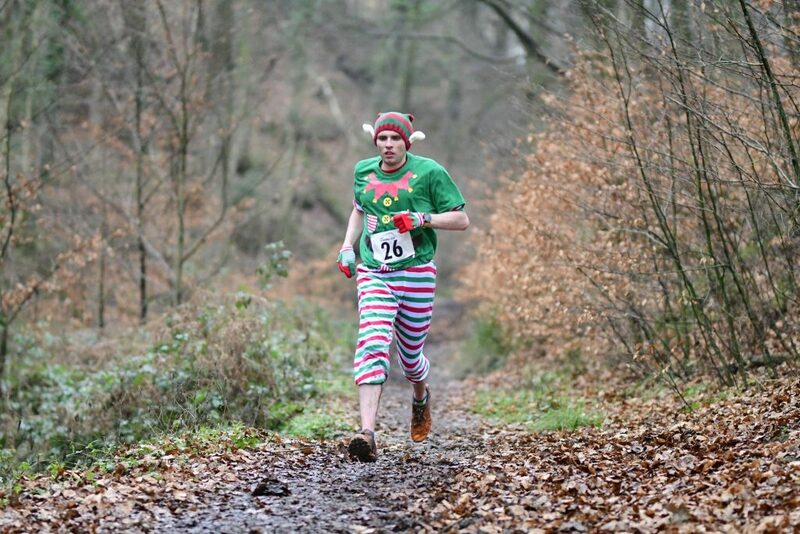 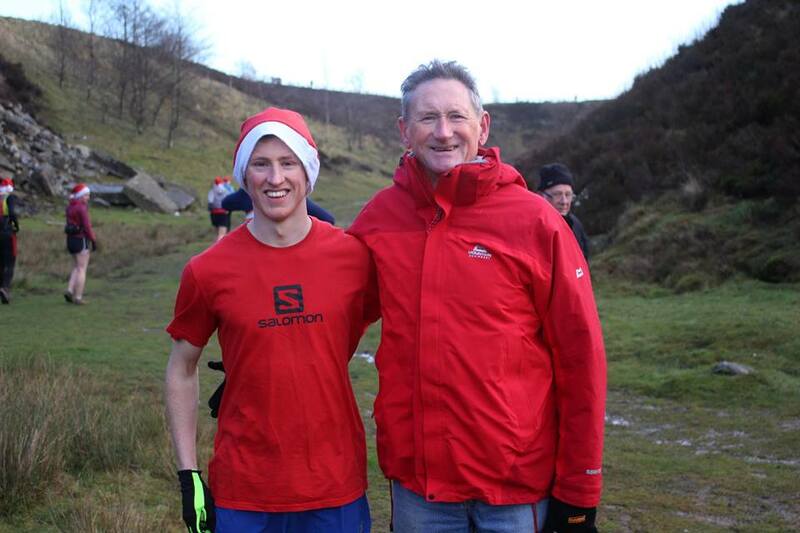 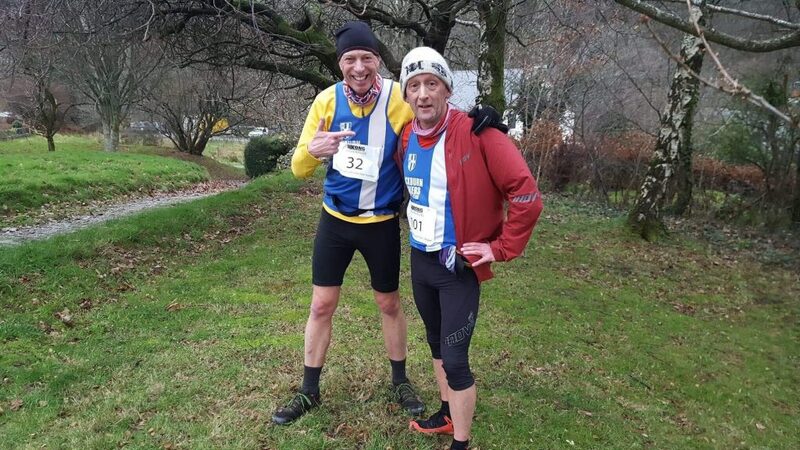 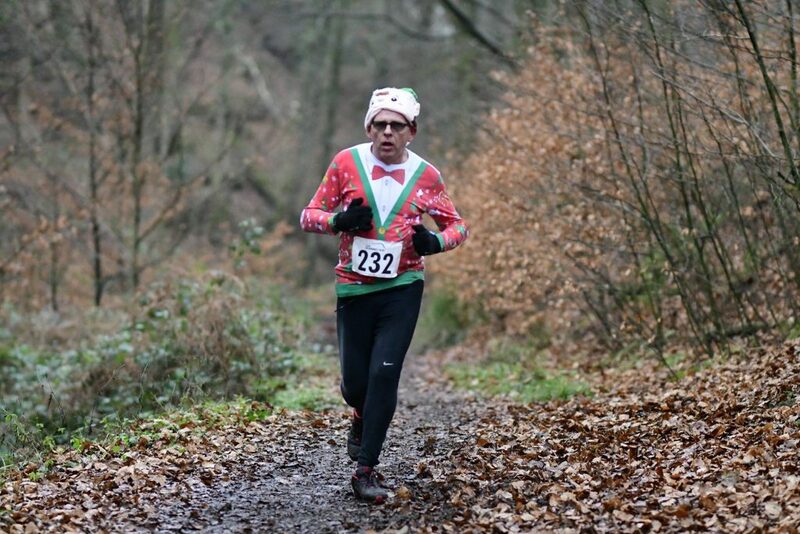 Ian Clarkson told us “John Orrell and myself were in action Saturday 15th December, taking part in the Kong Winter Fell Series, which is five races held over the winter in the Lake District. 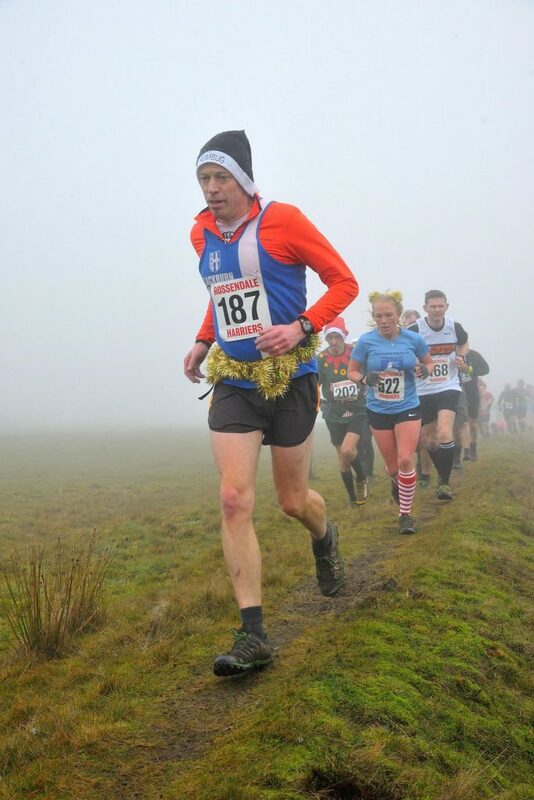 The S.O.B Fell Race (Stile End, Outerside, Barrow) 2nd Race in the series and our 1st. 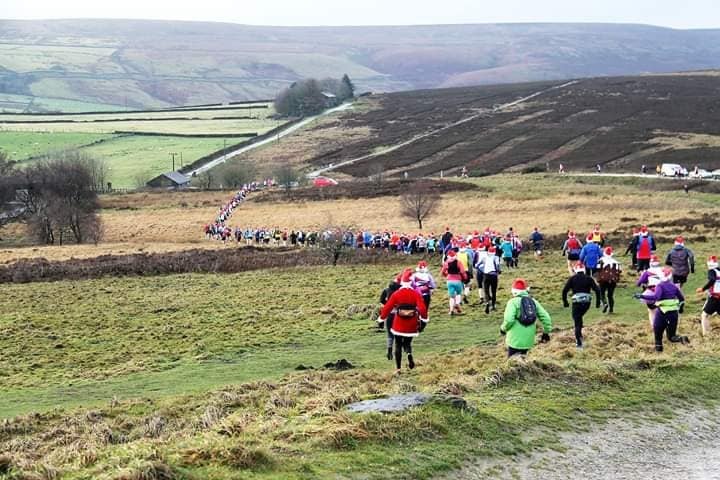 It is just under 5 miles with over 1600 feet of ascent on a very bitterly cold and windy day, perfect!! 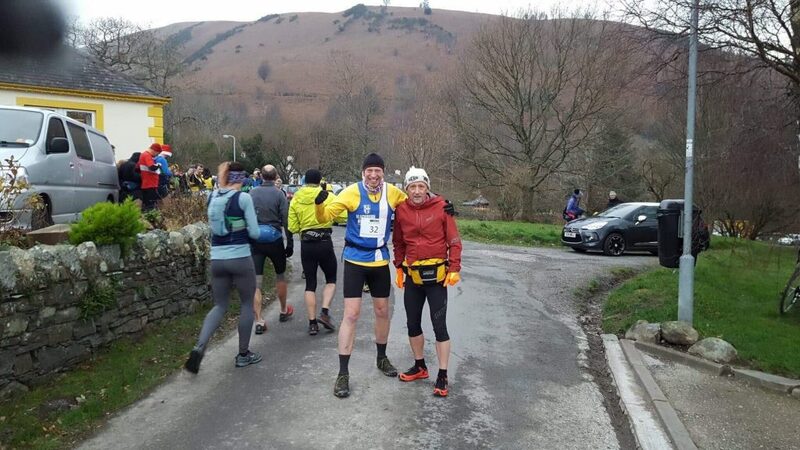 A nice steady start with a gradual climb that got a bit steeper and off John goes, onwards and upwards. 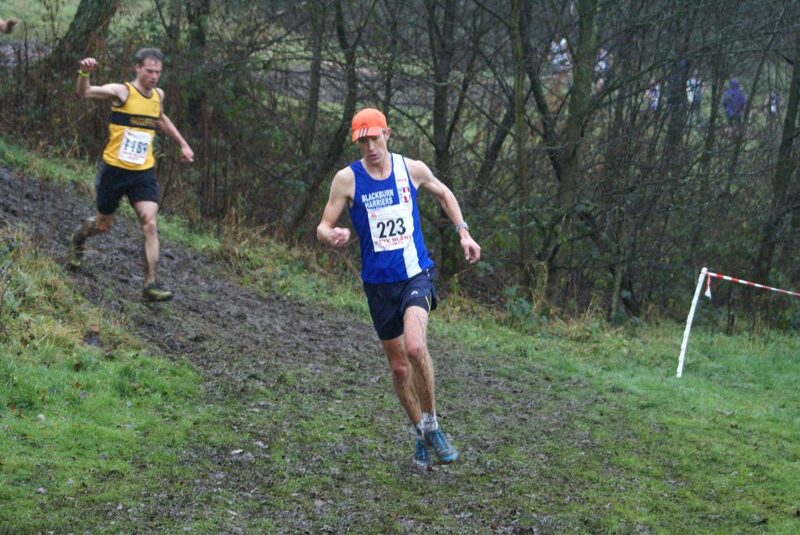 Stile End out of the way, then gingerly drop down and upwards to Outerside, with some good running up towards Barrow, where I catch a glimpse of John!! 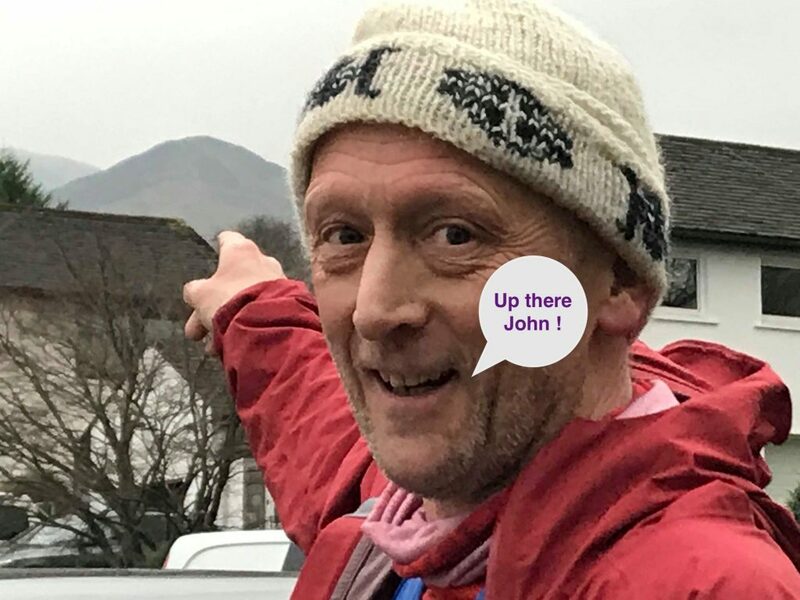 Barrow has a wonderful descent back down, time to go!! 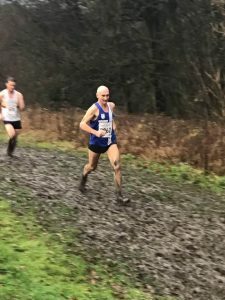 Catch up with John, leave John, deal with the sting in the tail, slight ascent through some woods, hit the tarmac and finish. 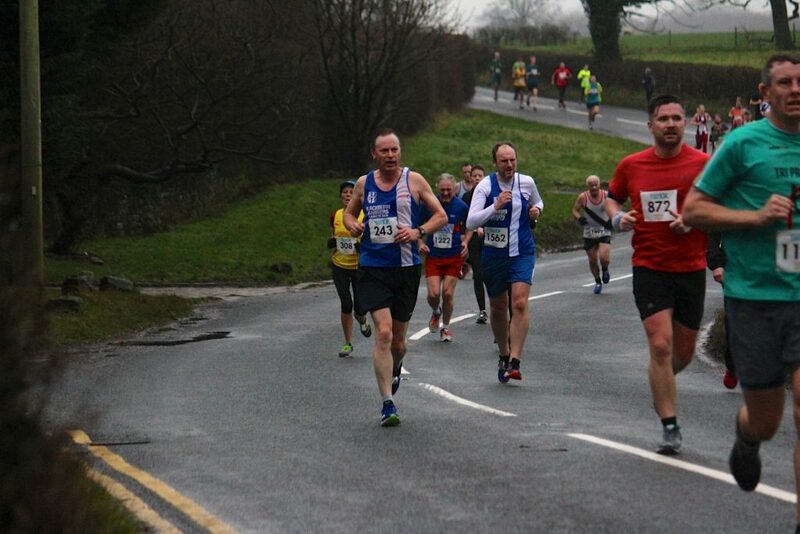 1:02:37. 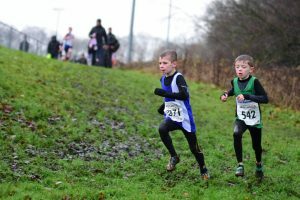 A lovely little race in fresh conditions. 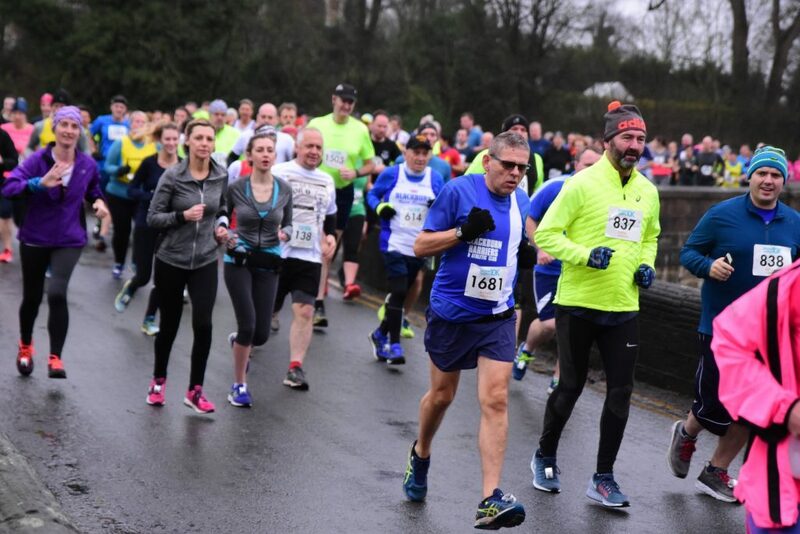 Three hundred and forty five runners turned up for this, and rumoured to be the final ever running of this very popular race which provides for a lot of fun, plenty of prizes and fond memories of a good day out. 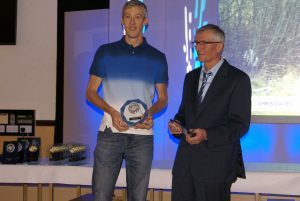 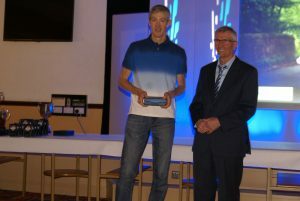 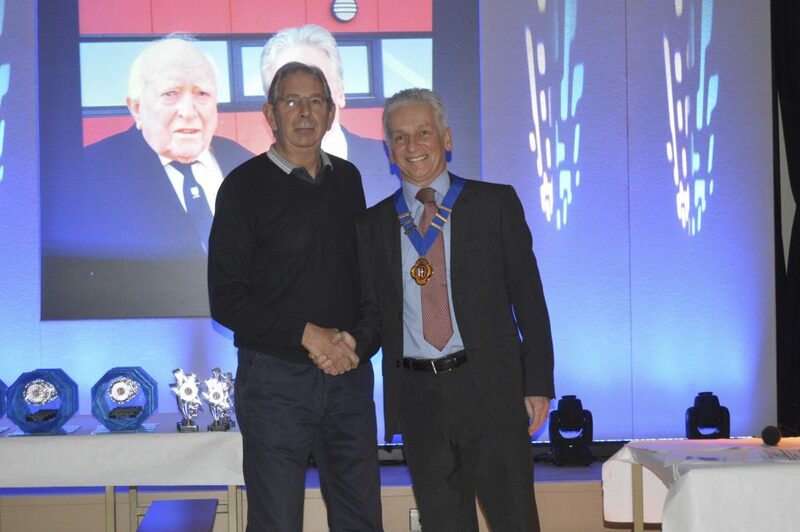 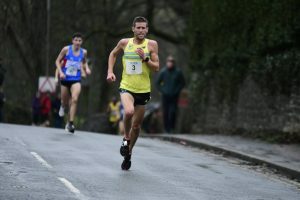 The race was won by Chris Houldsworth in a time of 27.38 with Gary Priestley in second (29.13). 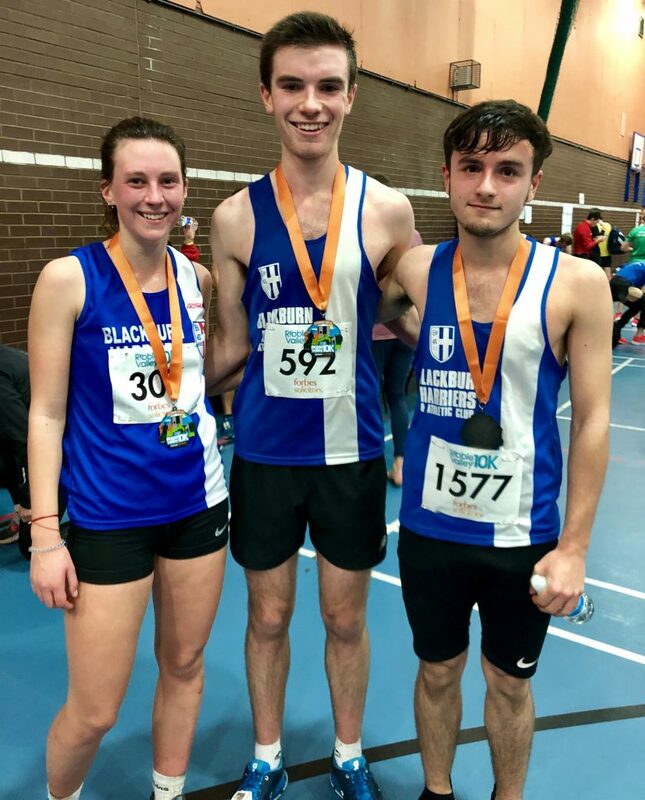 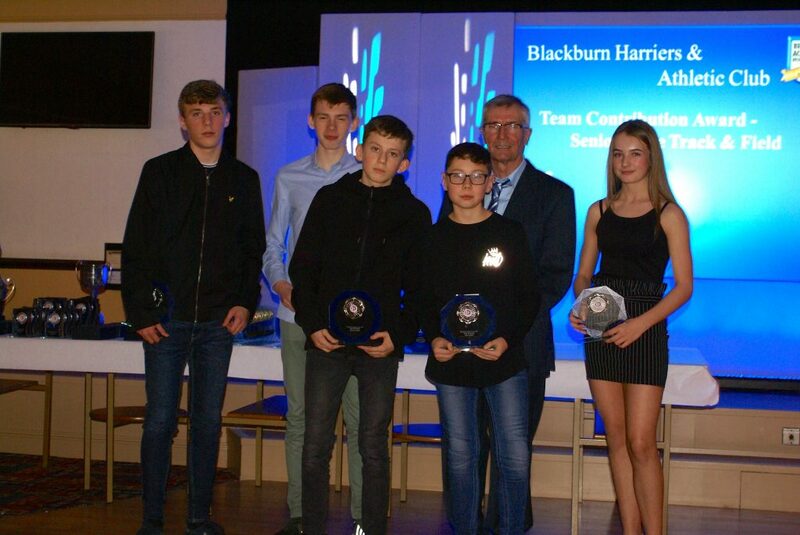 Eight Blackburn Harriers ran the main race which saw Calum Holmes be the first Harrier across the line for the Club in 14th place overall – clocking a time of 33.51 and followed in by U17 Harry Wilkin in 26th spot (35.44) with Daniel Balshaw in 33rd spot (37.01. 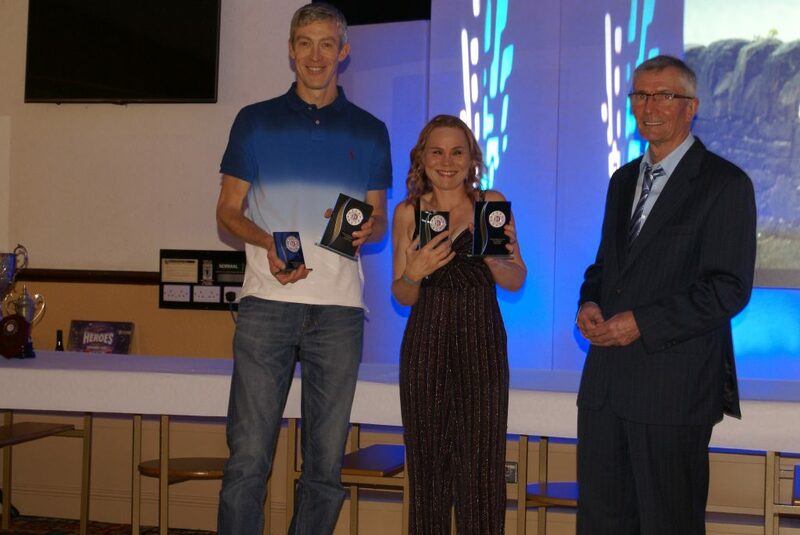 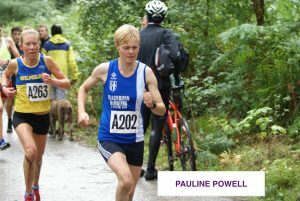 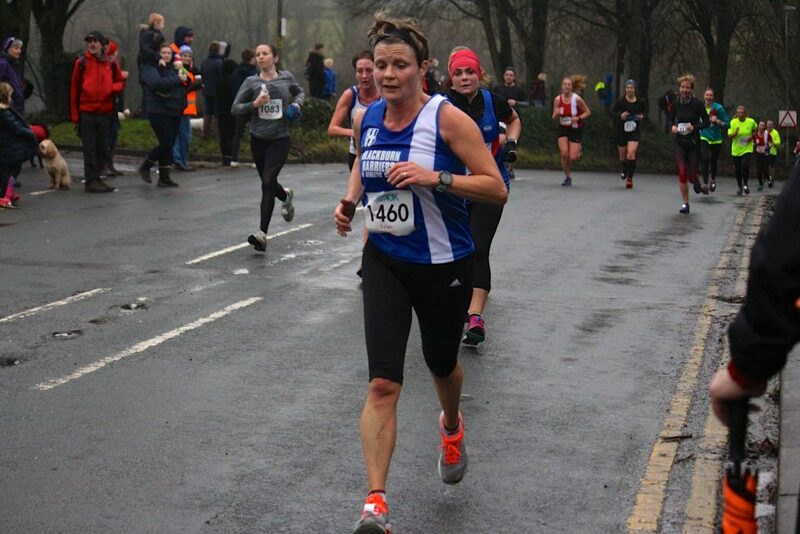 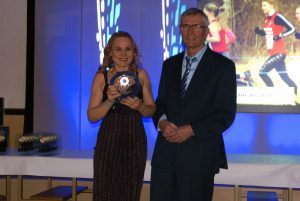 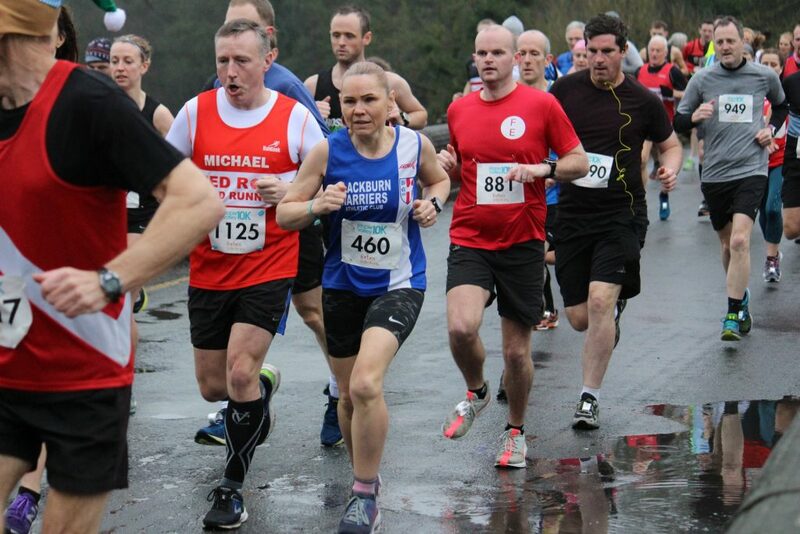 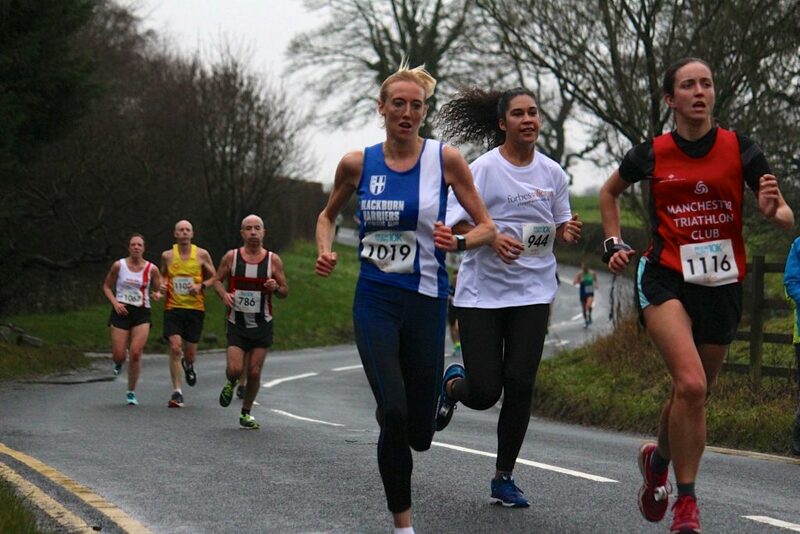 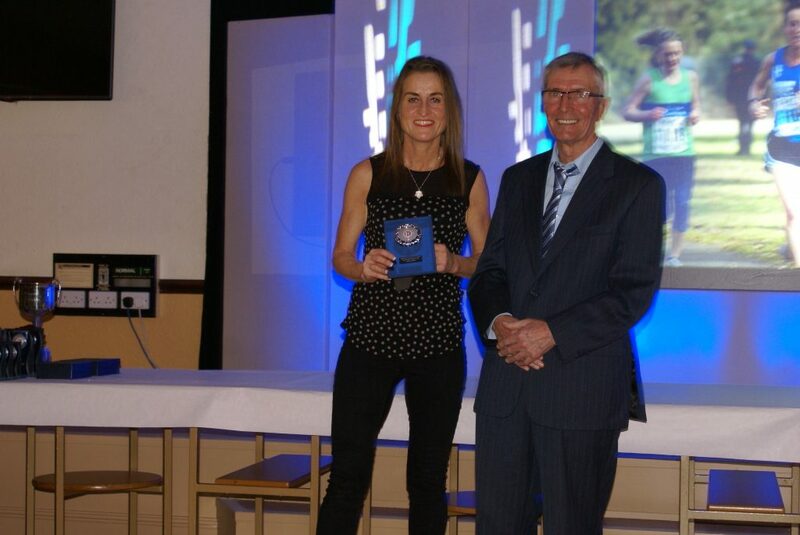 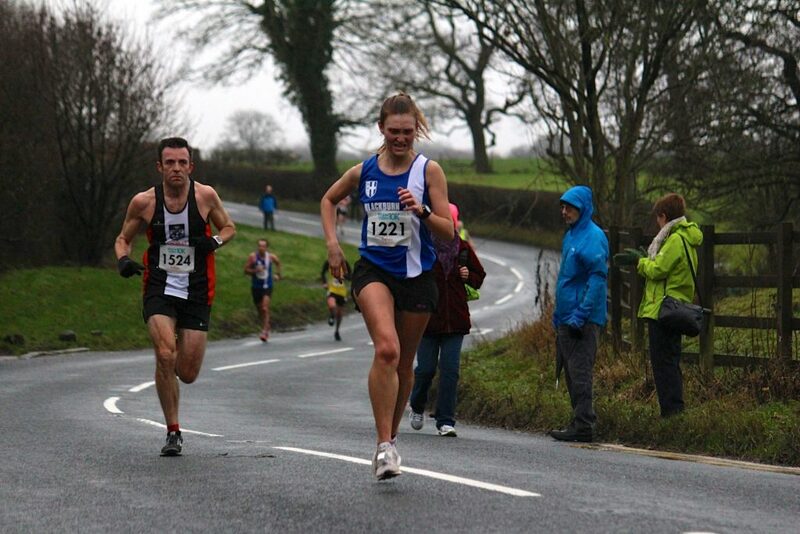 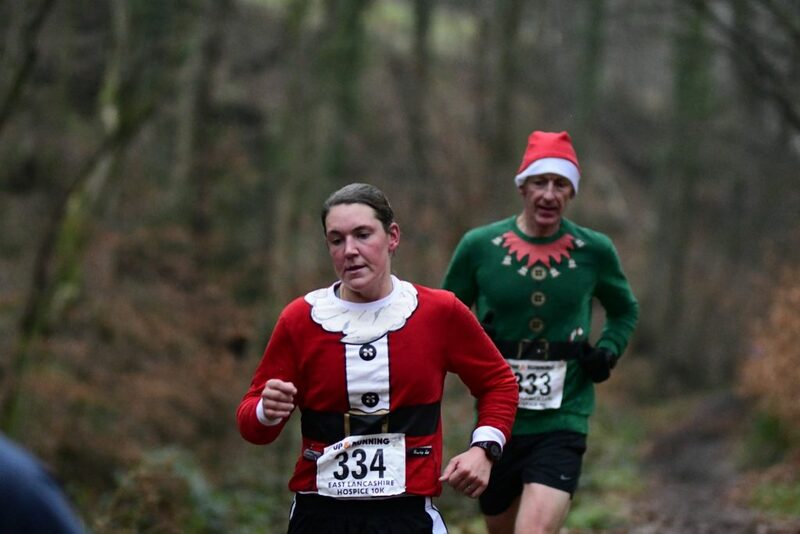 Great to see Sarah Toms back up North and running for the Club as she came home in 63rd position with a time of 42.29 and ahead of V45 Paul Wilkinson (85th) and Mark Wilkin (86th) with respective times of 46.39 and 46.48. 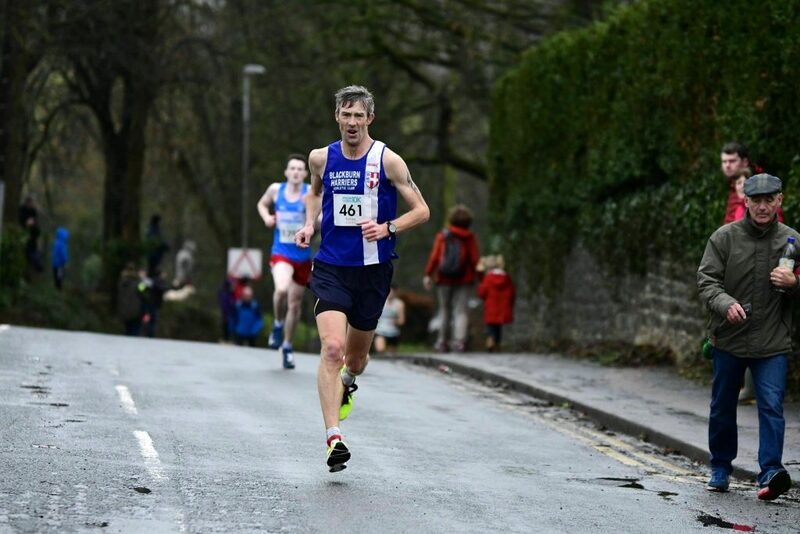 V55 David Morris finished in 179th place (59.56) with V50 Clare Wilkin in 197th running a time of 62.27 and V40 Lorna Sharp in 212th position (64.30). 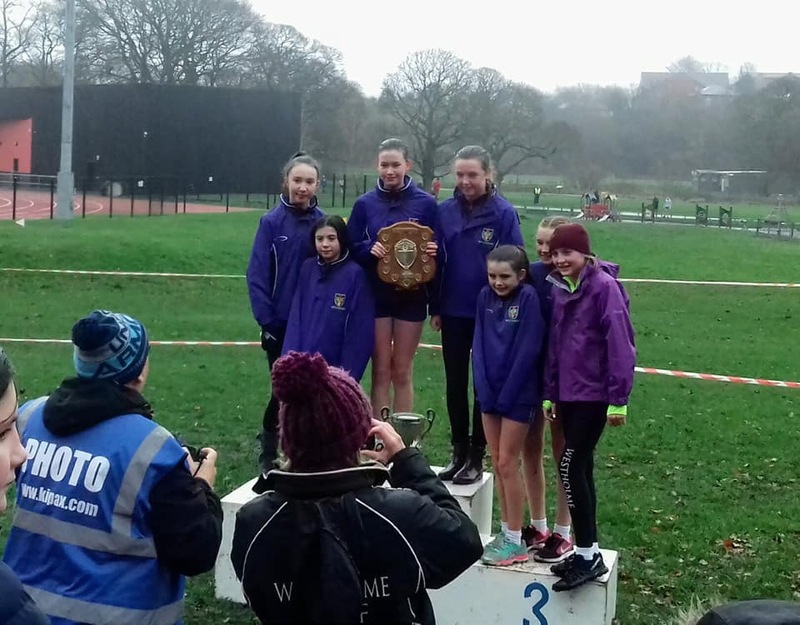 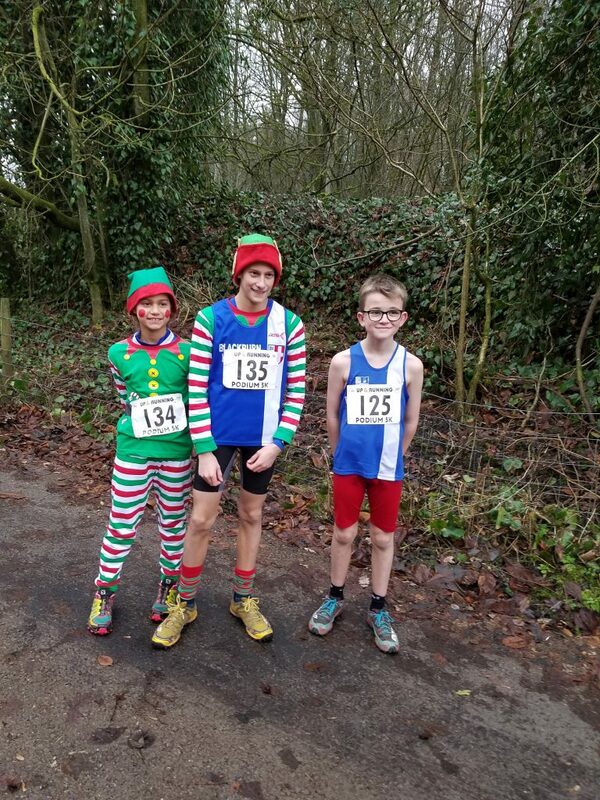 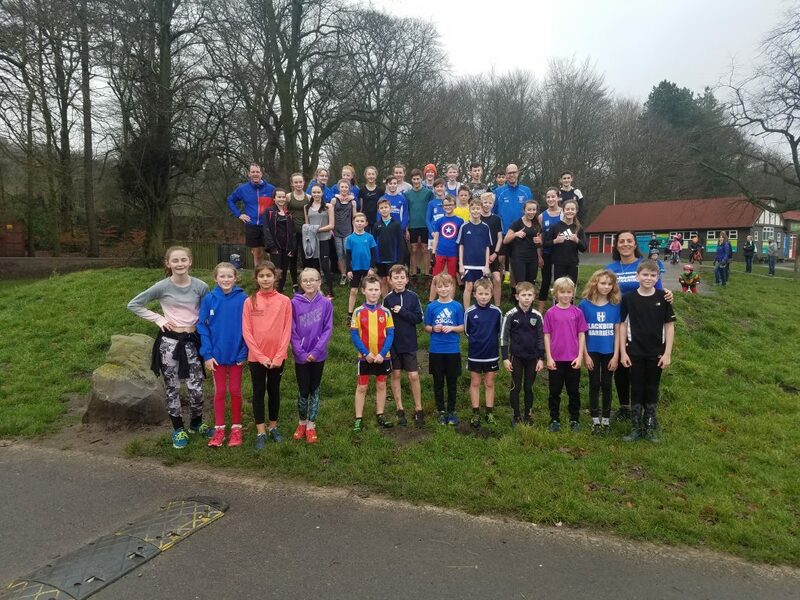 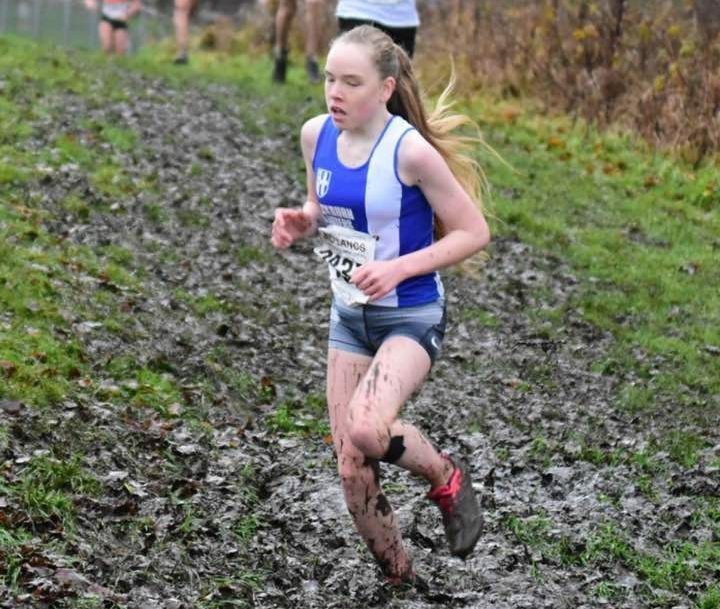 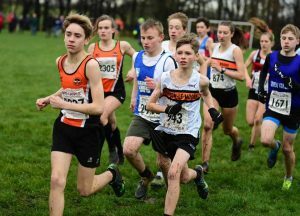 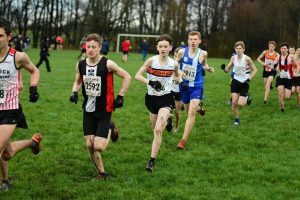 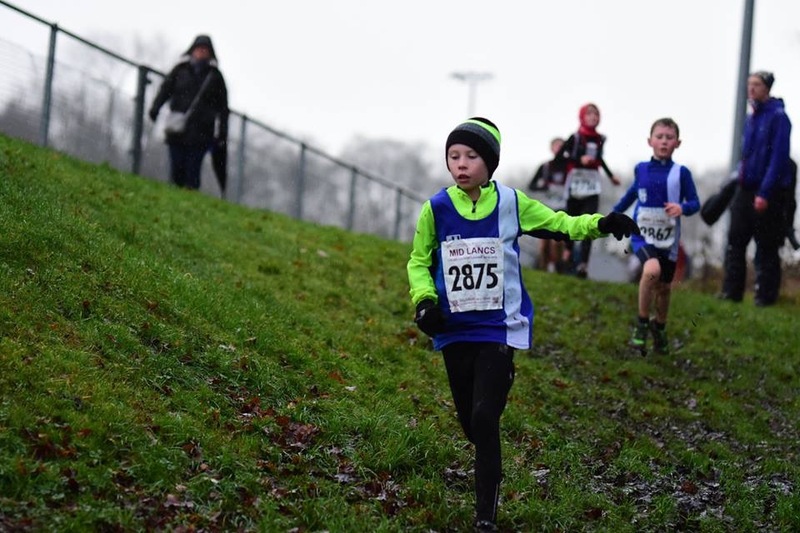 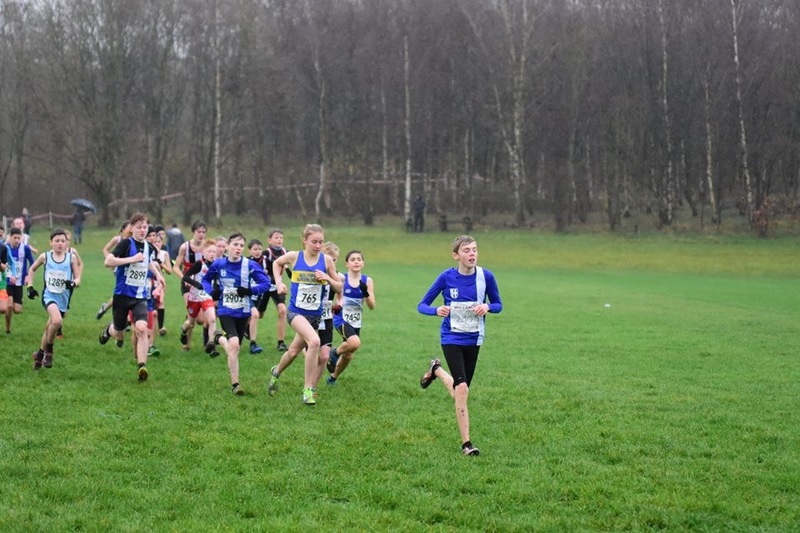 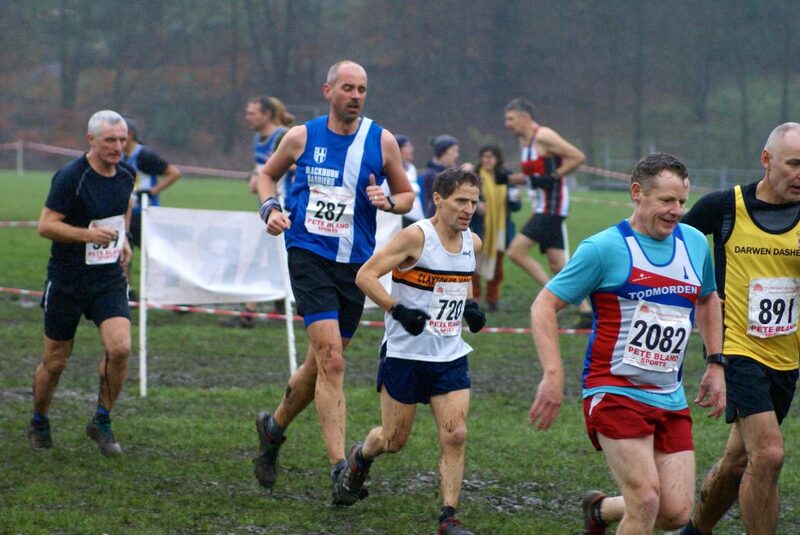 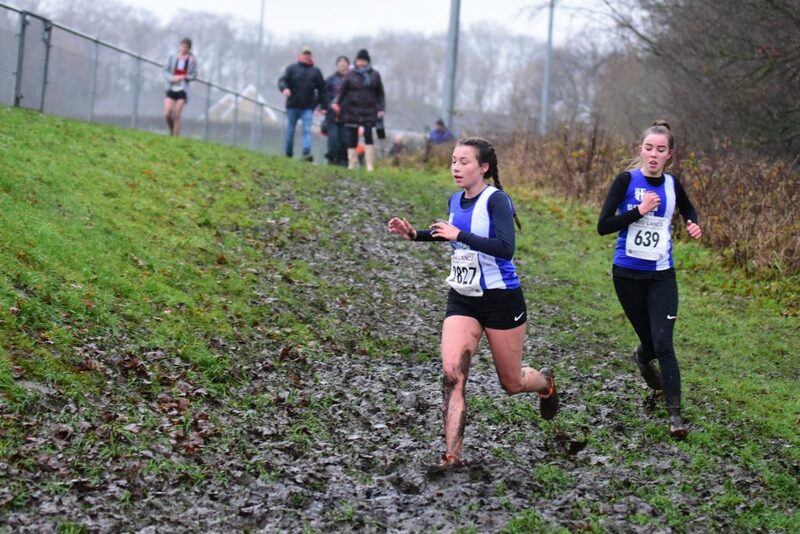 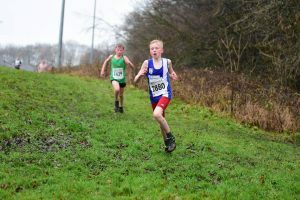 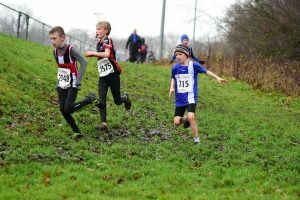 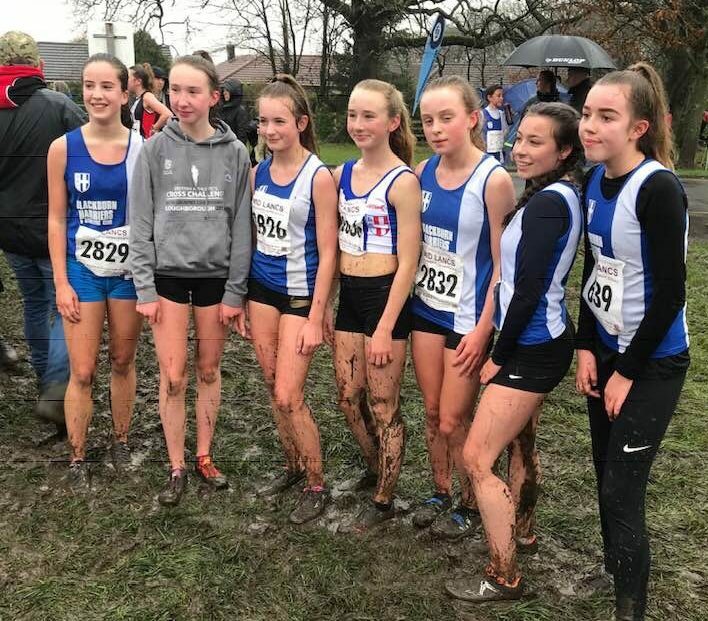 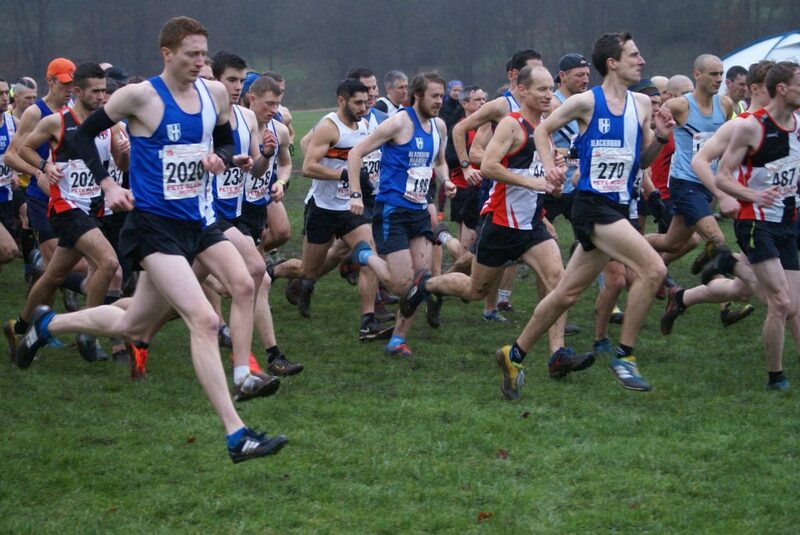 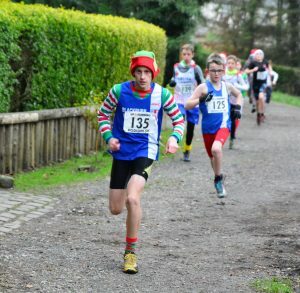 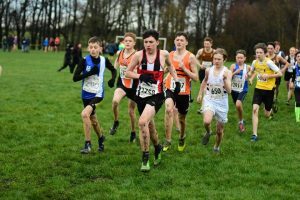 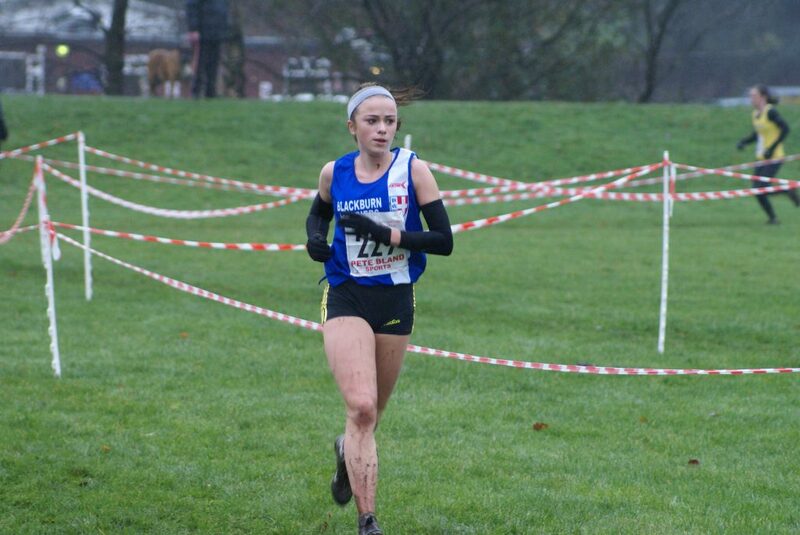 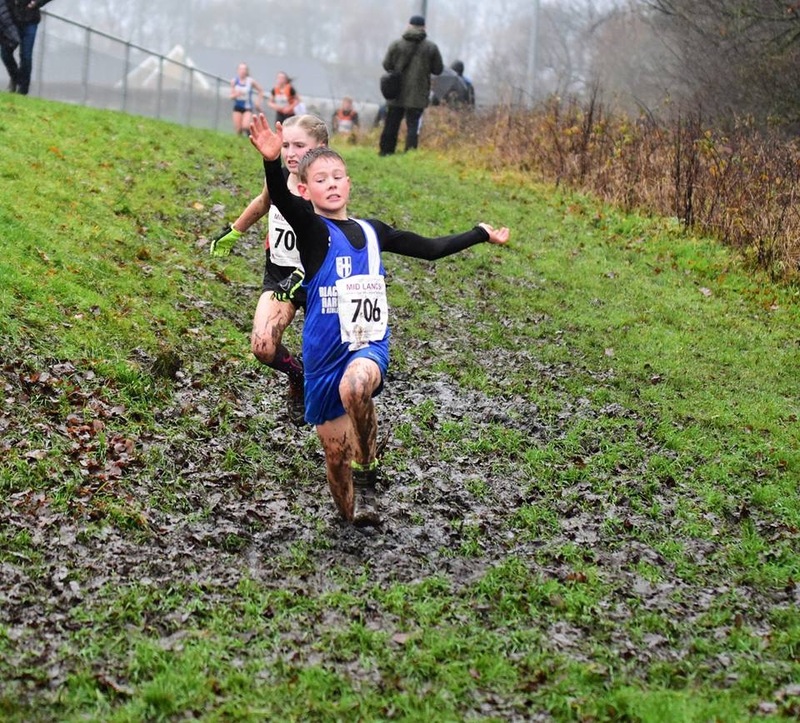 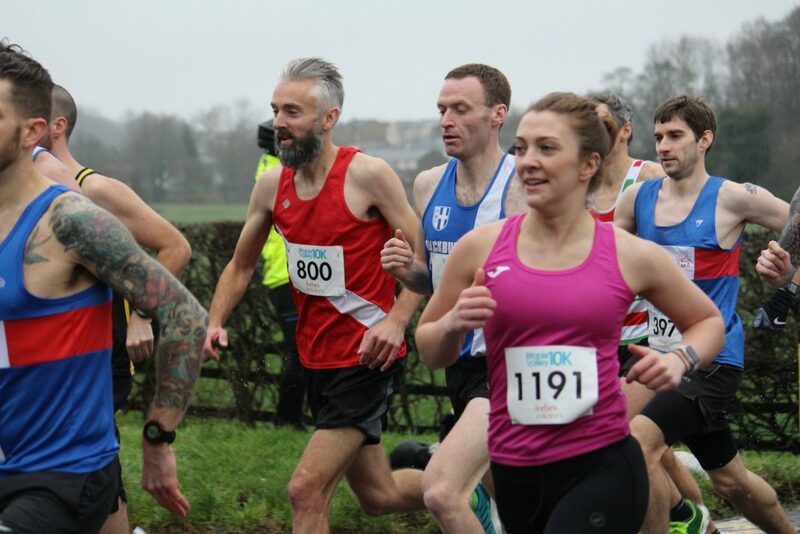 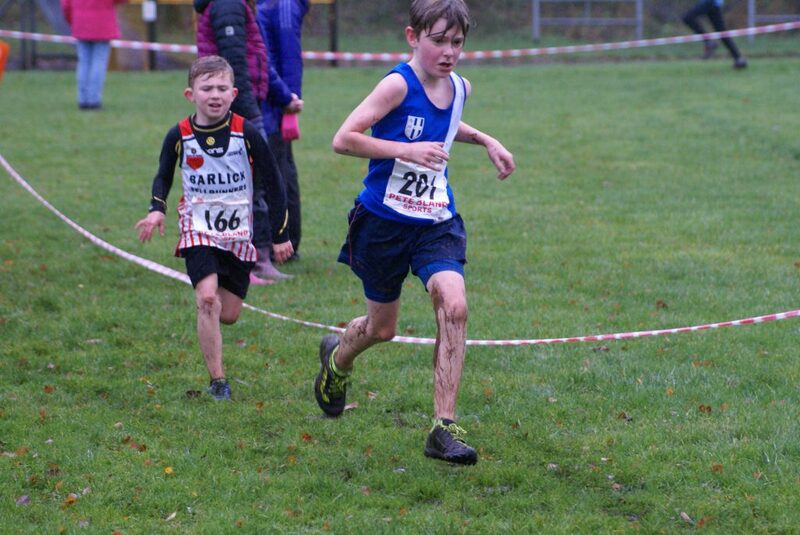 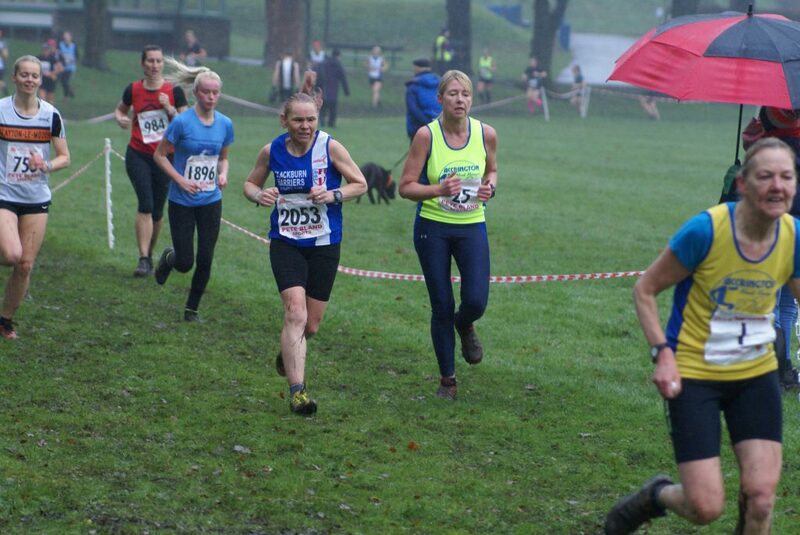 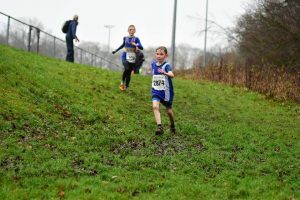 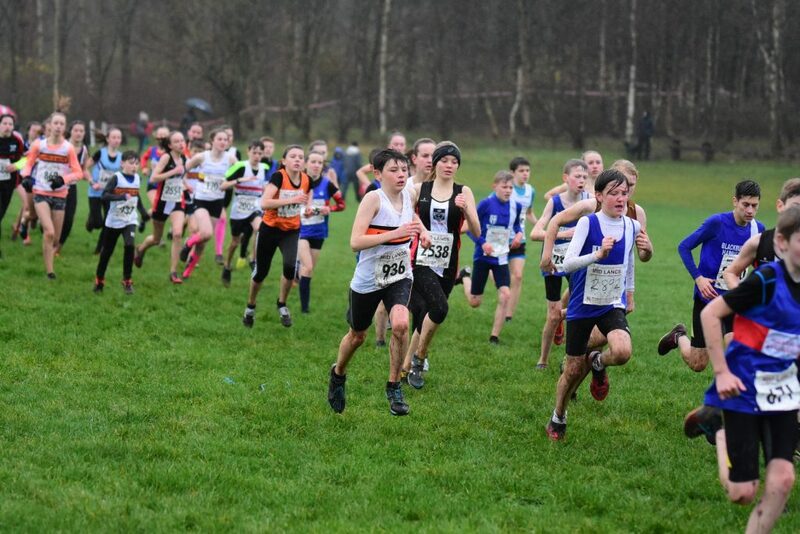 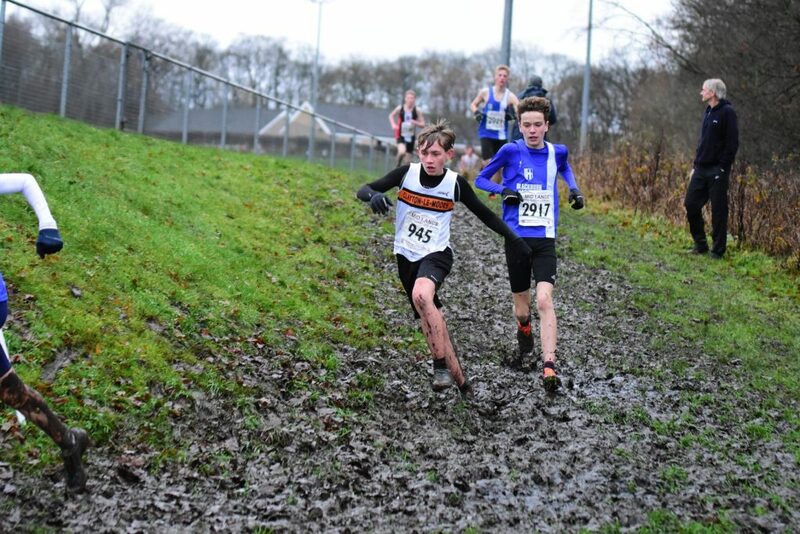 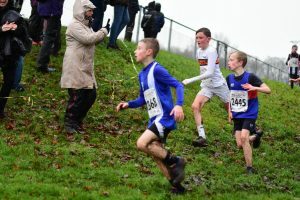 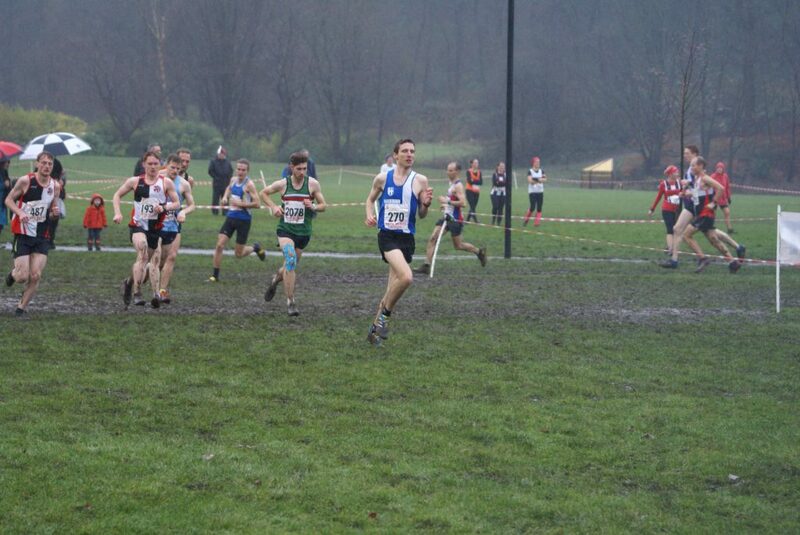 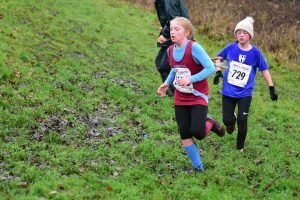 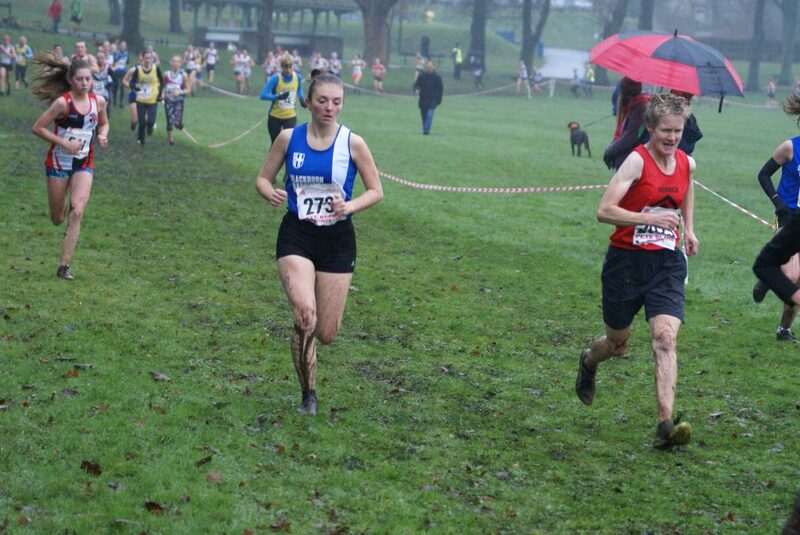 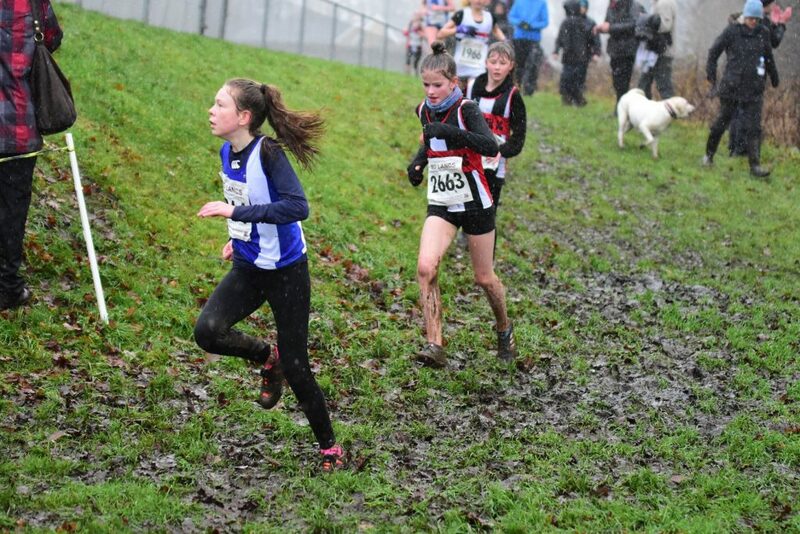 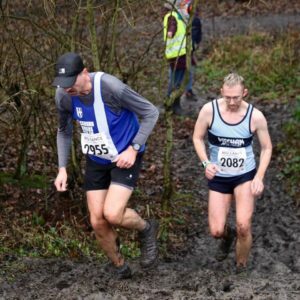 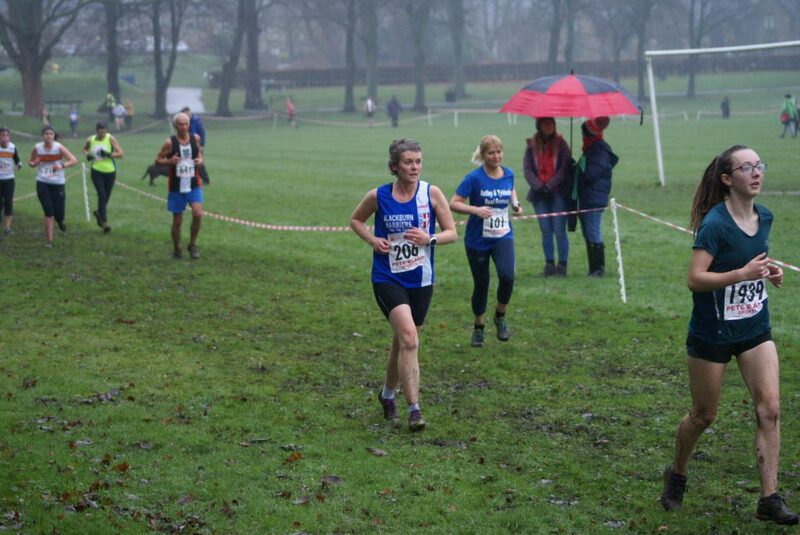 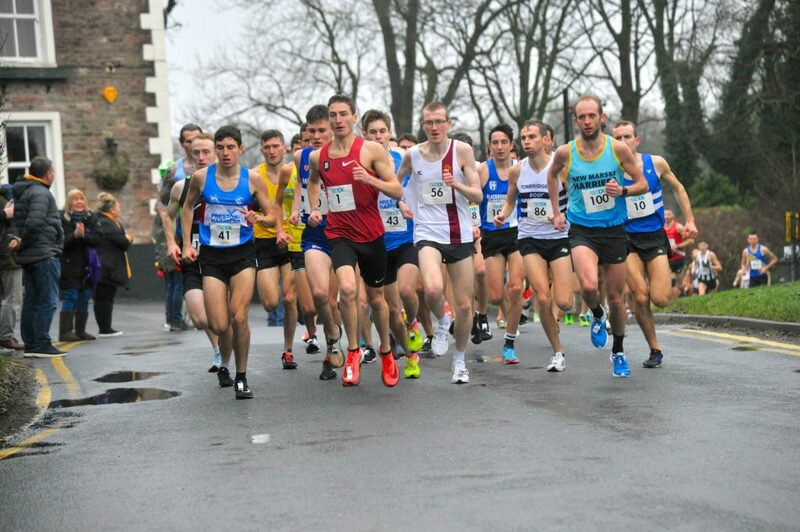 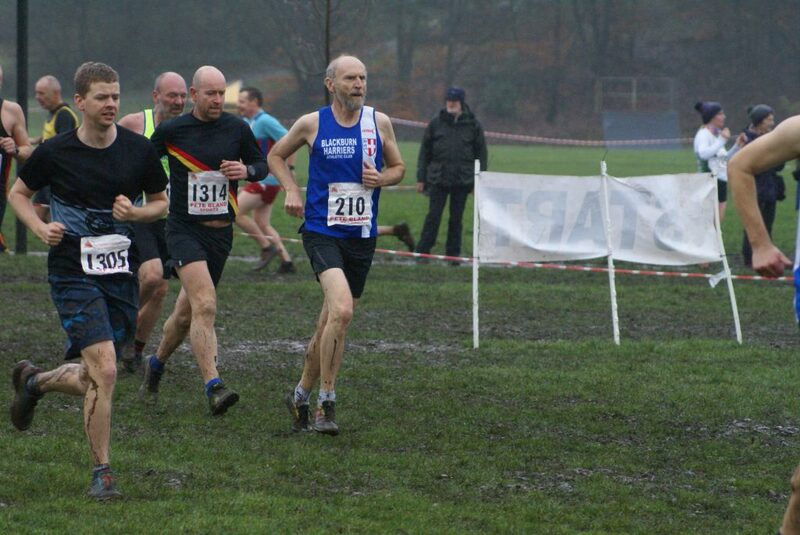 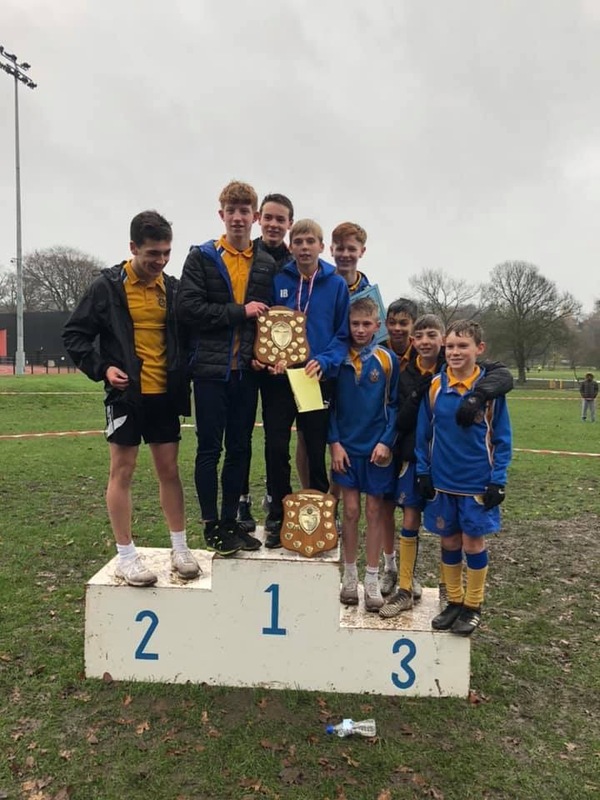 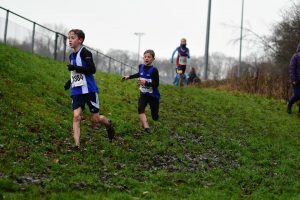 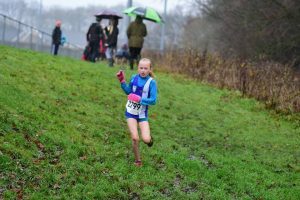 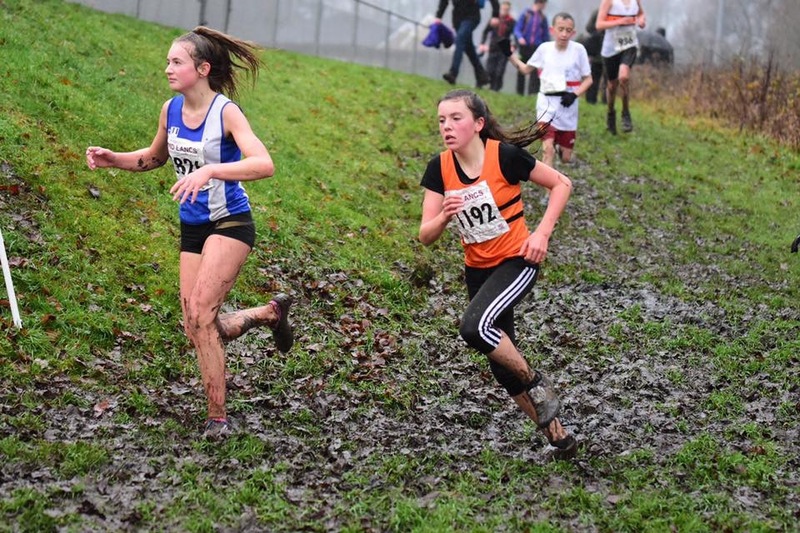 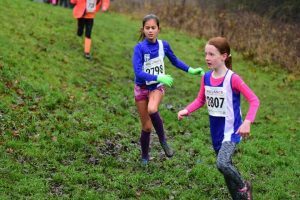 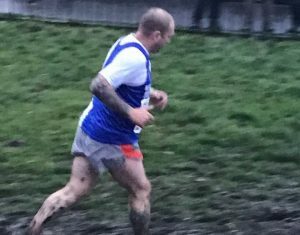 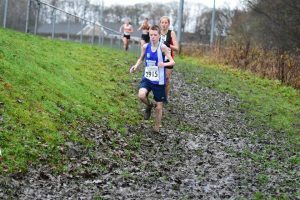 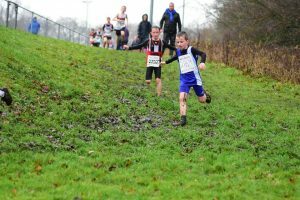 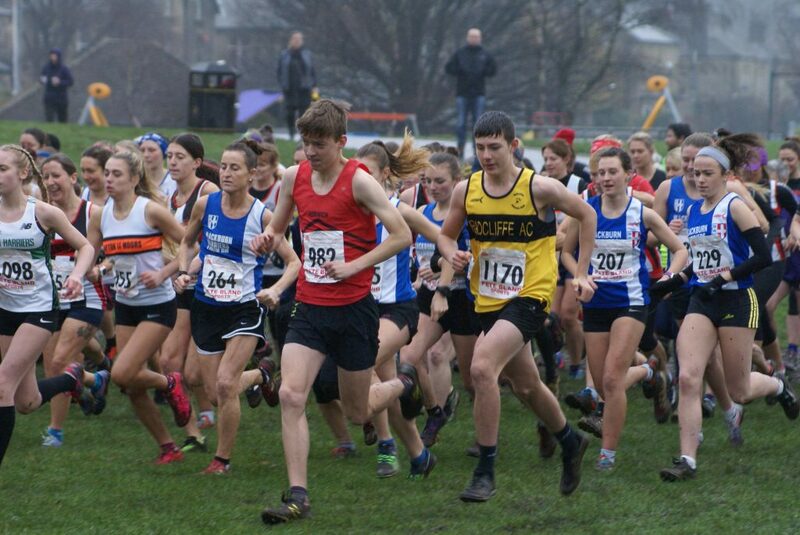 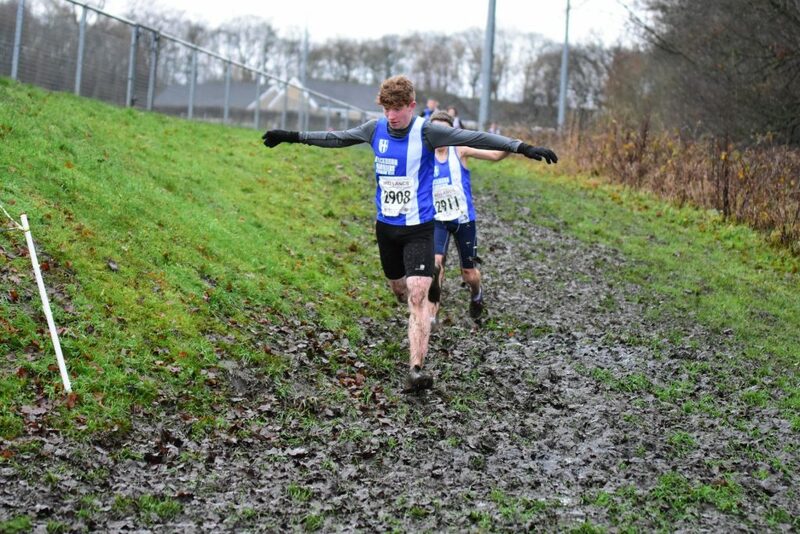 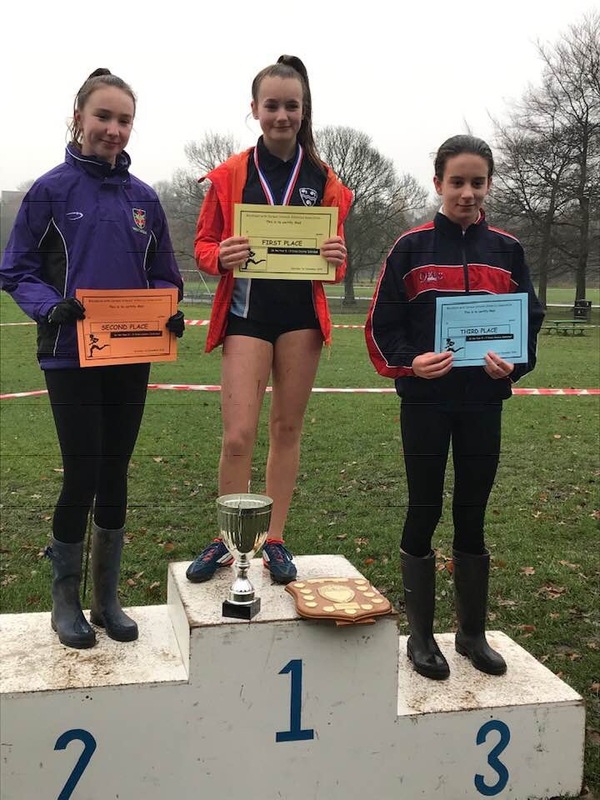 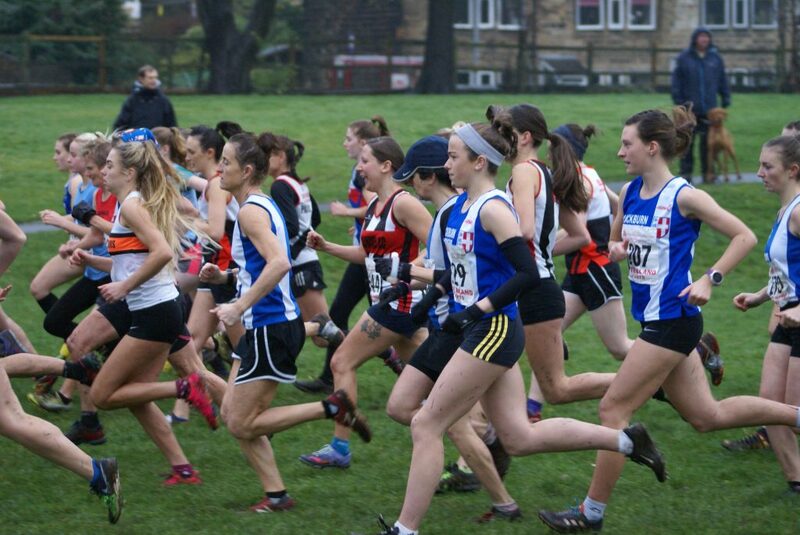 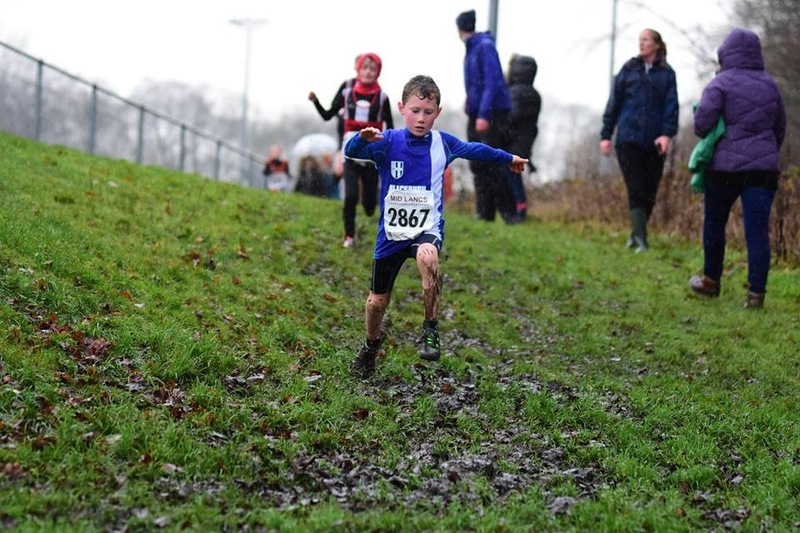 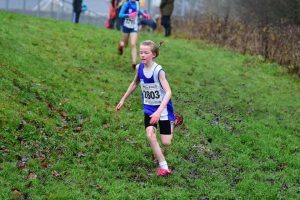 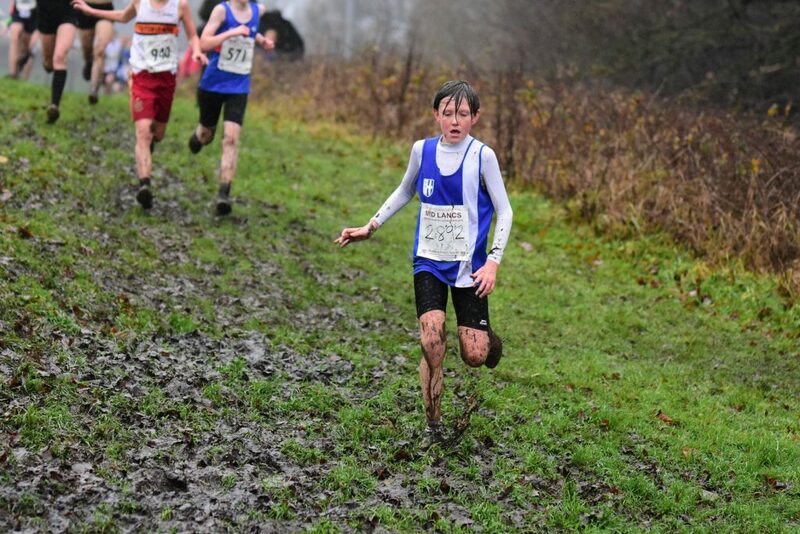 ‘Proper’ cross country conditions greeted the assembled athletes at Wilson Playing Fields for the third of six Mid Lancs League fixtures (2018-2019) – wind, rain, mud – on Saturday December 8th. 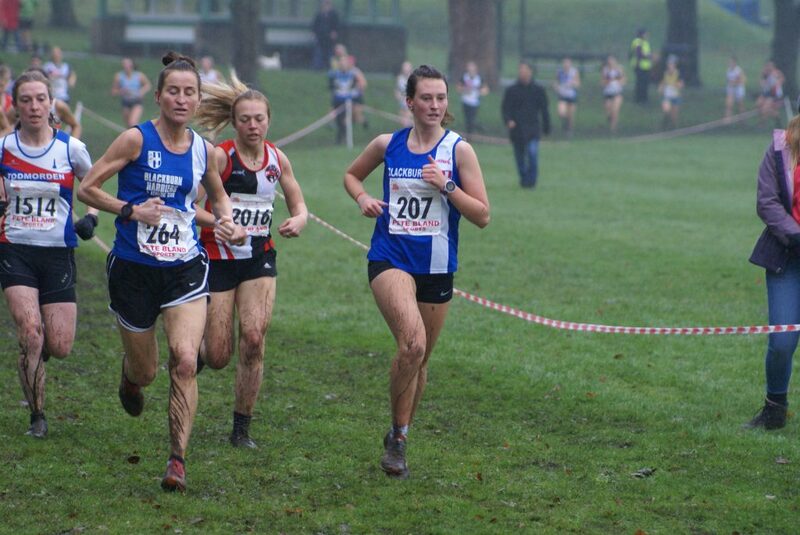 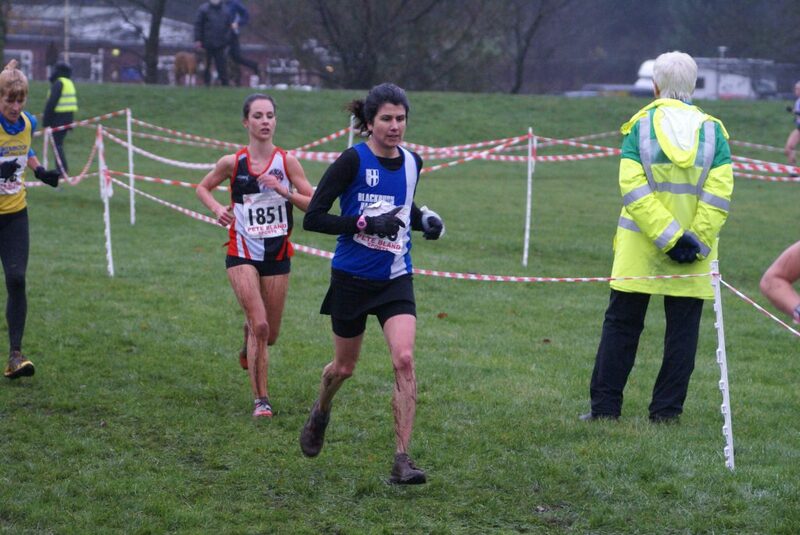 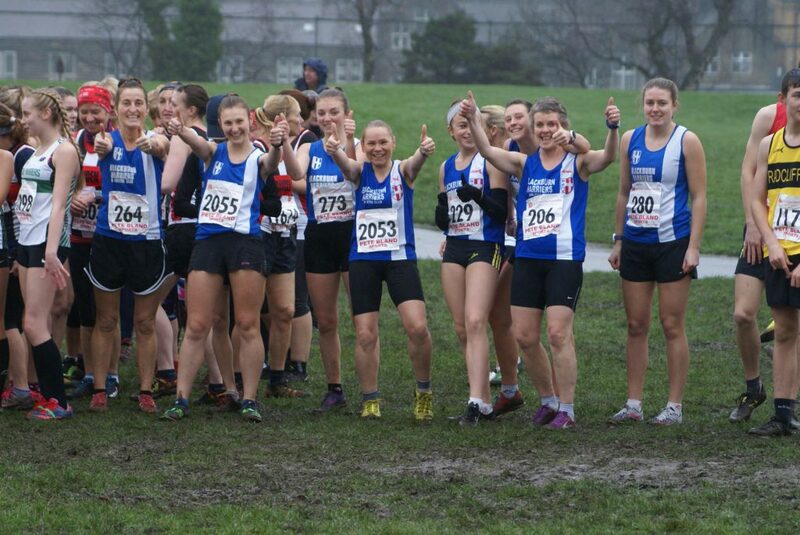 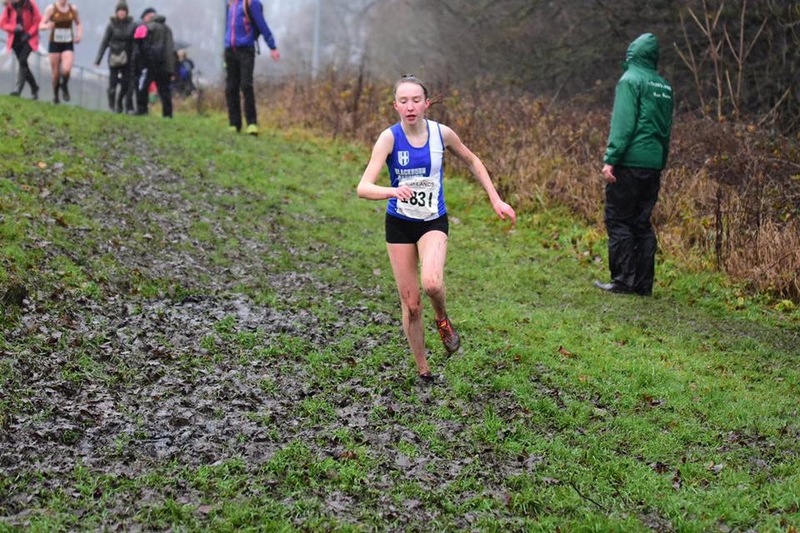 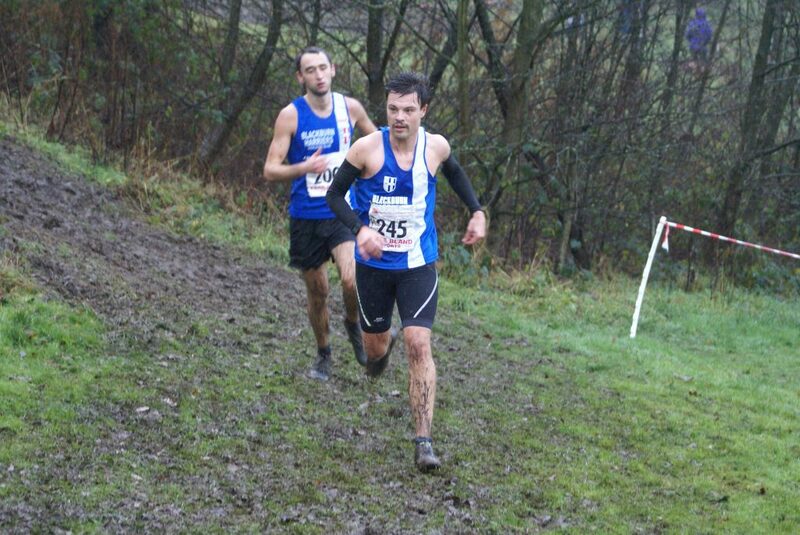 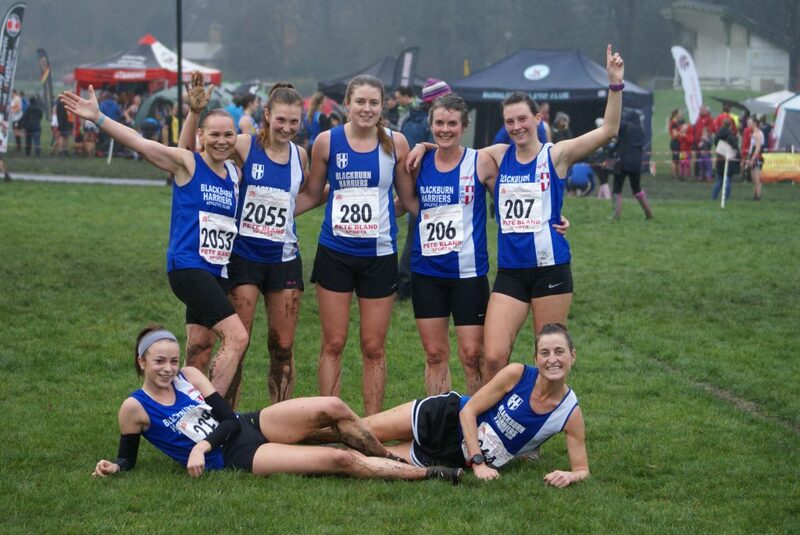 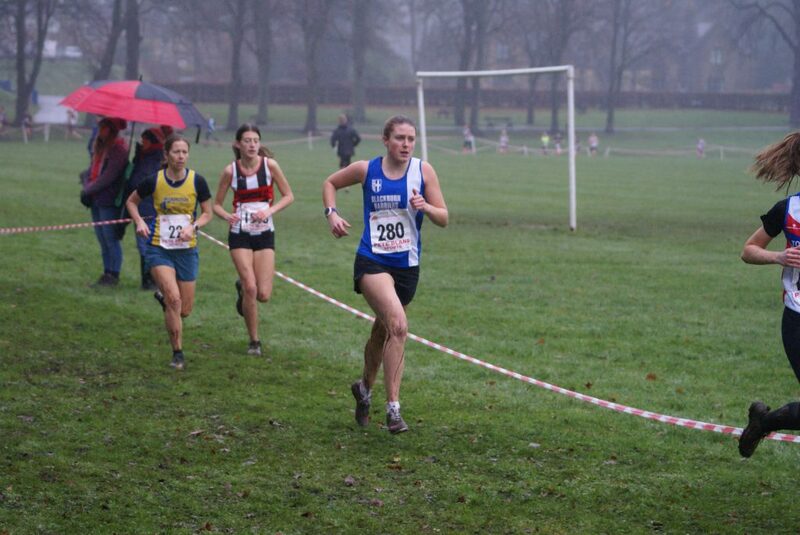 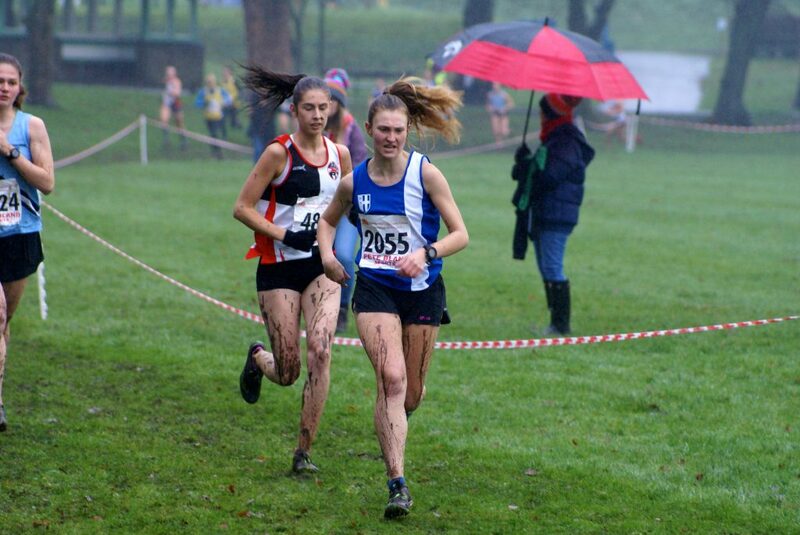 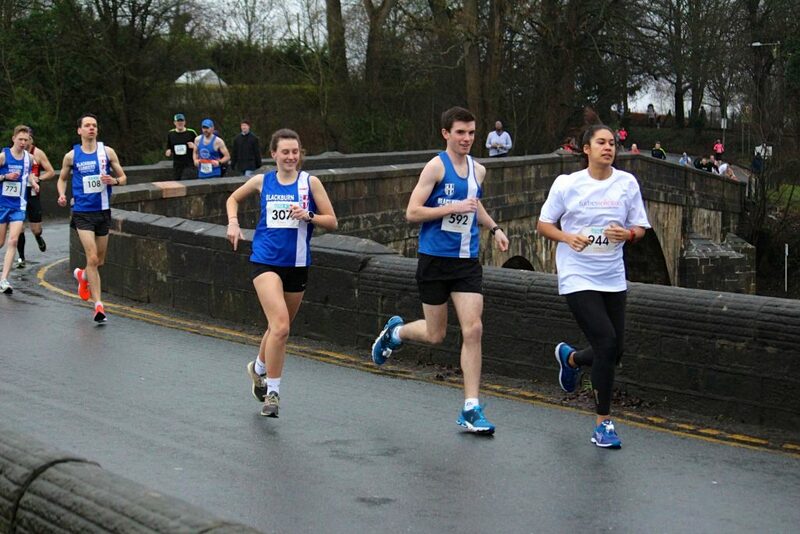 This didn’t put off the Harriers athletes as seventy of them wearing the Blue & White, battled against the elements. 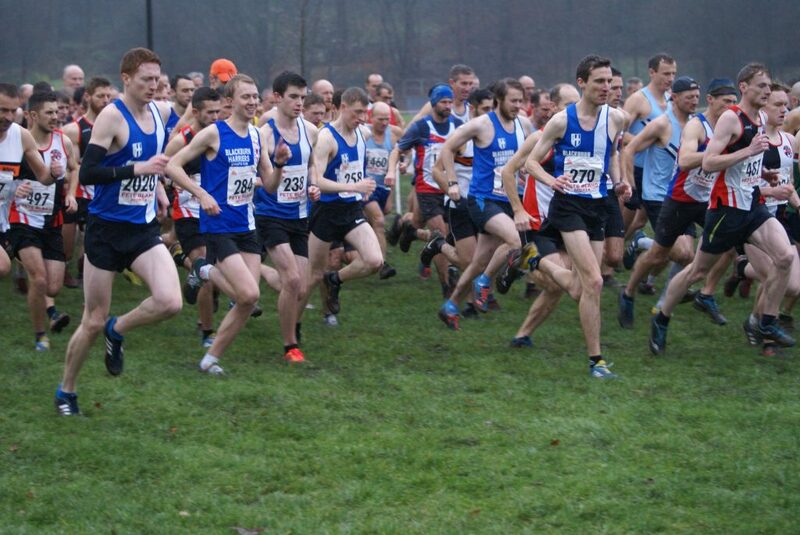 There were delays to some races whilst the course was re-checked and confusion in some races as to the route itself. 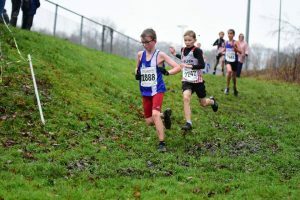 This raises once again, the issue of volunteers coming to the assistance of athletic clubs in putting on events. 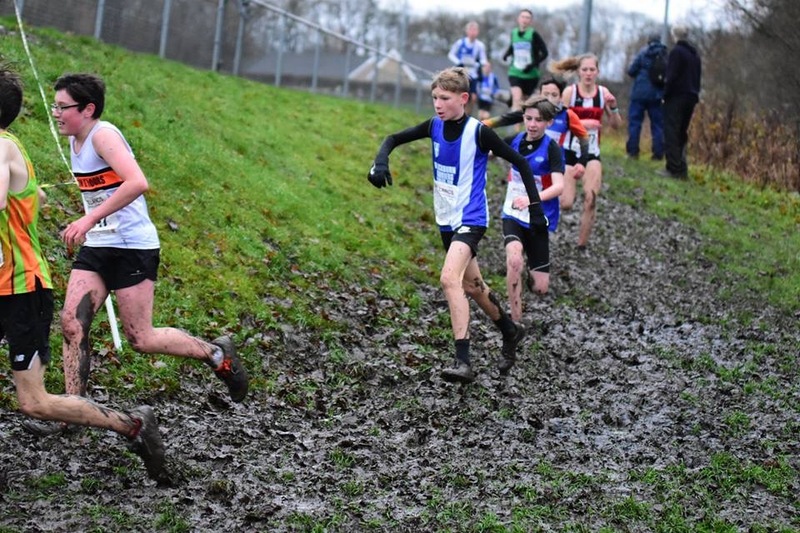 The truth is there are far too few who contribute to the running of the sport and without a serious renewal of Officials and people who are prepared to help put events on, not only in cross country but in track and field too, there is a likelihood that events will be cancelled. 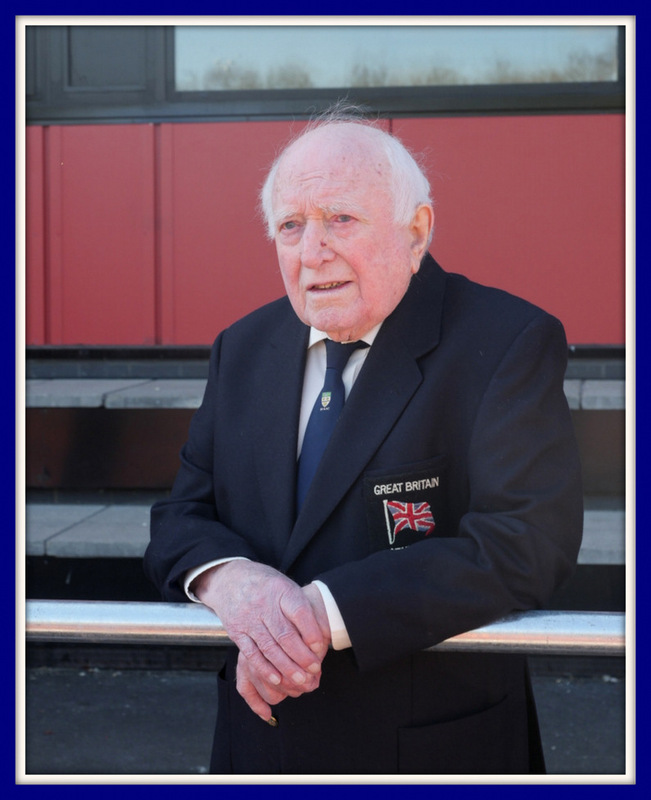 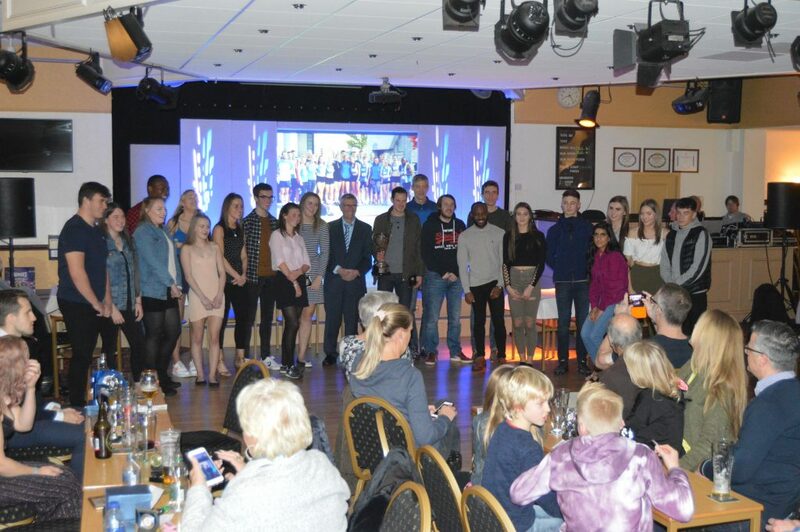 There was, and will be criticism of what happened on Saturday, but, spare a thought for those handful of volunteers led by Norman Mitchell who had the responsibility of putting on this fixture with not enough people to help. 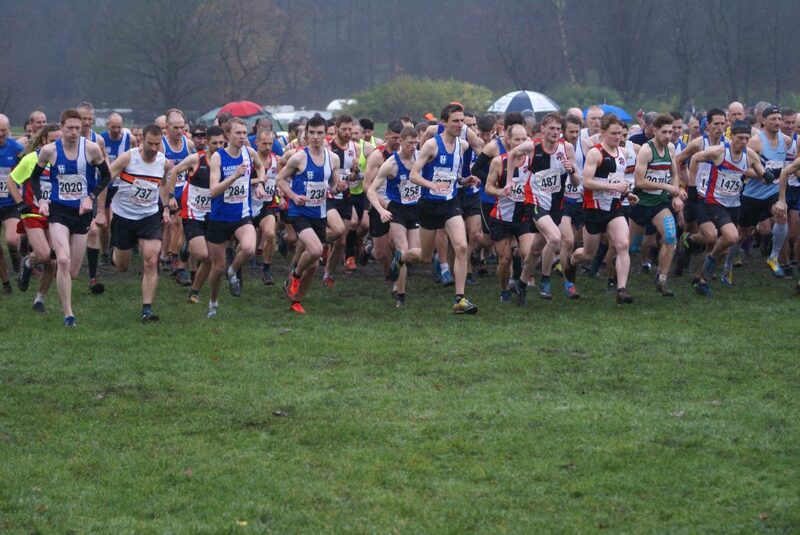 Many thanks to photographers Daniel Belshaw and David Wood, plus others whose photos we have used for this report – The Harriers camera got affected by the weather and went down for the day and apologies for those athletes whose photo doesn’t appear. 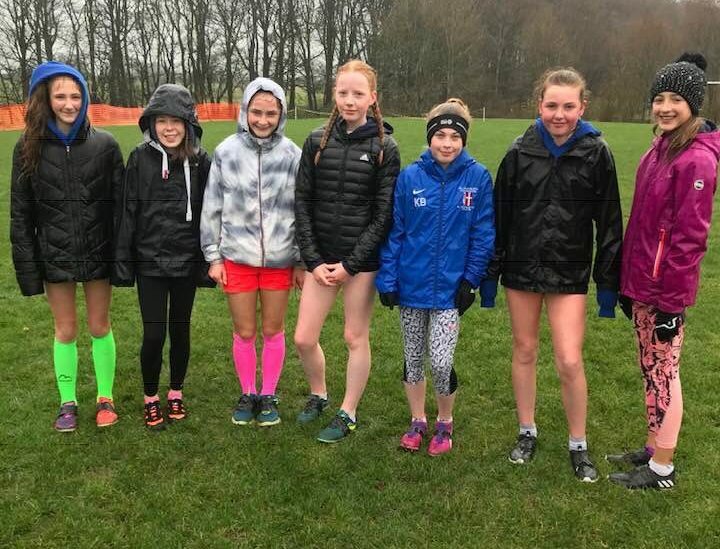 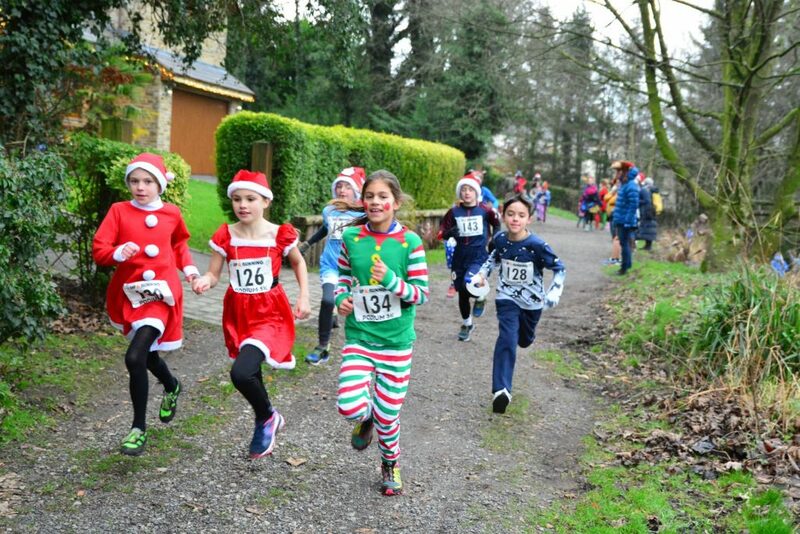 The U11 Girls got the day off with the first race featuring sixty two runners and definitely not deterred by the conditions. 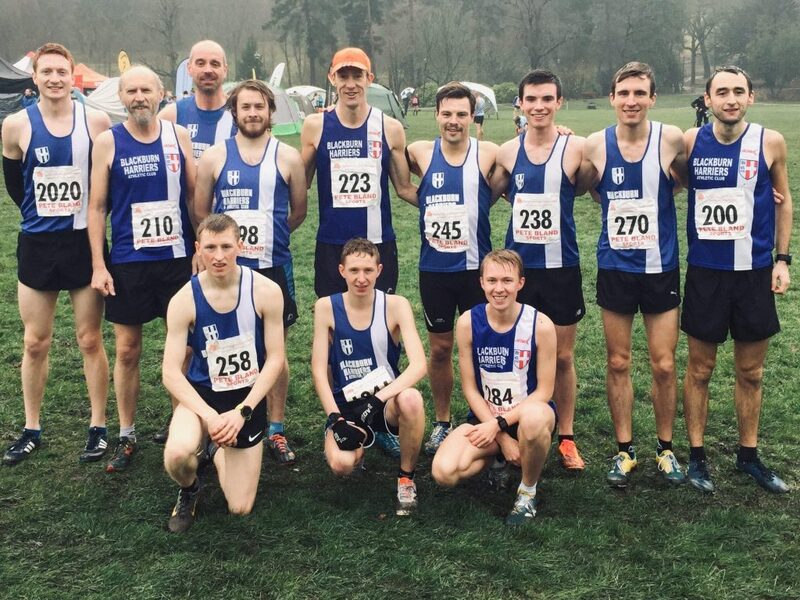 The Harriers finished as 2nd Team to Lancaster, just missing out on the win by four points. 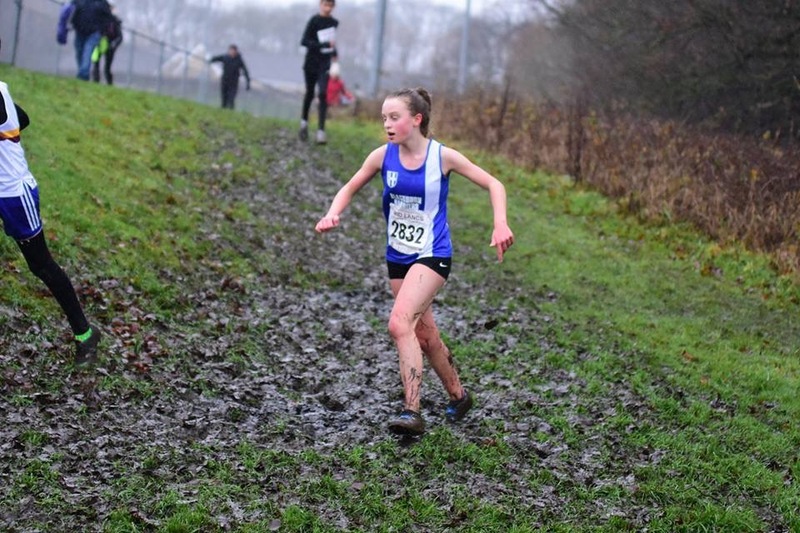 Imogen Robinson led the team home in 5th place clocking a time of 8.46 with Hannah Davies one place behind in 6th (8.52), Charlotte Sousa in 25th with a time of 9.44, Lulu Sharp (46th) running 10.28, Isabella Pacelli one second behind in 47th (10.29) and Maisie Taylor coming home in 56th place (11.23). 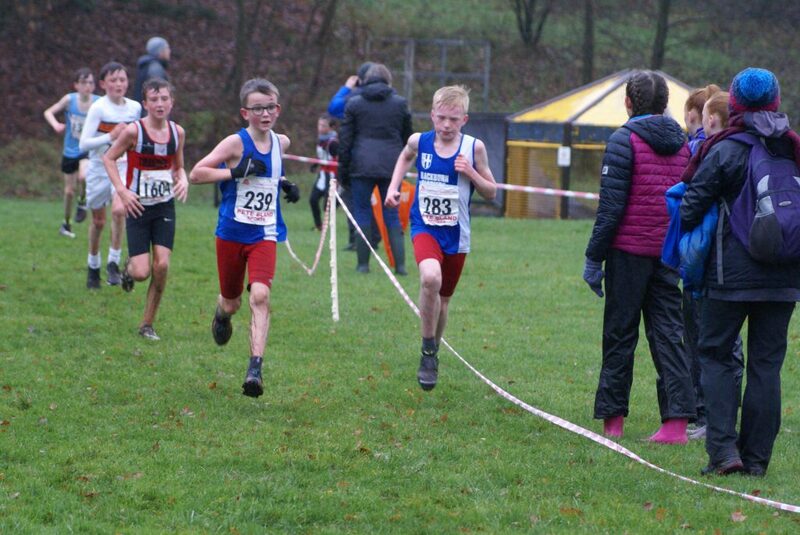 Seventeen U11 Boys turned out for the Club as they matched the girls taking 2nd team overall behind a very good Trawden AC team. 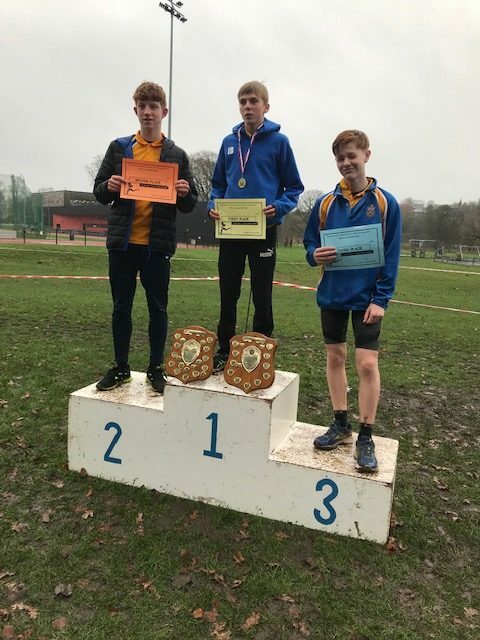 Sam Aspey led the lads home running a time of 7.40 in 4th place with Matthew Smith in 6th (7.51) and Oliver Gill finishing 9th in a time of 8.04 to make up the three counters. 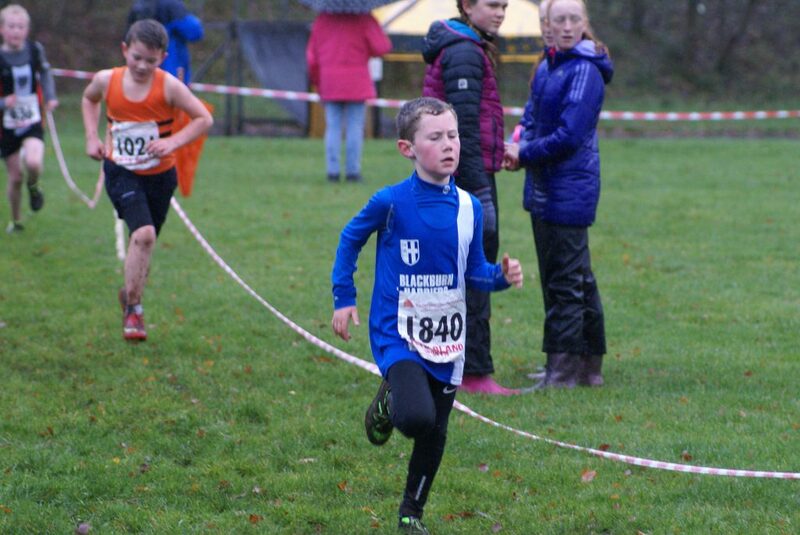 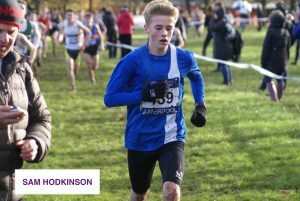 William Grundy was the next Harrier across the line in 15th place out of a field of 80 in a time of 8.12 with Theo Robinson making his cross country debut in the Mid Lancs (21st) clocking 8.25. 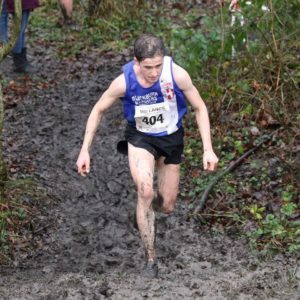 Charlie Haworth wasn’t far behind in 27th spot (8.36) followed by George Ramsden in 41st (8.52) and Felix Thompson 46th in a time of 9.10. 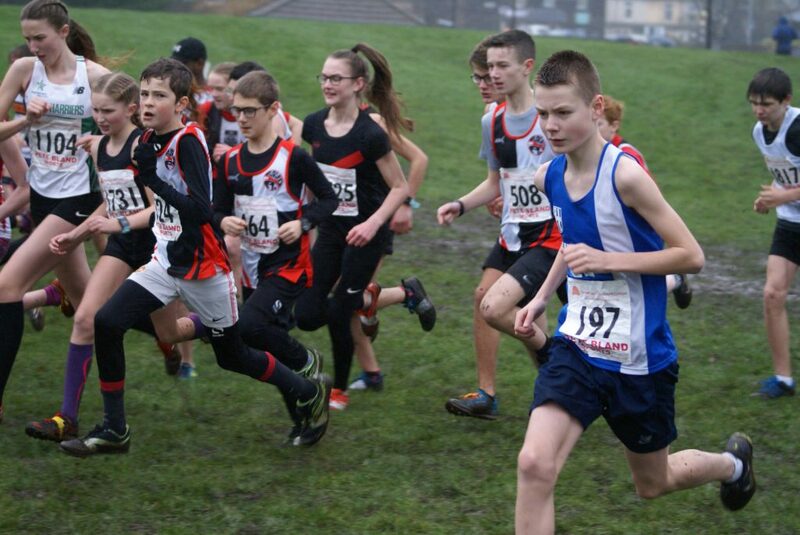 In 49th, 50th and 51st came Archie Bolton (9.19), Findlay Carroll (9.25) and Liam Bennison (9.26) respectively. 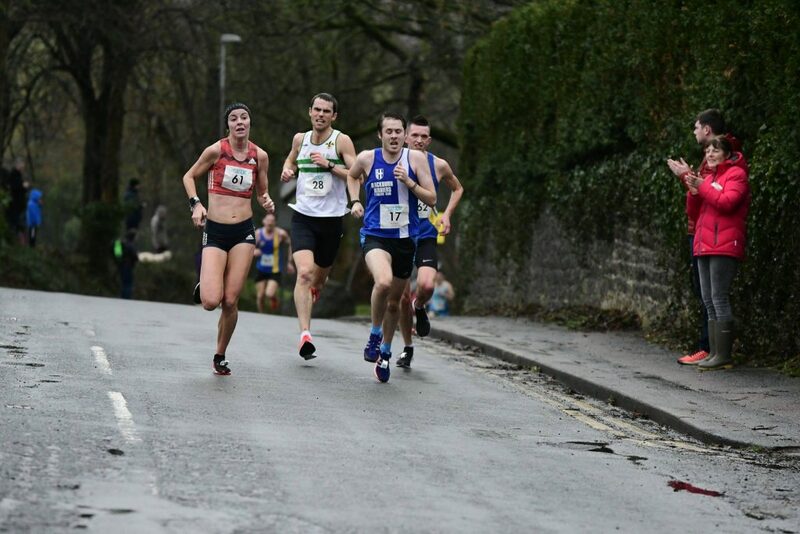 Just five seconds separated the next three Harriers in 56th, 57th and 58th – Alexander Brien (9.37), Loucas Lancashire (9.38) and George Holman (9.42). 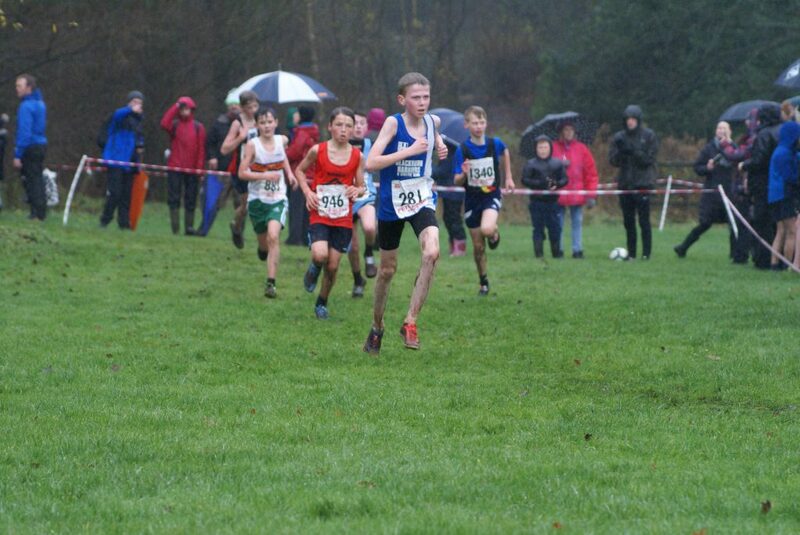 Harry Russel took 74th place in 11.15 with Evan Potter in 75th (11.26) and Isaac Smith 78th (11.48). 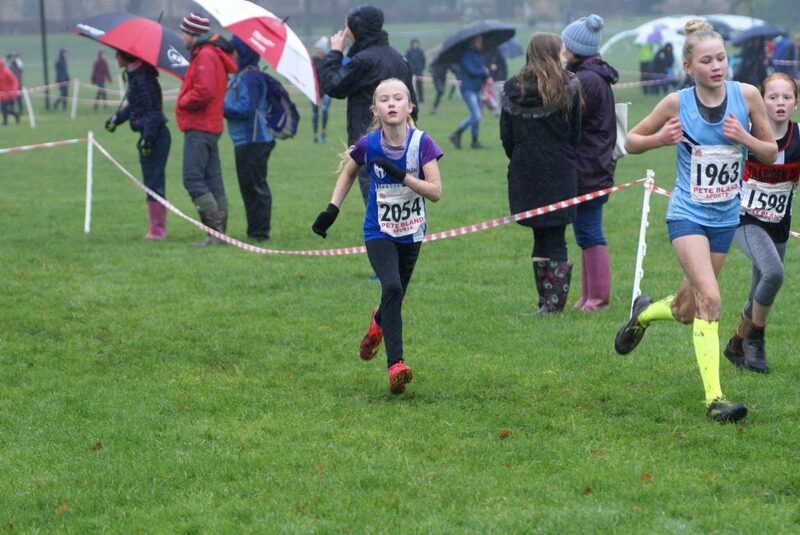 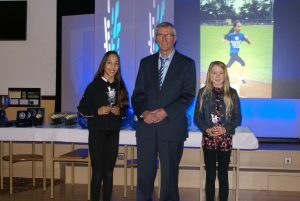 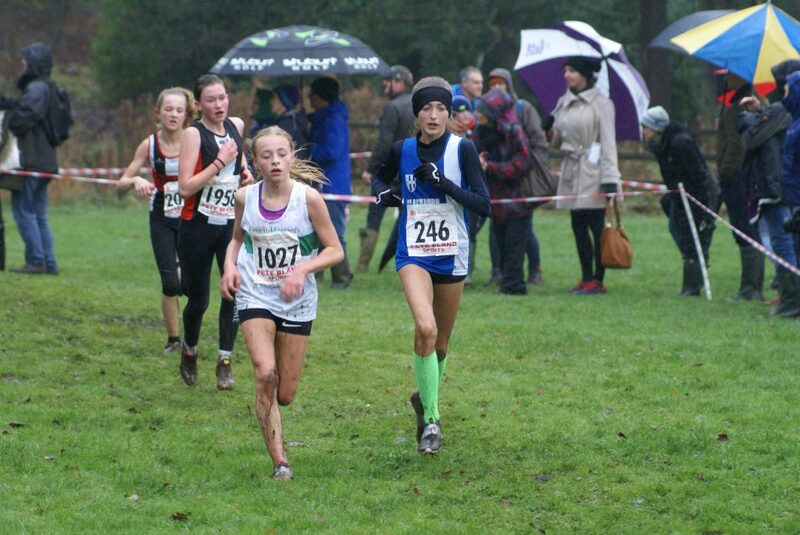 The U13 Girls placed 5th Team on the day with the Harriers highest placed athlete – Keira Haxton – coming home in 14th position in a time of 11.52 with Molly Grimshaw the second Harrier home in 23rd (12.13). 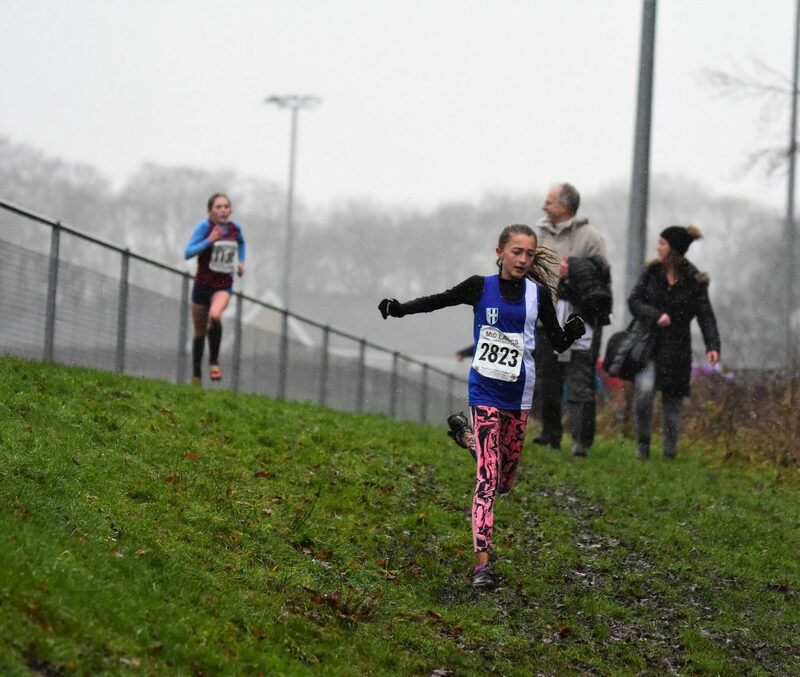 Next came Eva Knowles in 28th clocking 12.20 with Keira Booth in 29th (12.28), Caroline Woodworth (33rd) running a time of 12.40, Amelia Burton in 35th position (12.45) and Isabelle Hartley in a time of 12.50 (37th). 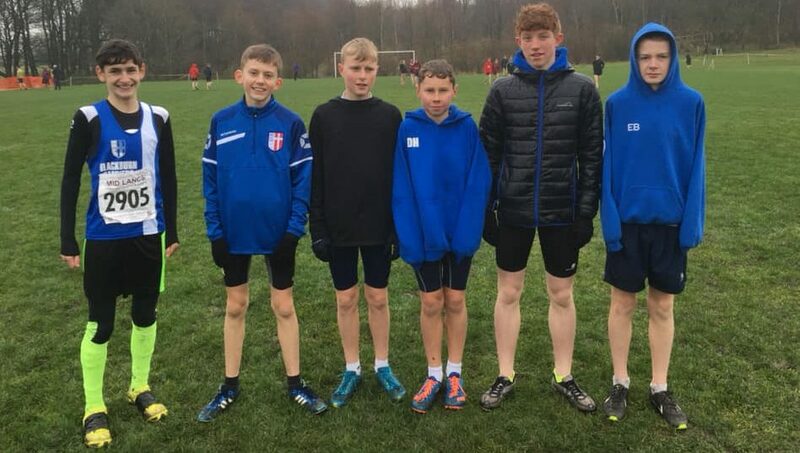 The Harriers U13 Boys had a dominant performance winning the Race with Isaac Butler, Dexta Thompson and Theo Watson the three counters for the win. 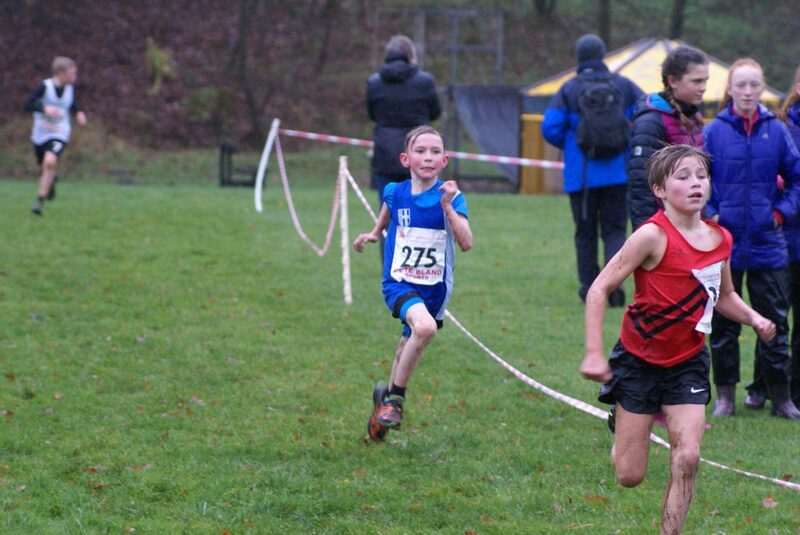 Isaac won the race in a time of 10.31 with Dexta in 2nd place (10.38) and Theo in 6th spot in a time of 10.48. 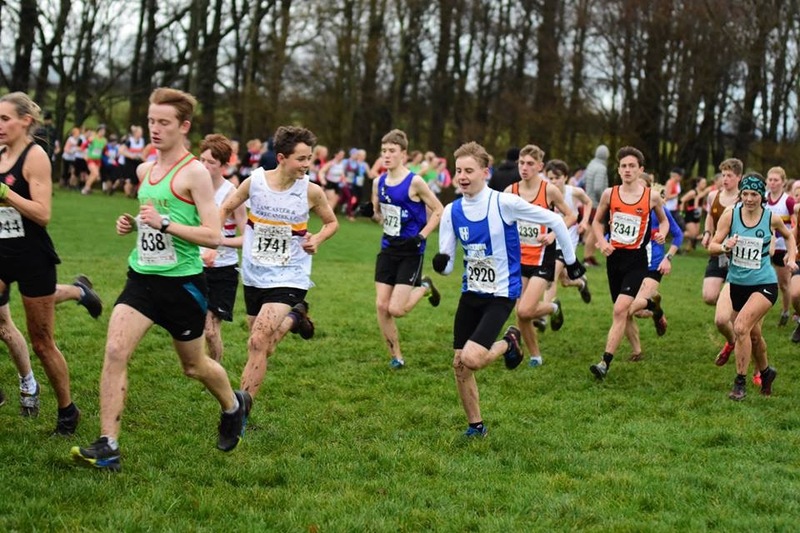 The stength of the team also lays in the number of young lads who are all really competitive and there were good runs from Jonathan Brindle in 16th place (11.21), Codie Dewhurst in 22nd (11.28), Saul Sharp (24th) in a time of 11.30, Harry Sambrook (27th) clocking 11.37 and new member and debutant – Ethan Lawrence – in 42nd spot (13.15). 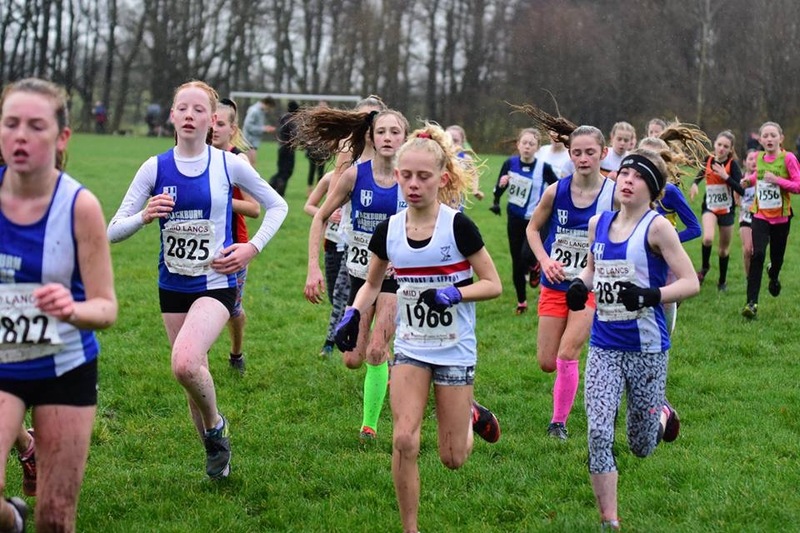 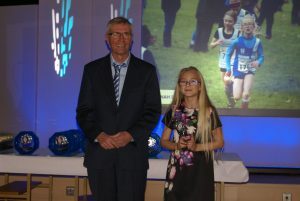 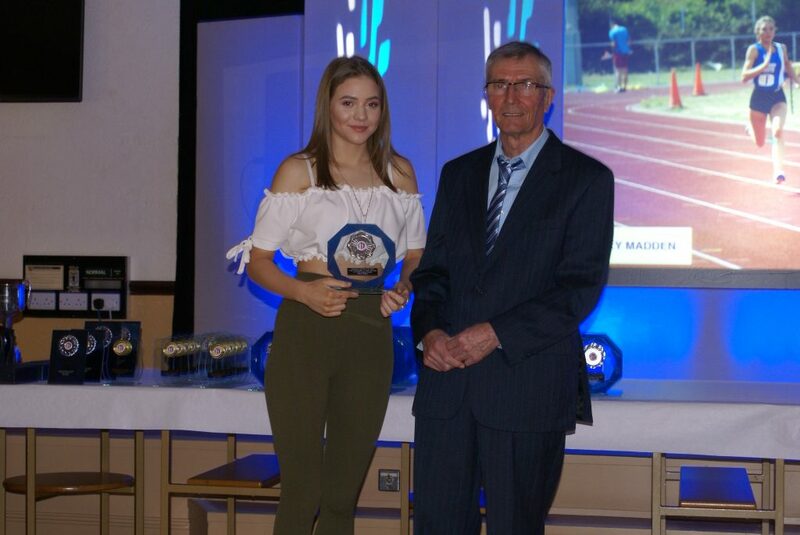 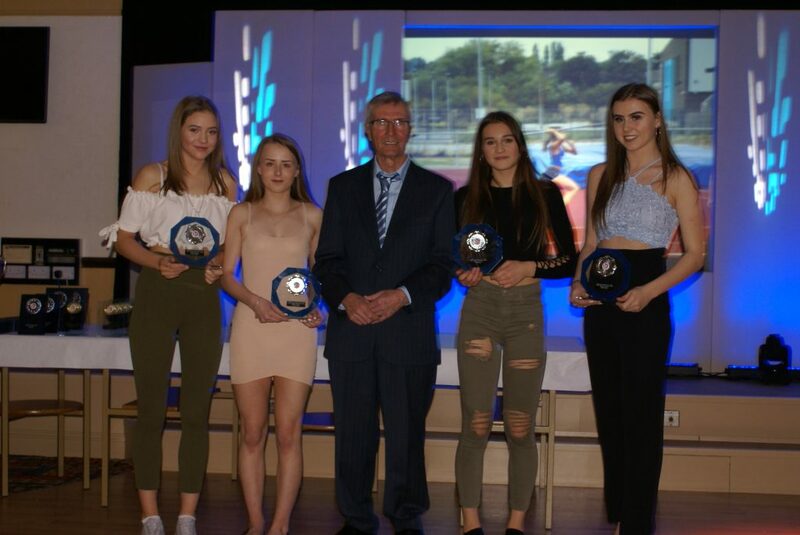 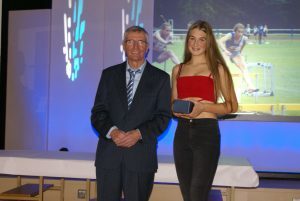 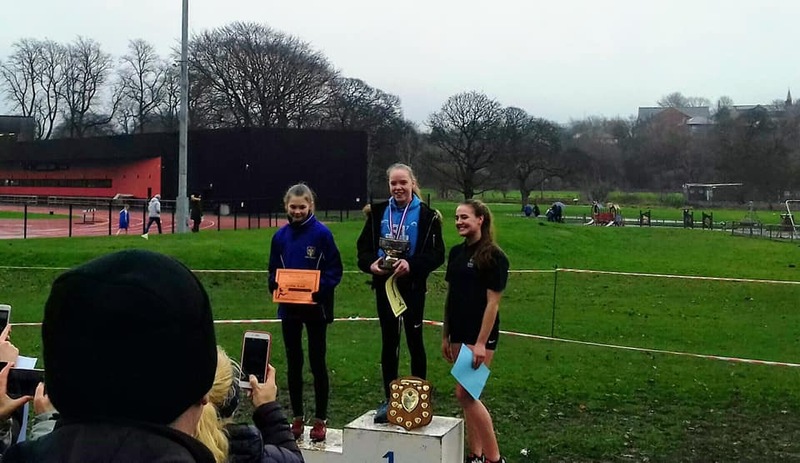 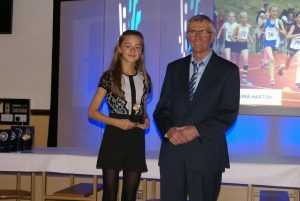 There was an impressive run from Eleesha Charnley in the U15 Girls Race which resulted in her coming home in 3rd place overall in a time of 11.22 which helped the Harriers win the Team race from Chorley AC & Tri. 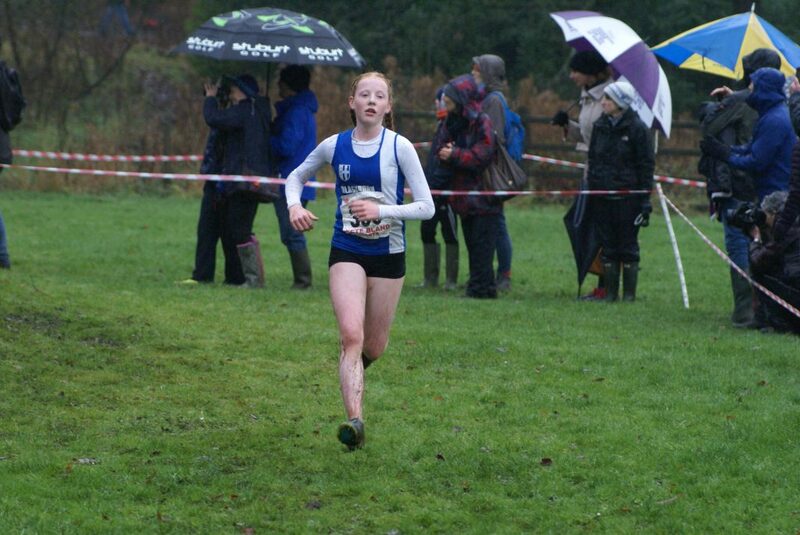 Leah Hoole in 12th with a time of 11.47 and Hollie Cubbon in 13th (11.58) were the three counters for the team win. 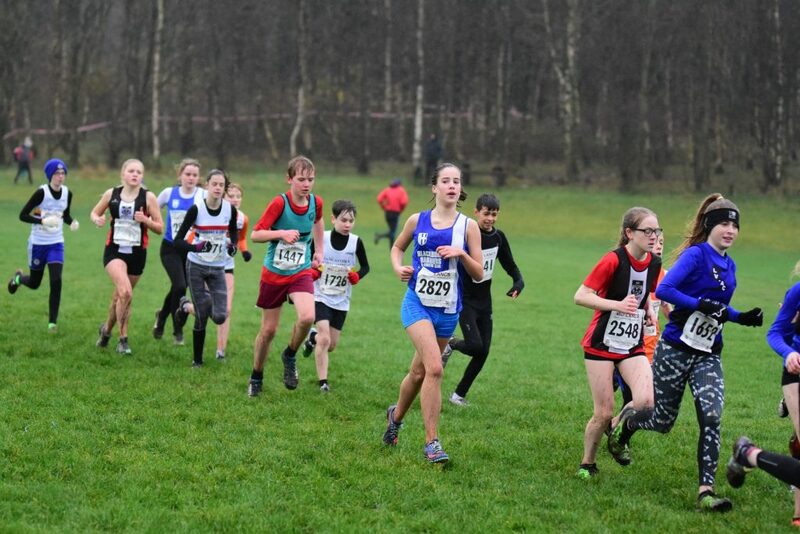 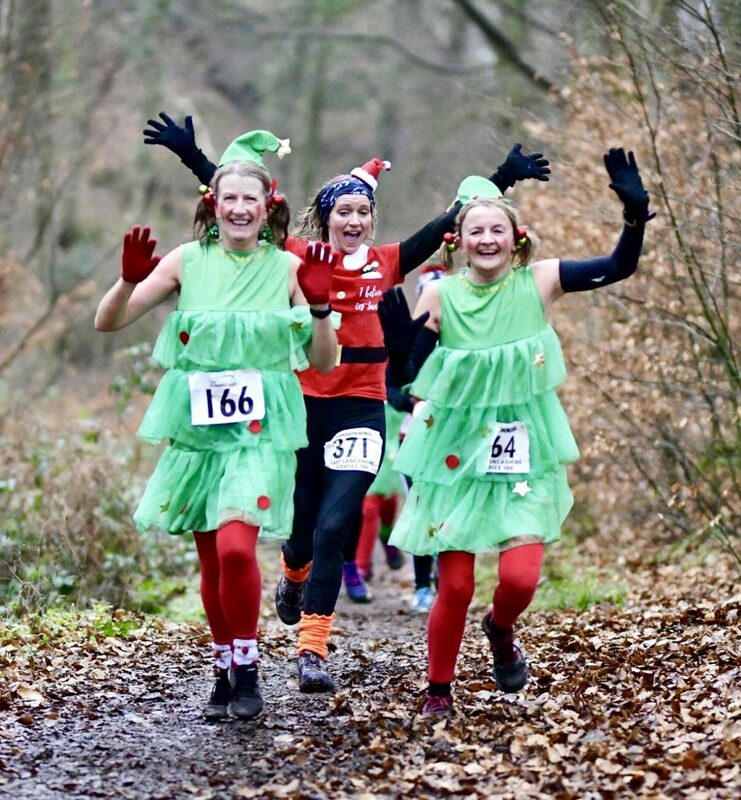 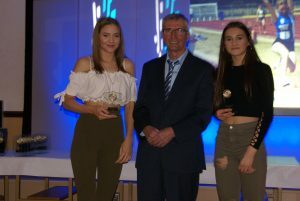 In 33rd spot came Rebecca Ramsden (13.08), with Molly Nicholls in 34th (13.32), new member and cross country debutant – Bella Durkin – in 35th place (13.34) and Eleanor Allsop in 37th (14.10). 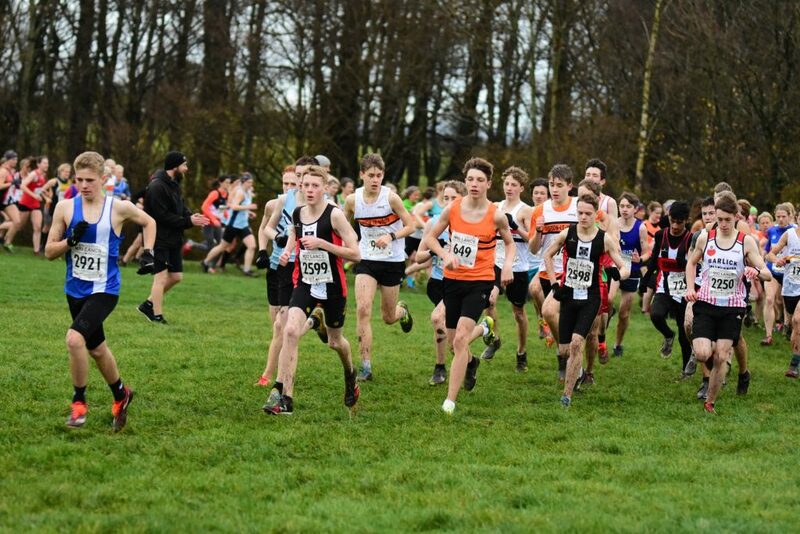 The U15 Boys placed 3rd in the Team race behind Lancaster and Liverpool with Hayden Mercer coming home as the first Harrier in 13th place clocking 10.18 with David Holman just two places and three seconds further back in 15th (10.21). 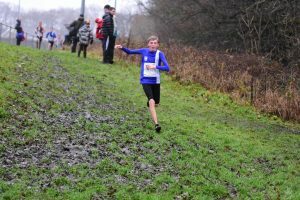 Kyle Taylor-Pomfret was the third Team counter in 20th spot (10.30) followed by George Whittaker in 22nd (10.34), Ethan Barbarewicz in 23rd place (10.43), Danny Woodcock in 27th (11.05), Sebastian Burton (28th) with a time of 11.12, Rory Teare in 35th (11.32) and Zach Walmsley (37th) with a time of 11.33. 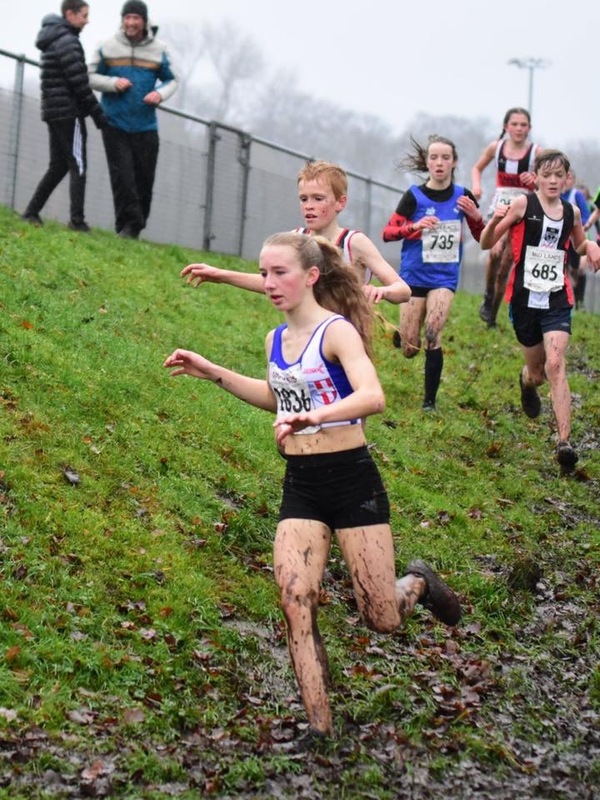 The U17 Women’s Race turned out to be short with just ten athletes competing which saw Amy Davies place 2nd in a time of 10.38, just two seconds behind the winner Charlotte Edwards (10.36). 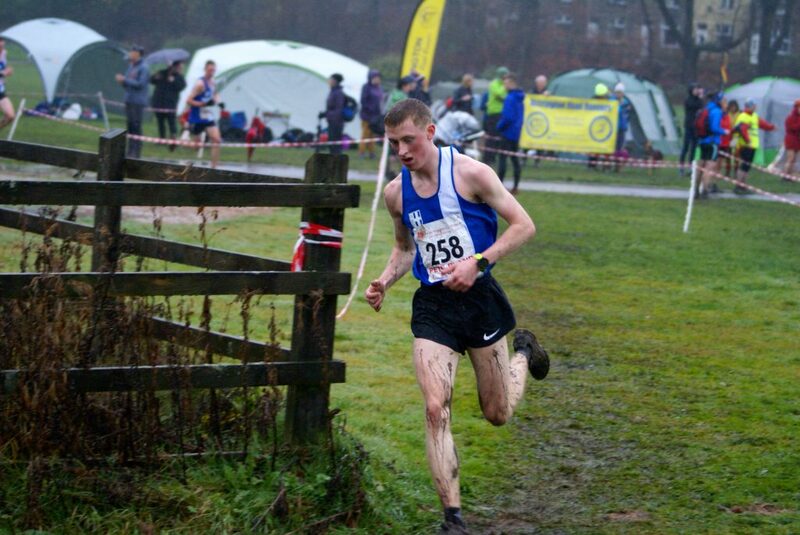 Matt Ramsden won the U17 Men’s Race the hard way. 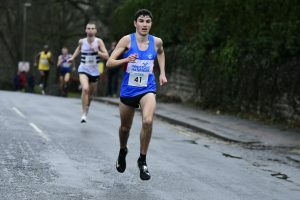 After being led to believe he had finished, he then had to rejoin the race having lost a number of places as a consequence, but fought back to still win the race in a time of 21.59. 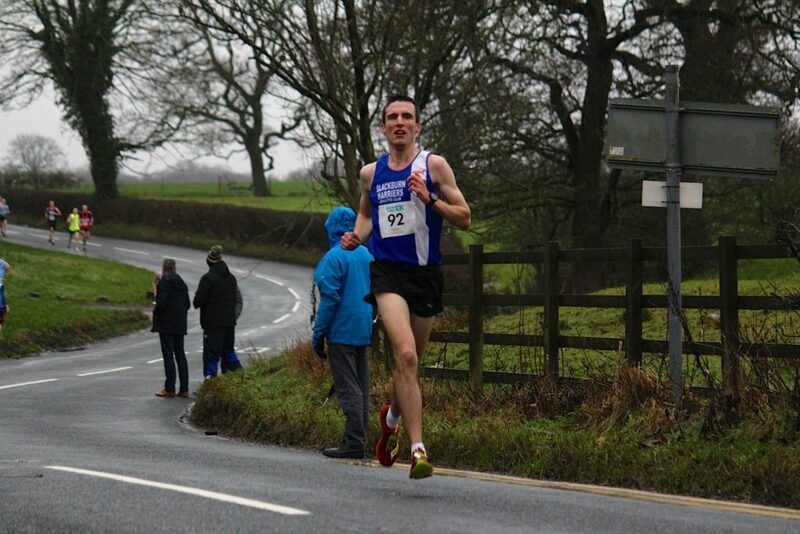 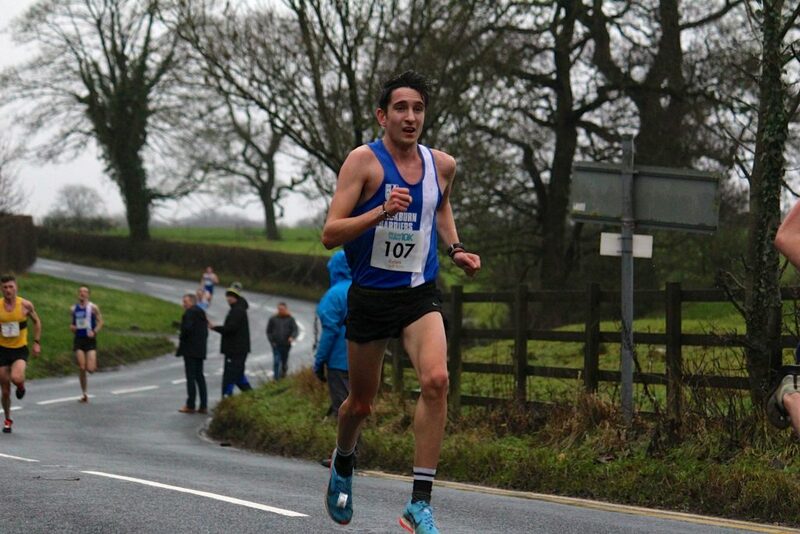 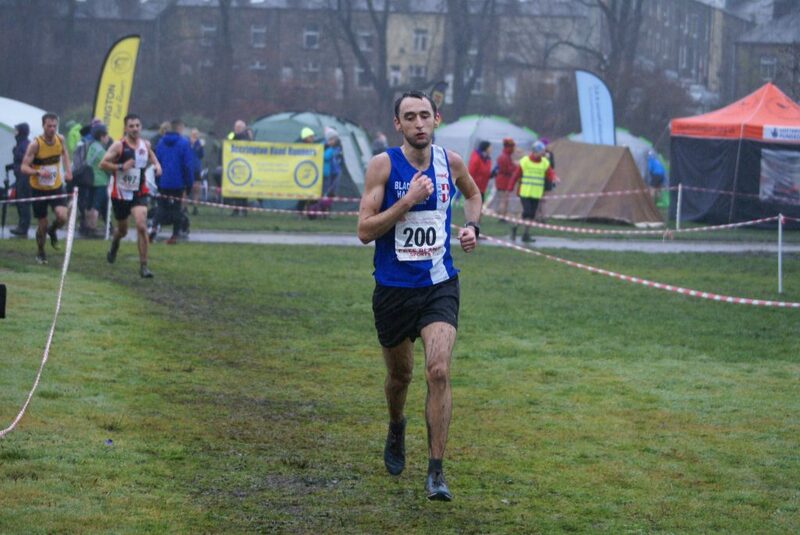 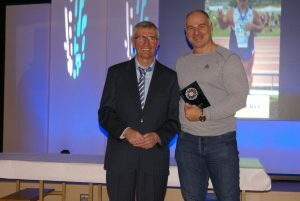 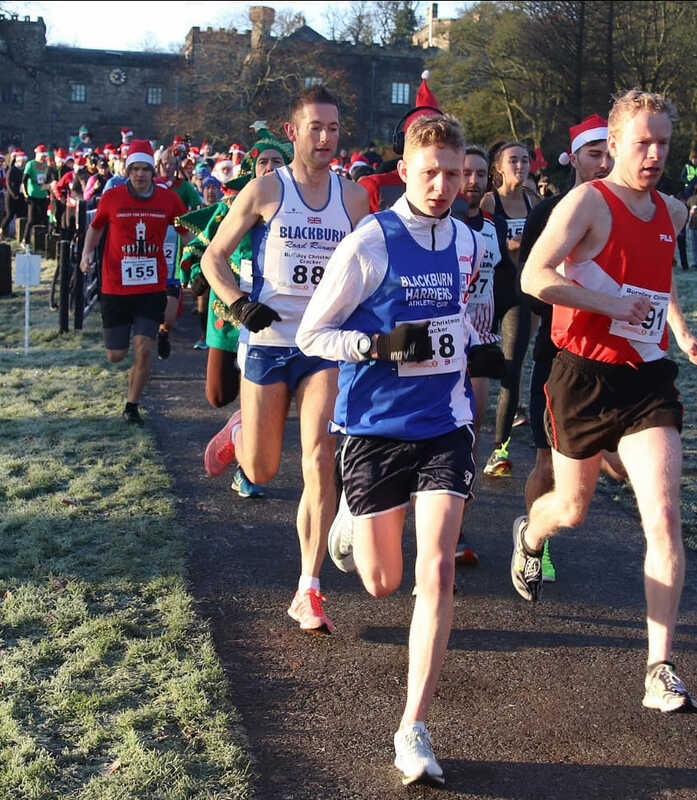 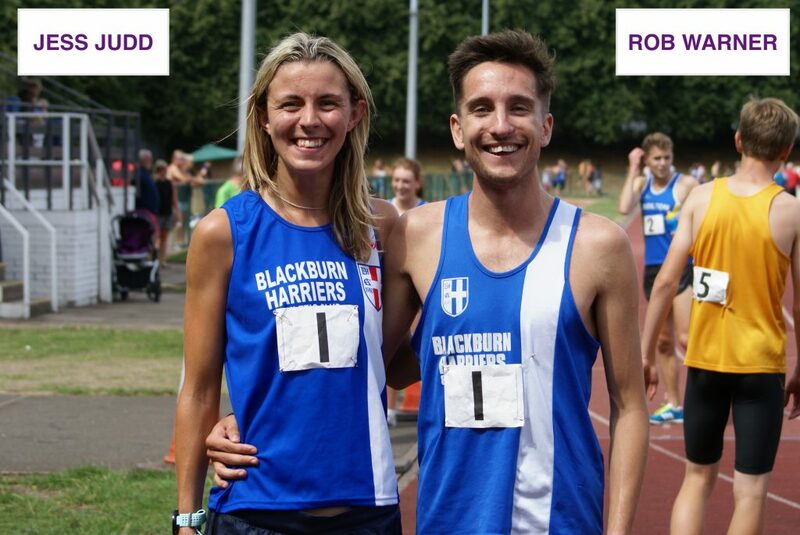 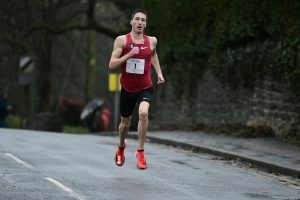 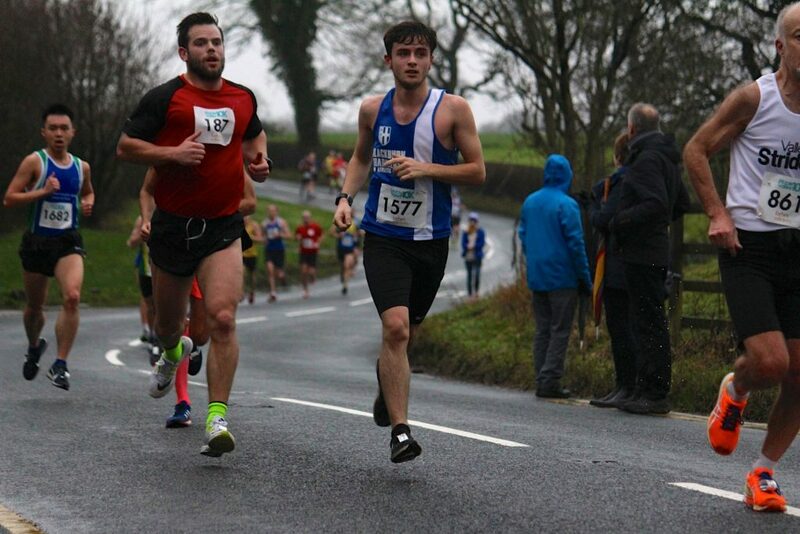 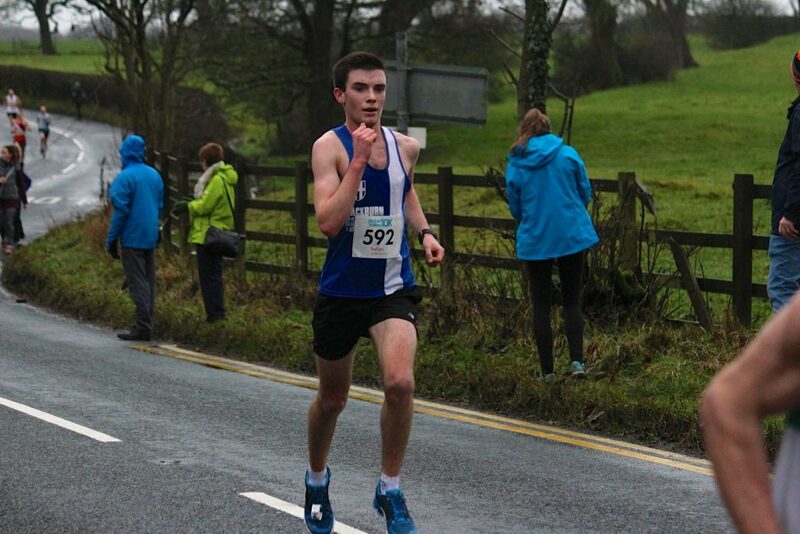 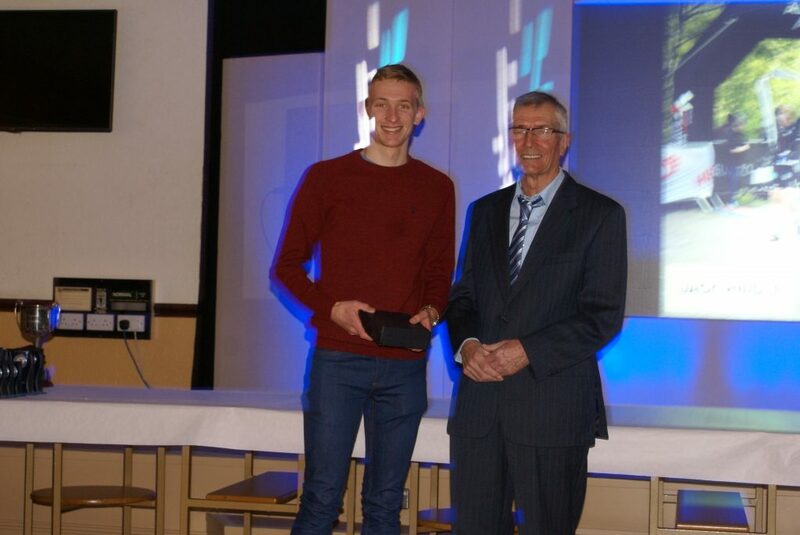 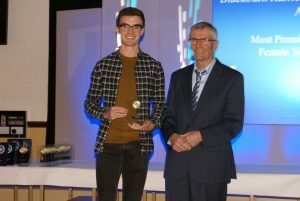 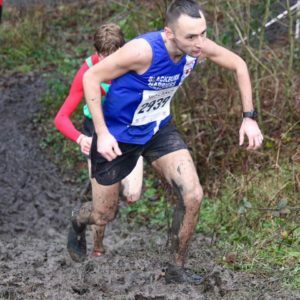 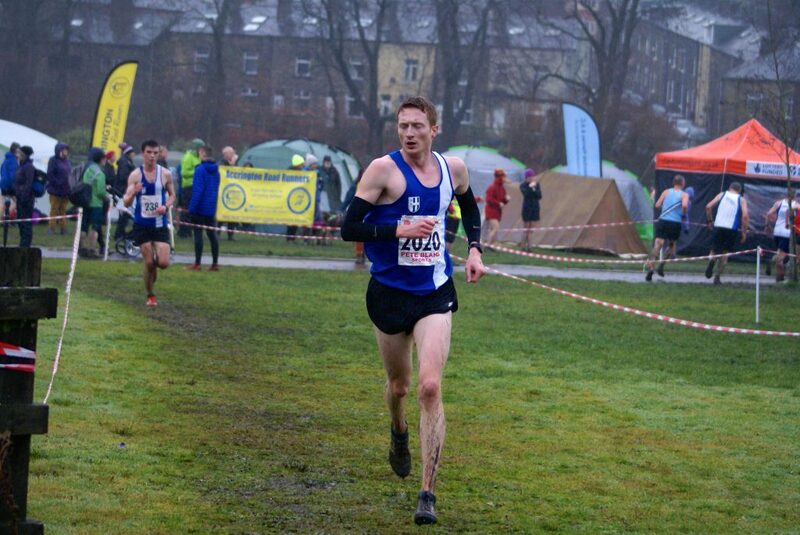 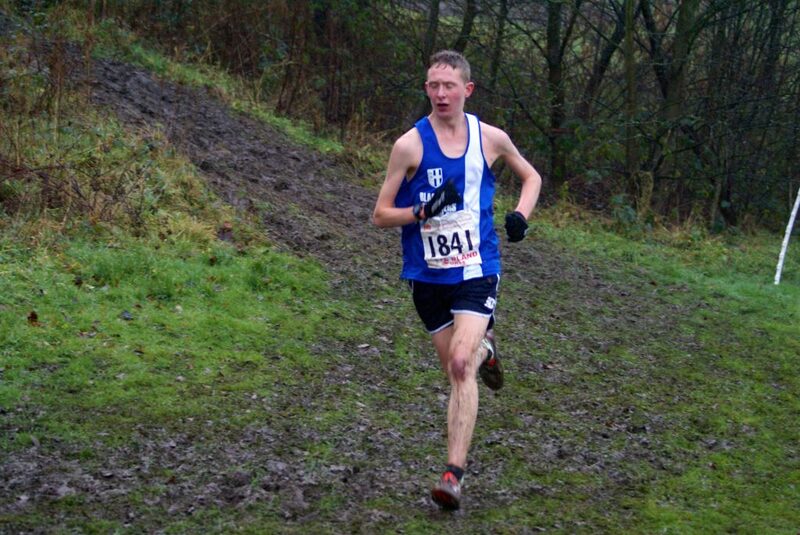 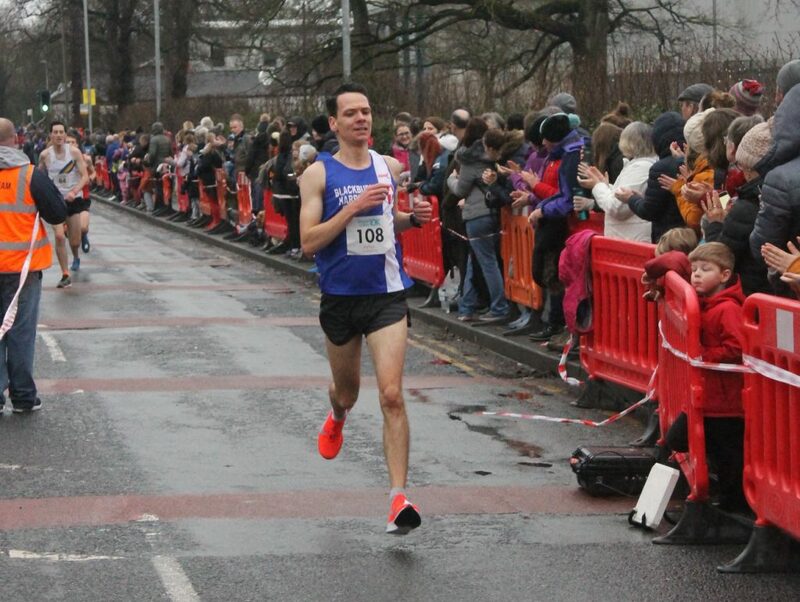 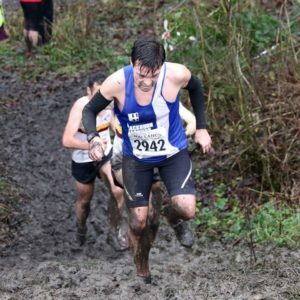 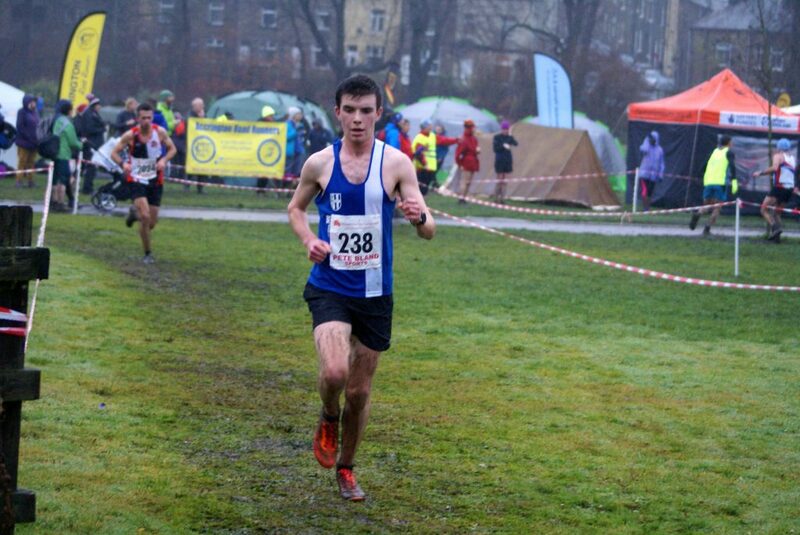 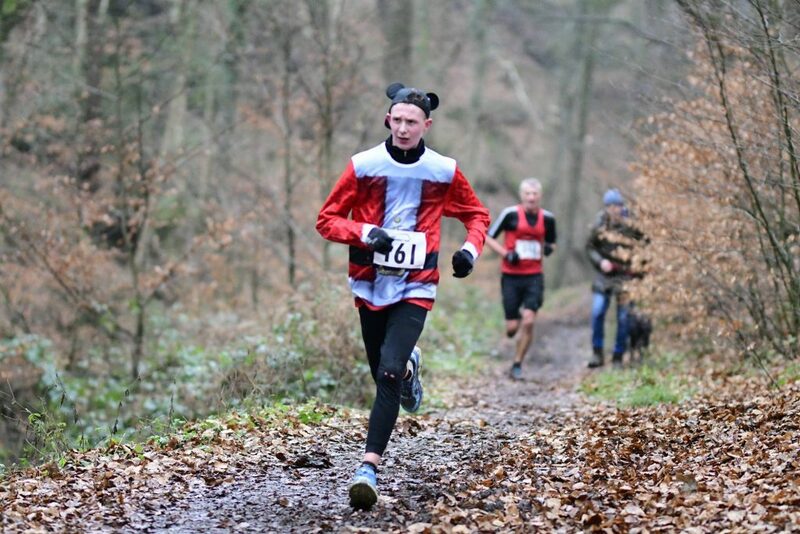 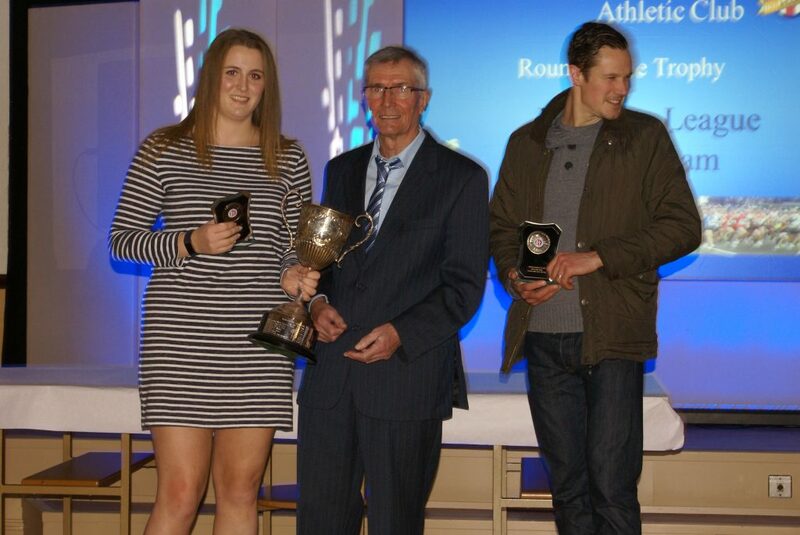 Sam Hodkinson who suffered in the same way as Matt finished 6th in 22.44 with Jamie Teare in 24th place (24.26) which saw the team finish on the same points – 32 – as second placed Rossendale and winners Lancaster (27). 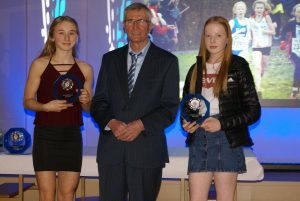 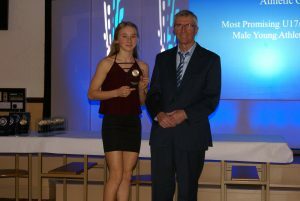 Maddie Elliott finished 2nd in the U20 Women’s race which featured just six runners, clocking 25.23 behind the winner – Eve Pannone. 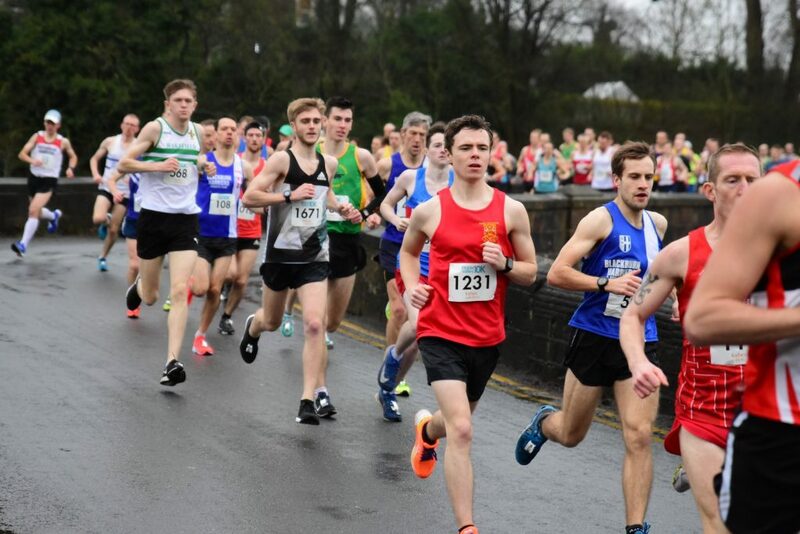 The U20 Men’s Race had slightly more runners – 14 in total – which was won by Nathan Dunn with Joe Gebbie having a very good run in 4th place (38.07) and Nicholas Smith in 8th spot (41.39). 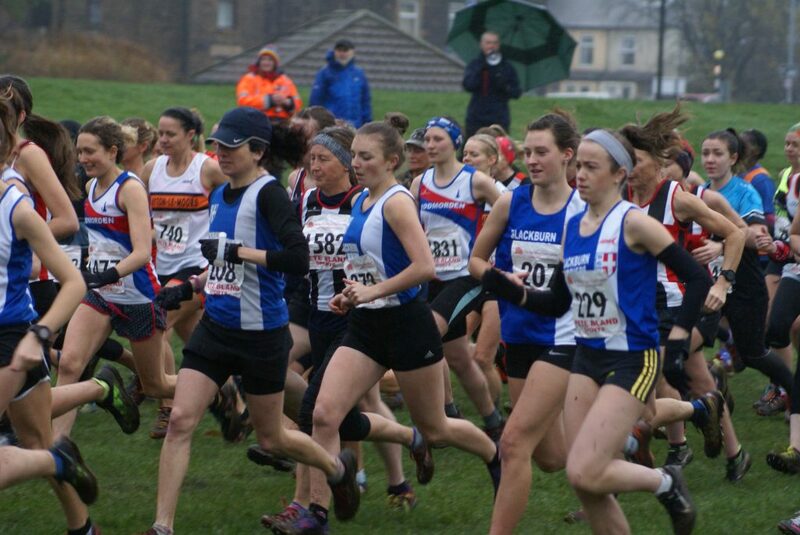 One hundred and forty four runners took part in the Senior Women’s Race. 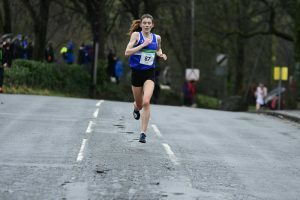 The Senior Women’s Team had concentrated on the Red Rose League and had won that League so only a few Harriers out at the Mid Lancs which saw the three counters Katie Buckingham having another very strong race as she came home in 8th place overall clocking 24.04 and just one place behind Annabel Mason from Border. 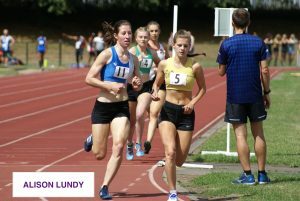 Maddie Elliottt was the 2nd counter in 11th place (25.23) with Lindsay Davies the third in 42nd position in a time of 28.15. 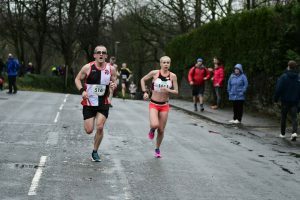 Like the Senior Women, the Men’s Senior Team had concentrated on the Red Rose League which they also won and although there was quite a number of the team not running, they still managed to pull off the Team win from Lancaster in 2nd and Preston in 3rd. 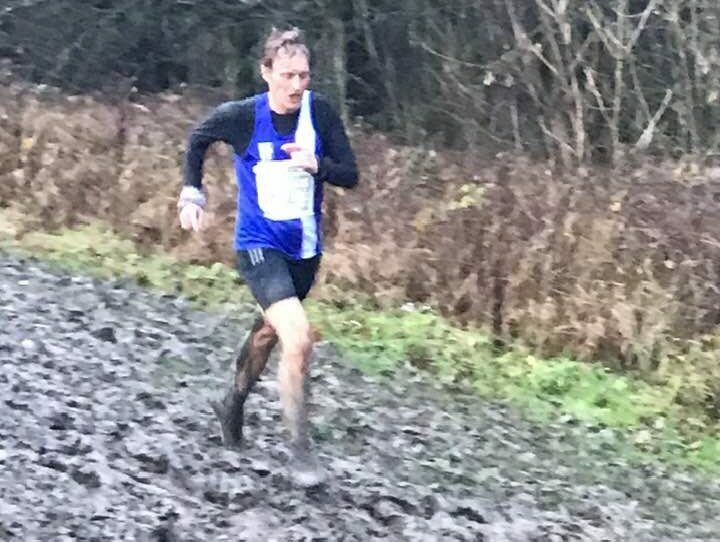 Daniel Collinge lead the team home in 5th place with a time of 36.36 with fast finishing Tom Blaney in 8th place (37.08) and similarly Marc Hartley in 10th (37.29). 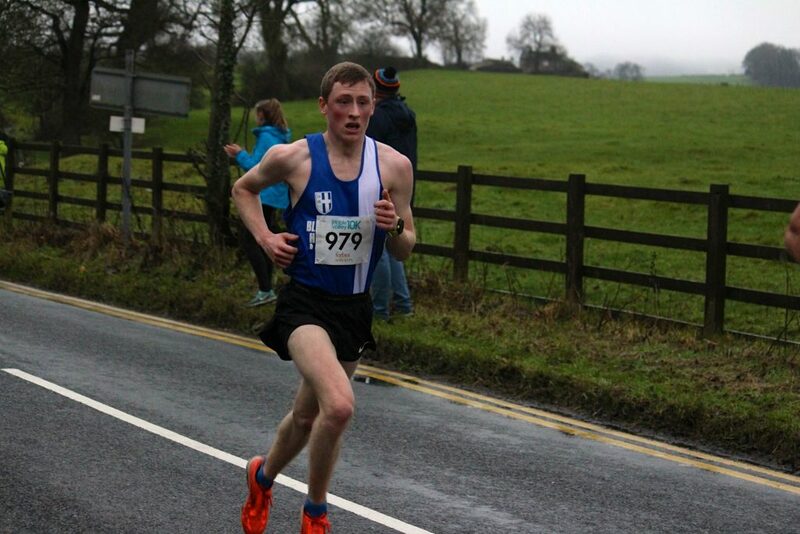 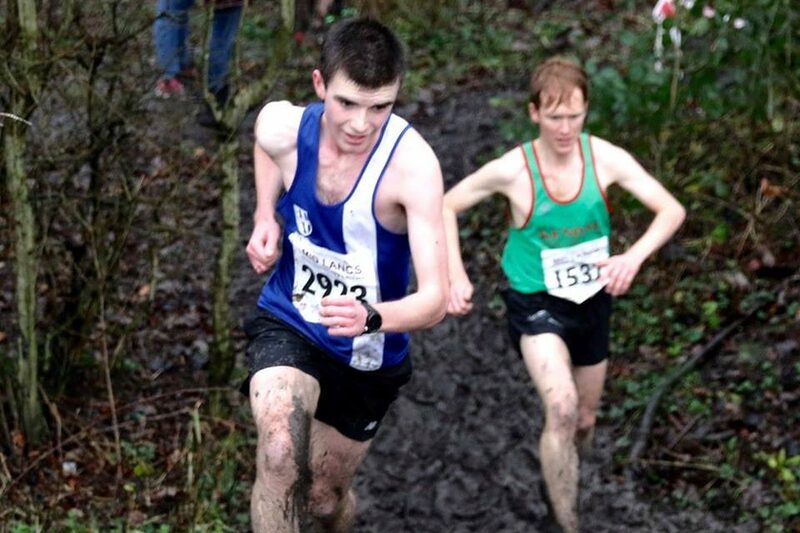 Joe Gebbie was running in only his second Senior Men’s race and had a very good run in 16th place (38.07) with Calum Holmes an equally good run in 18th place clocking 38.28. 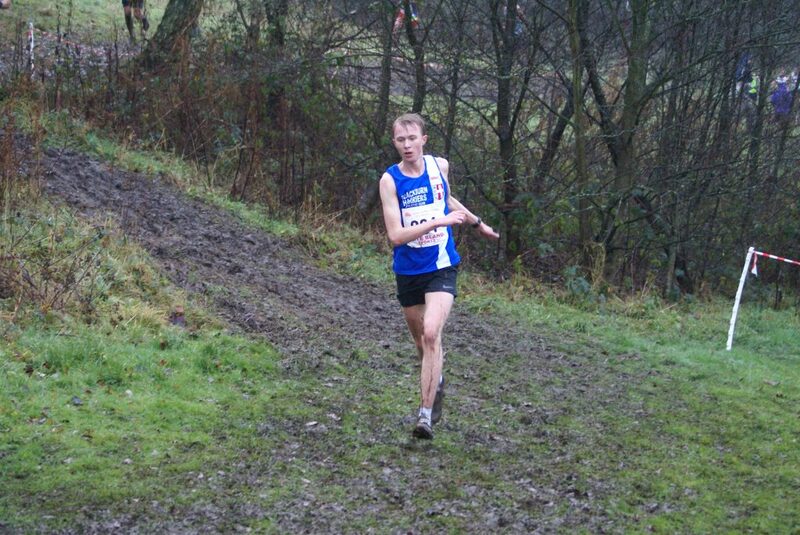 Chris Davies made it our 6th counter in the top 20 places as he placed 20th in a time of 38.37. 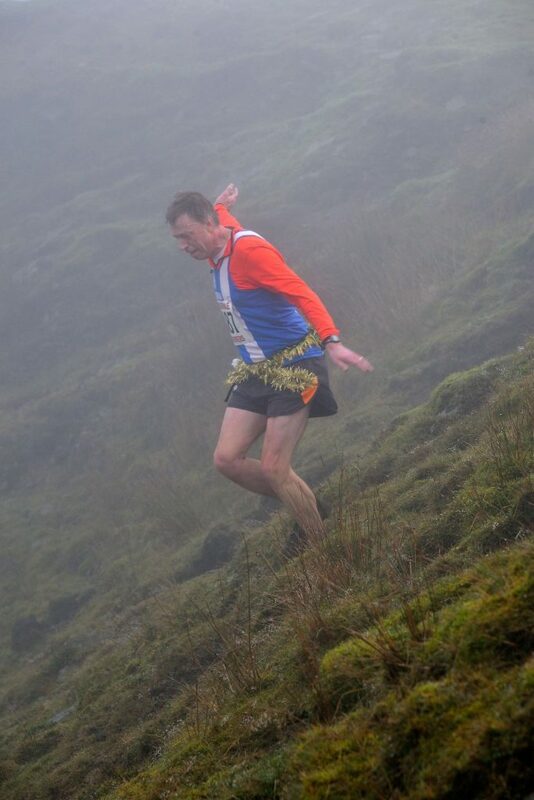 Mark Chippendale had another good run to place 27th overall in a time of 39.52 – a run which won him the V50 category. 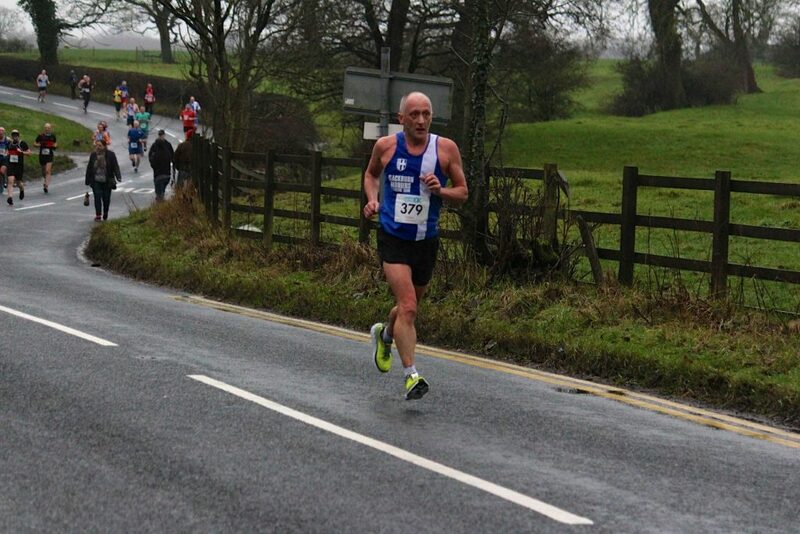 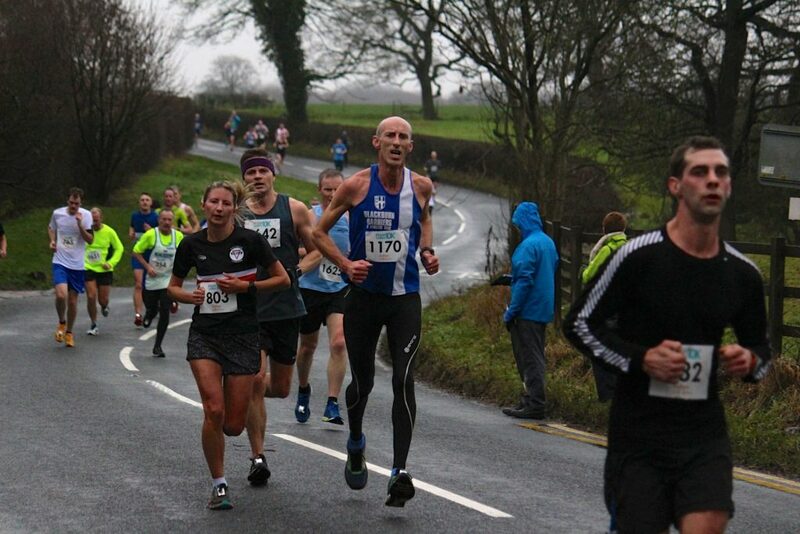 Next home was Nicholas Smith in 48th place out of a field of 243, with a time of 41.39, followed in by V50 Chris Balderson in 94th (44.59), Danny Teare (178th) in 51.39 and Allan Hartley in 204th (55.06). 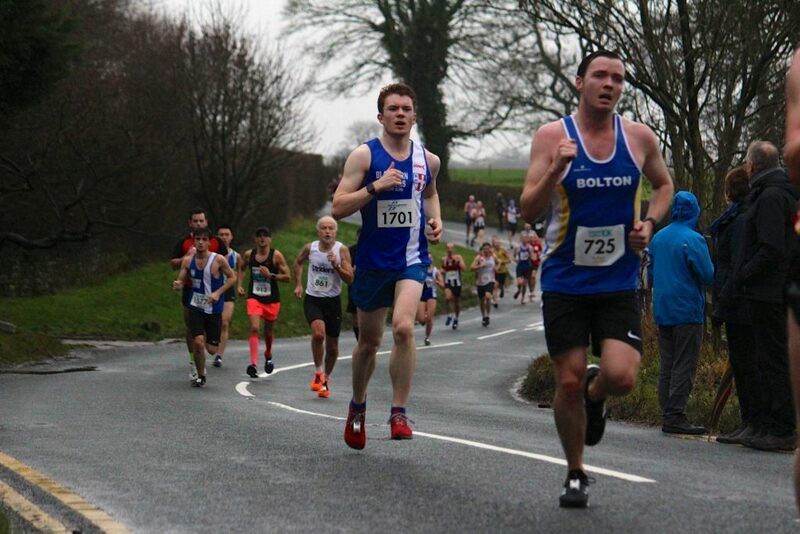 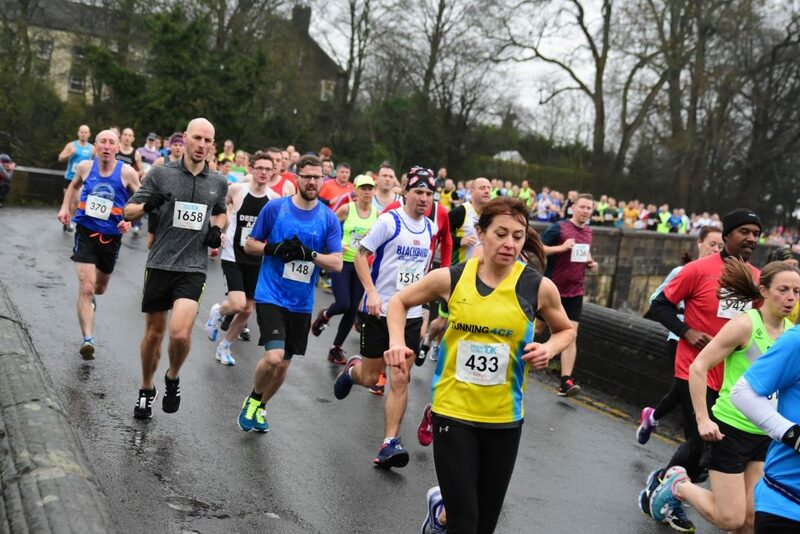 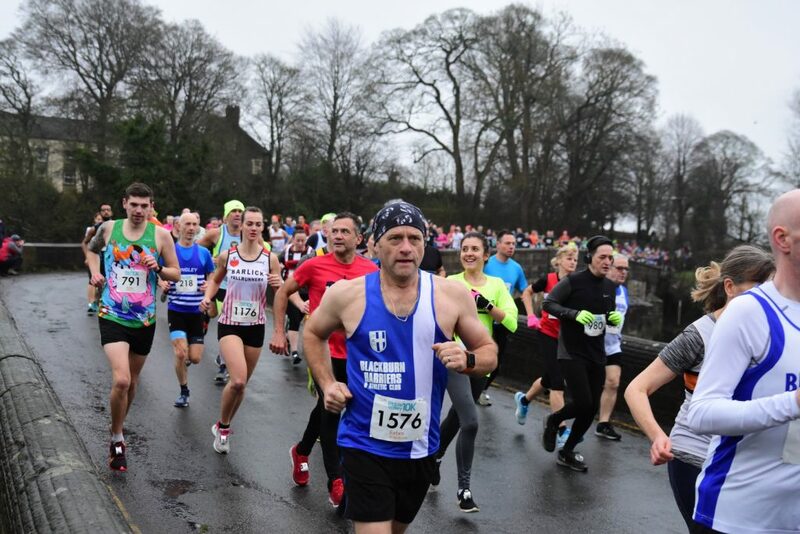 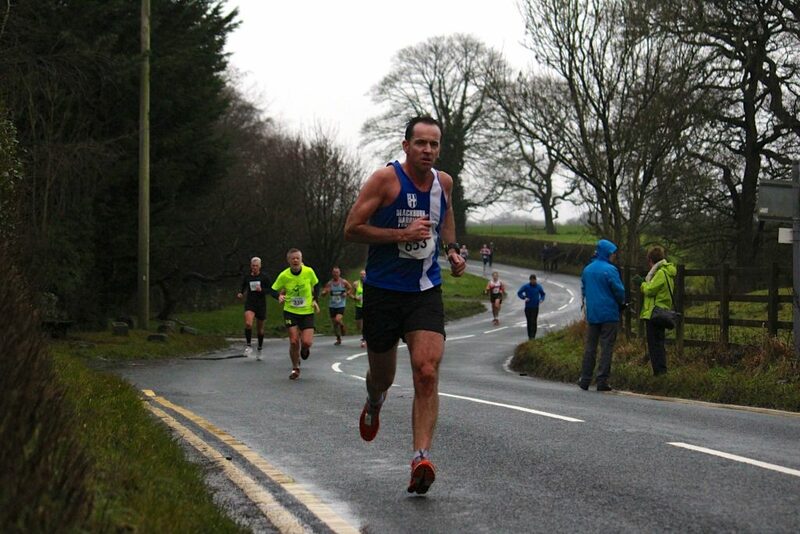 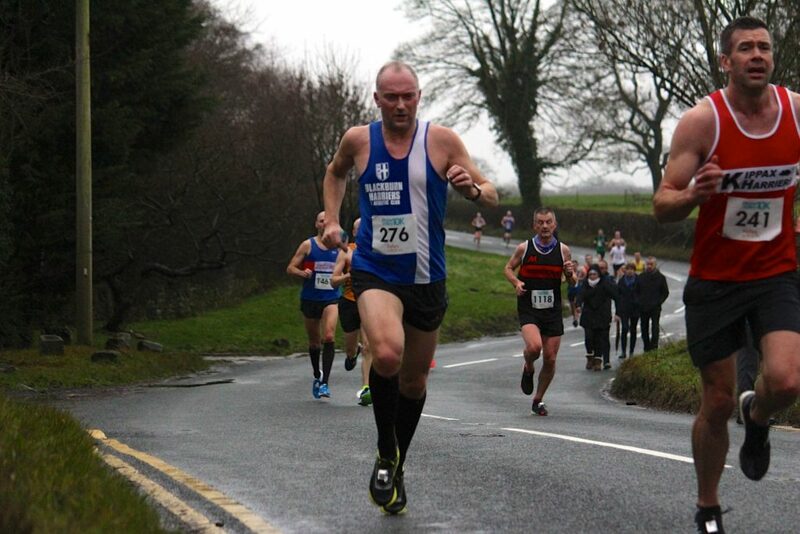 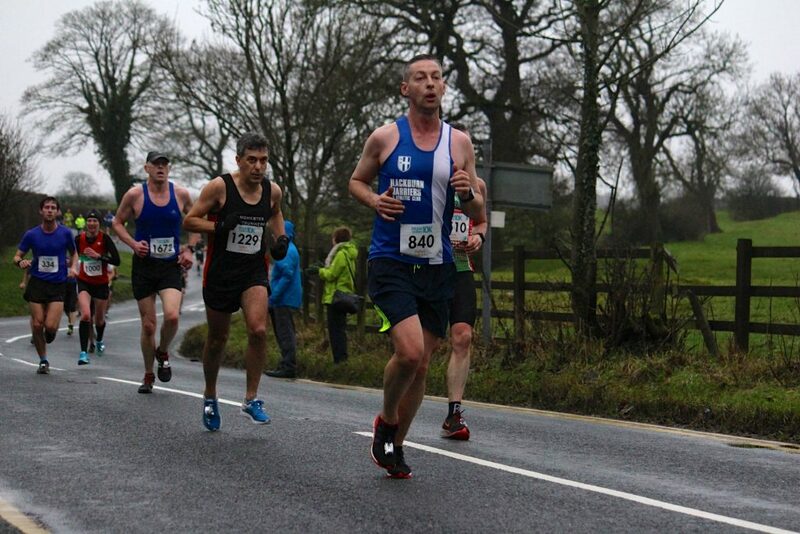 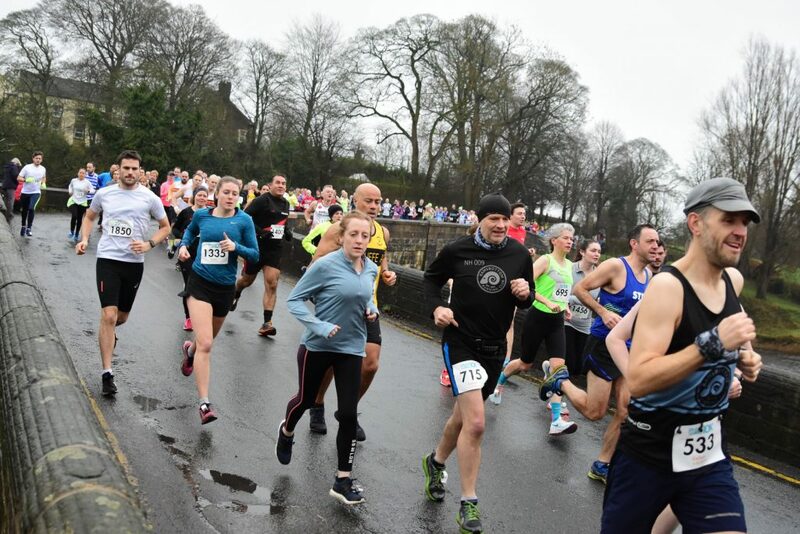 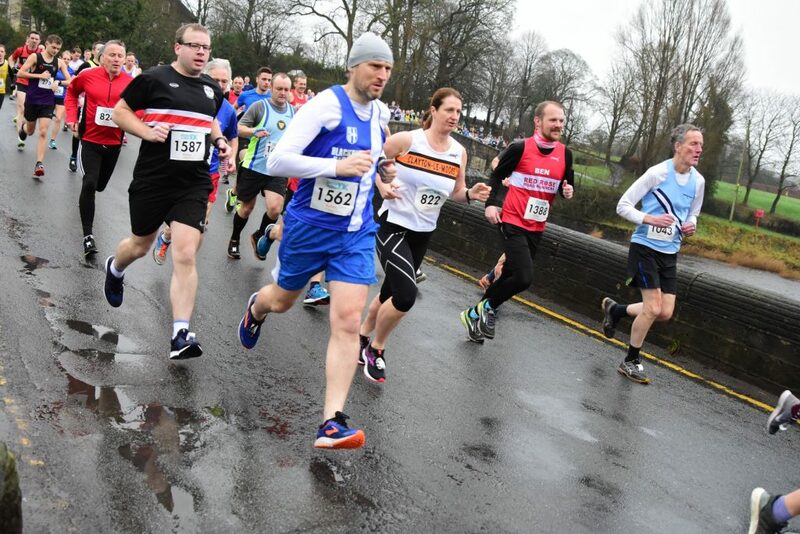 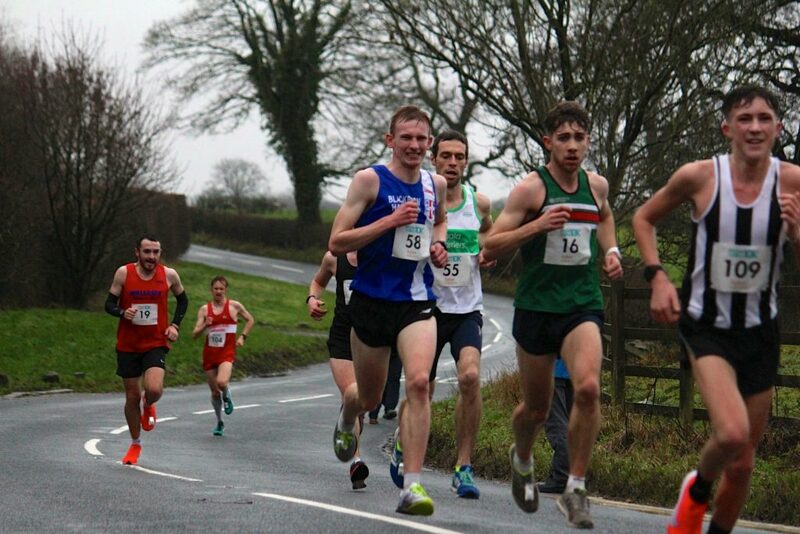 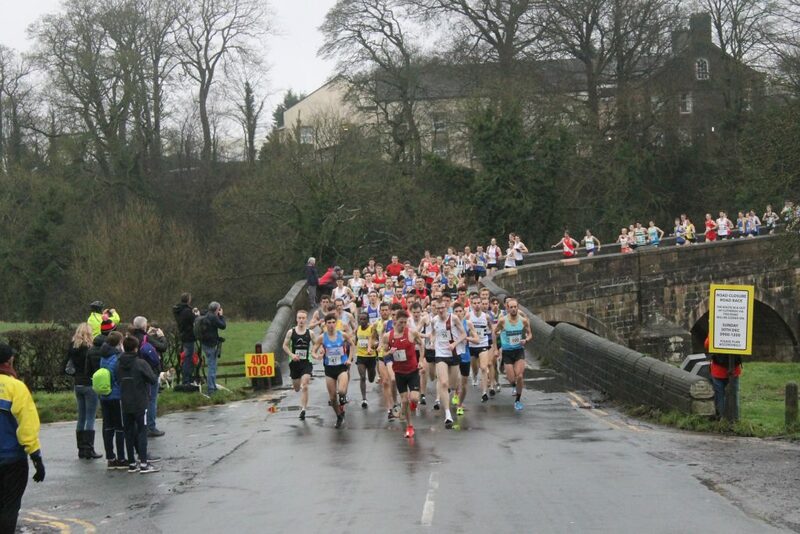 Four hundred and eleven runners in the Longridge 7 – a race which has been held annually for quite a number of years now and continues to attract large fields.